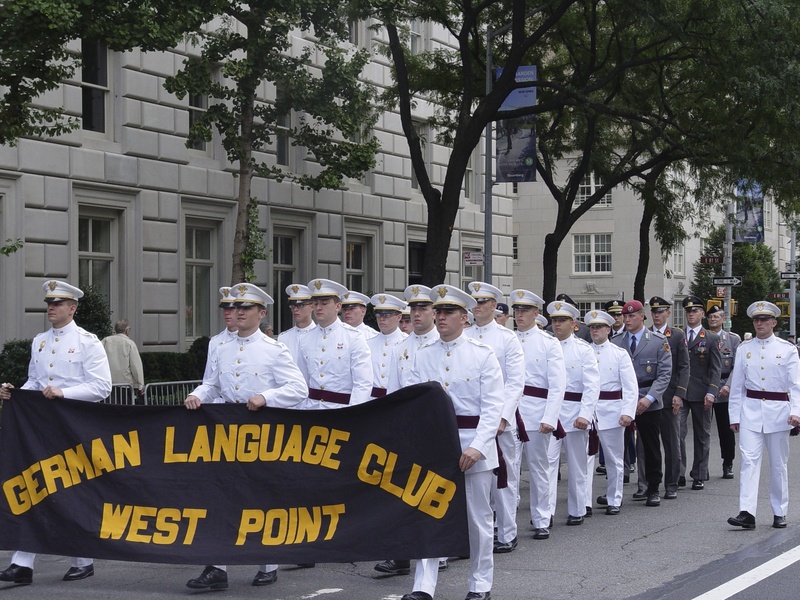 The first leg of the big dual parade weekend started with one of the most polite parades of the year. 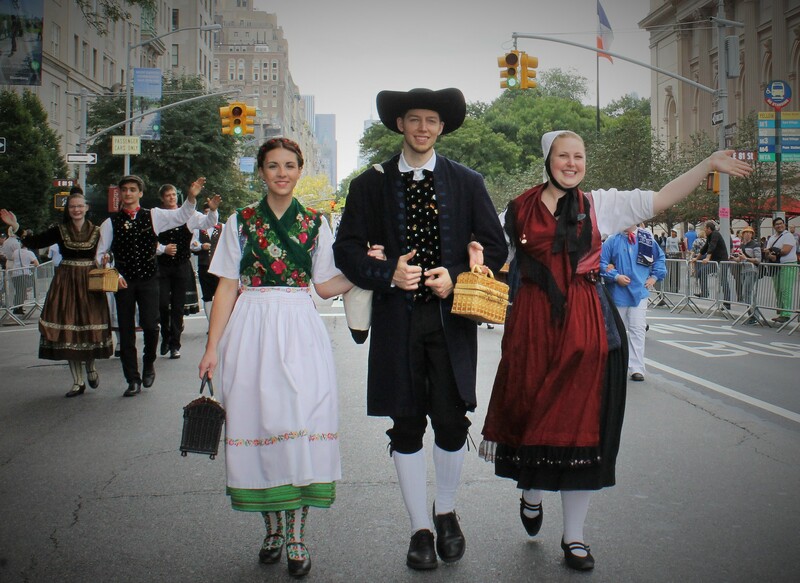 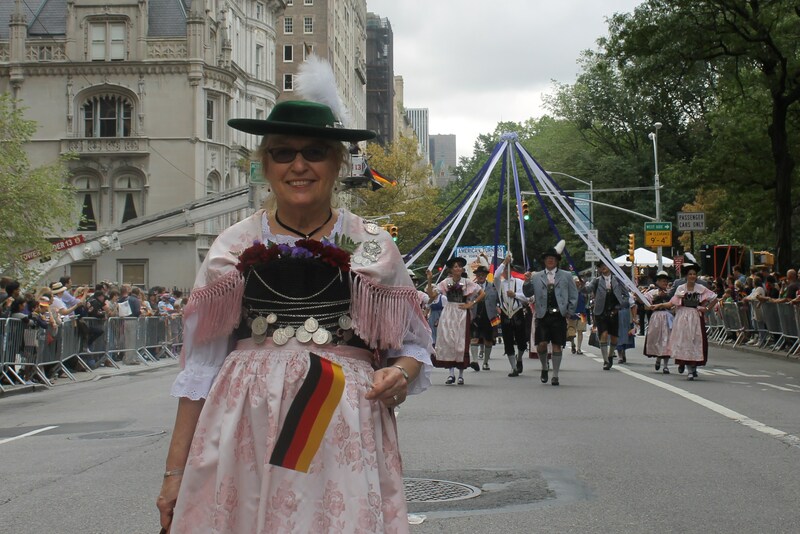 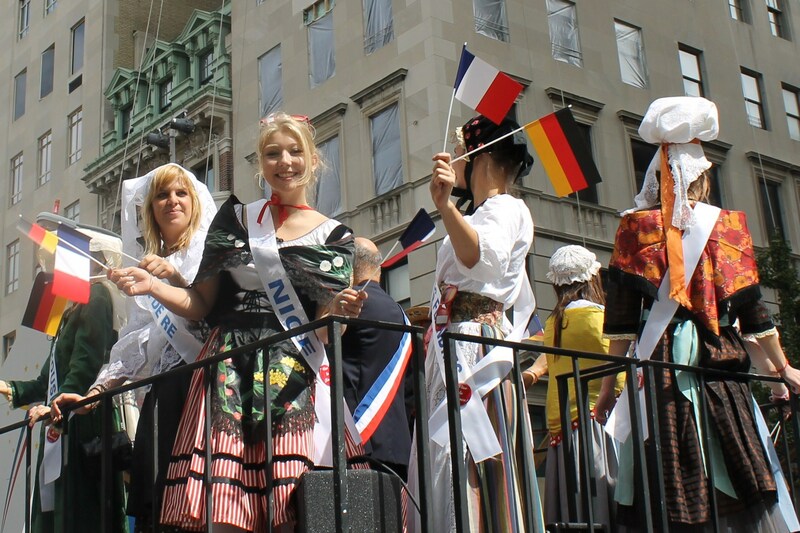 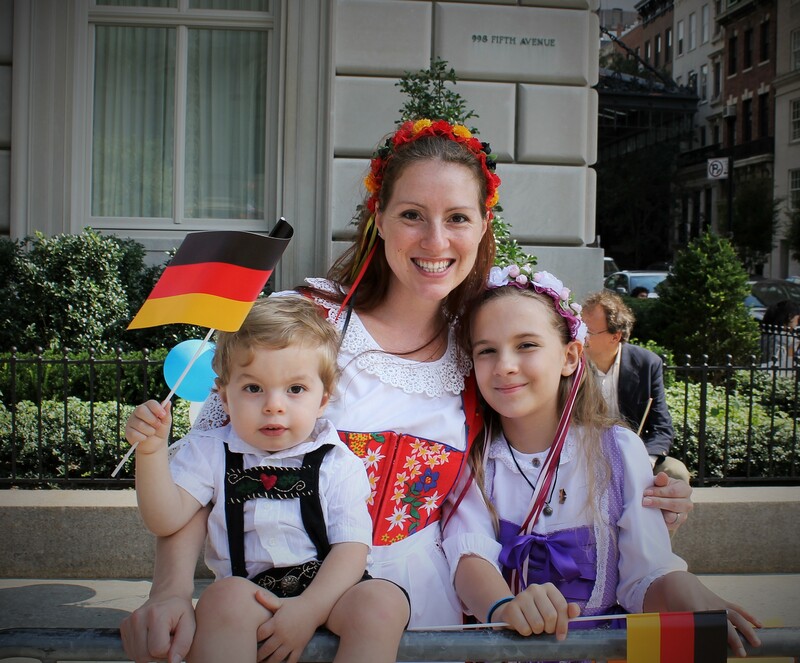 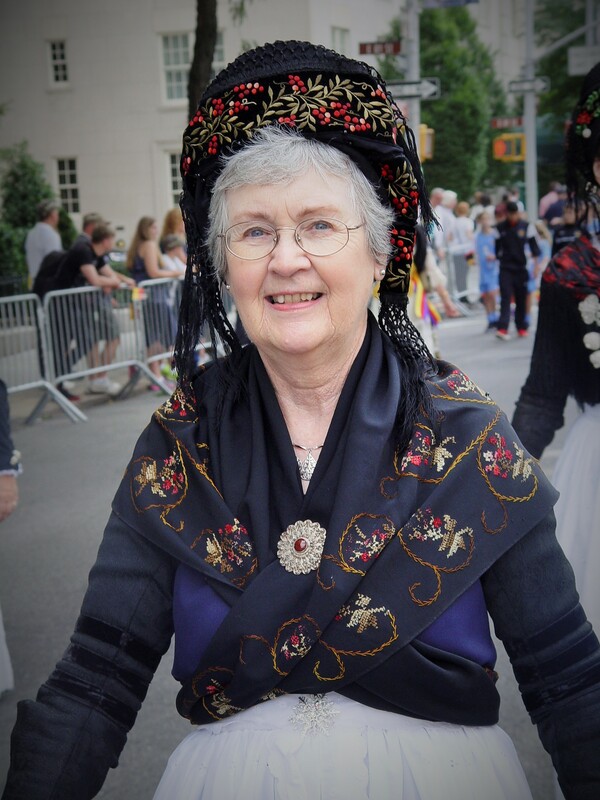 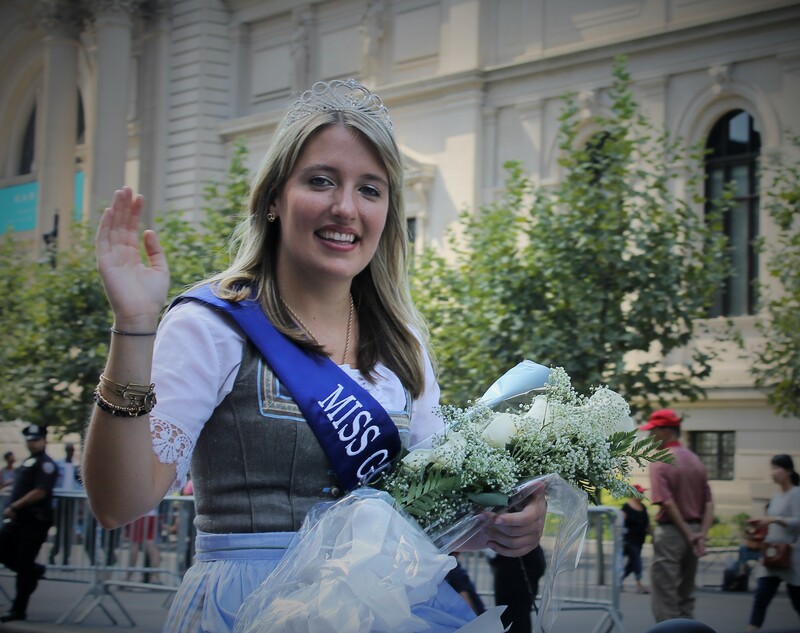 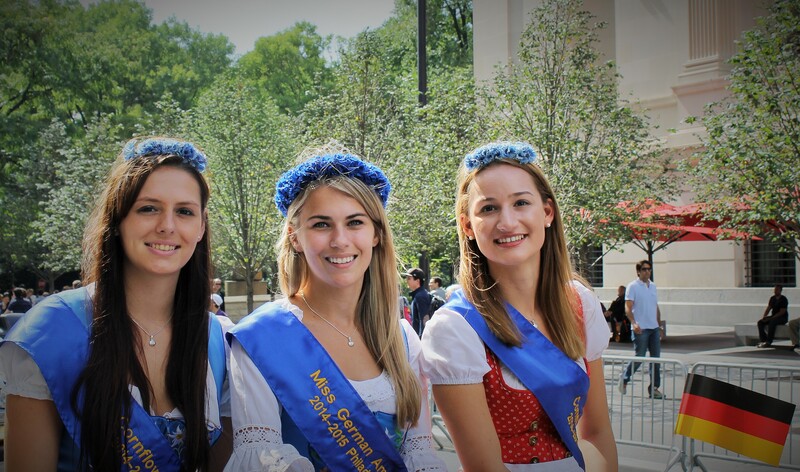 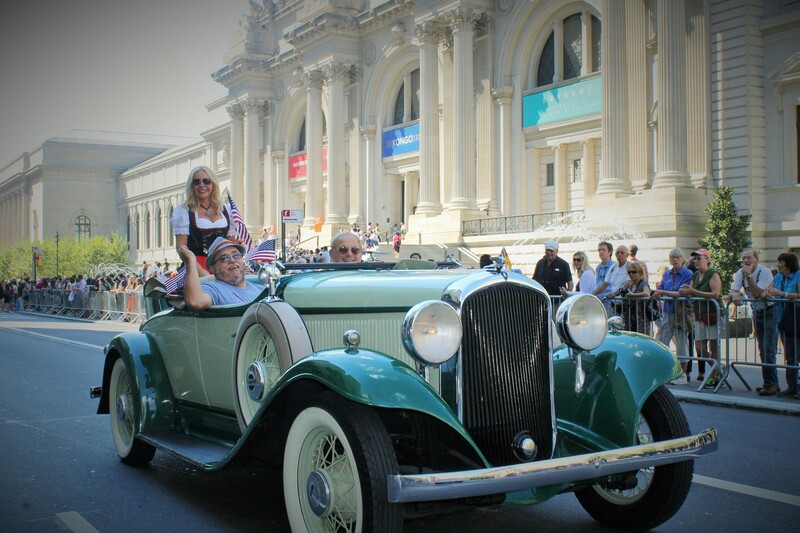 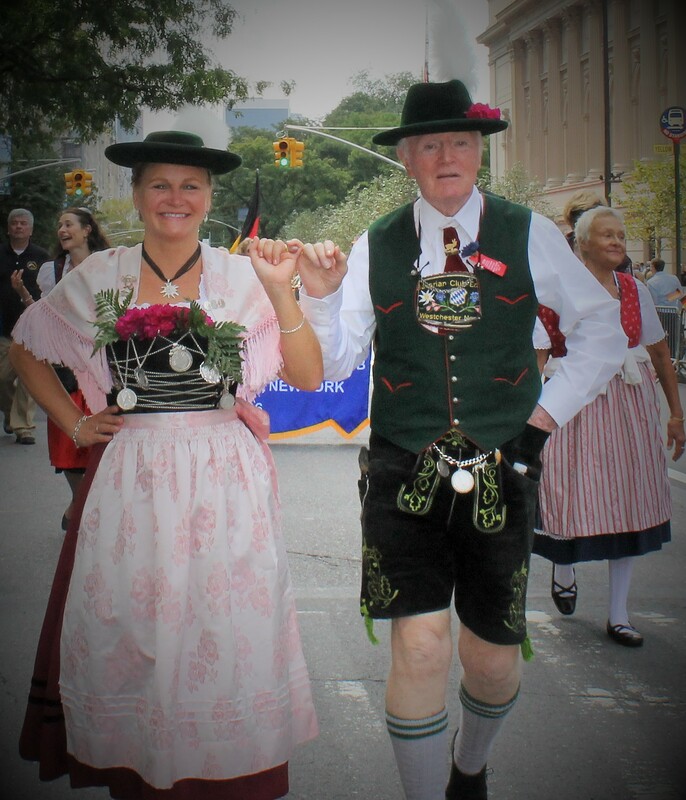 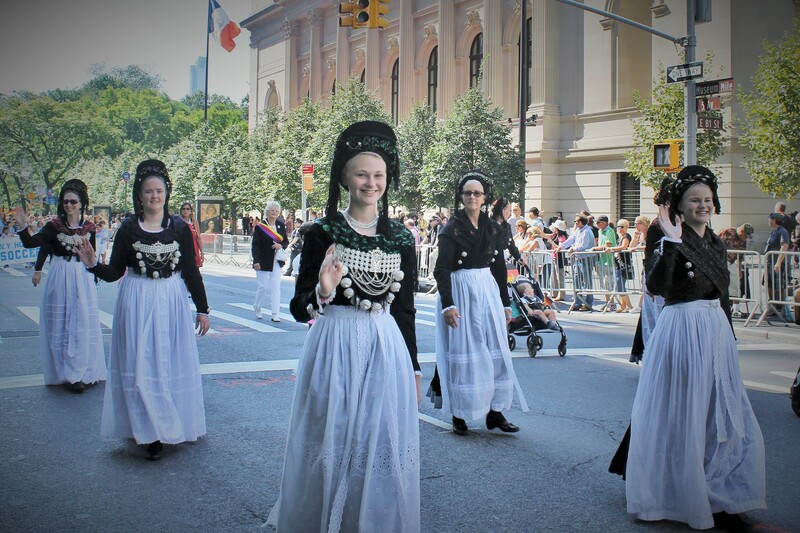 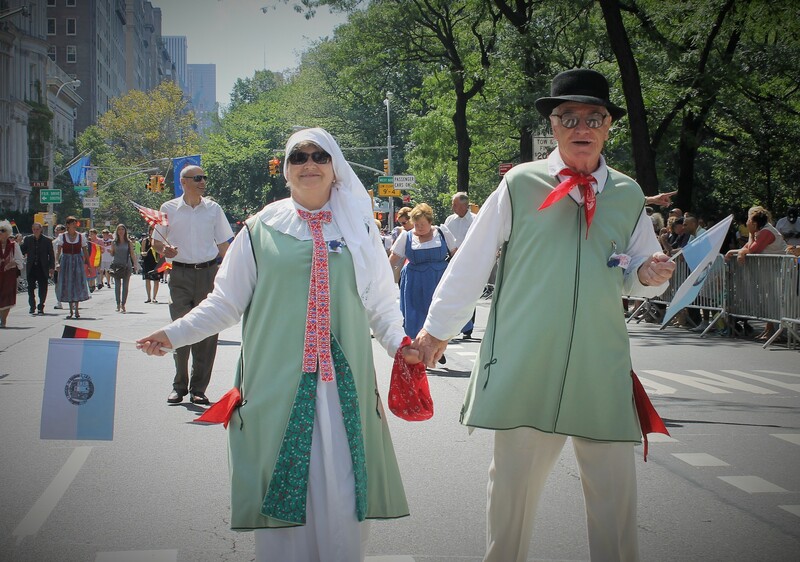 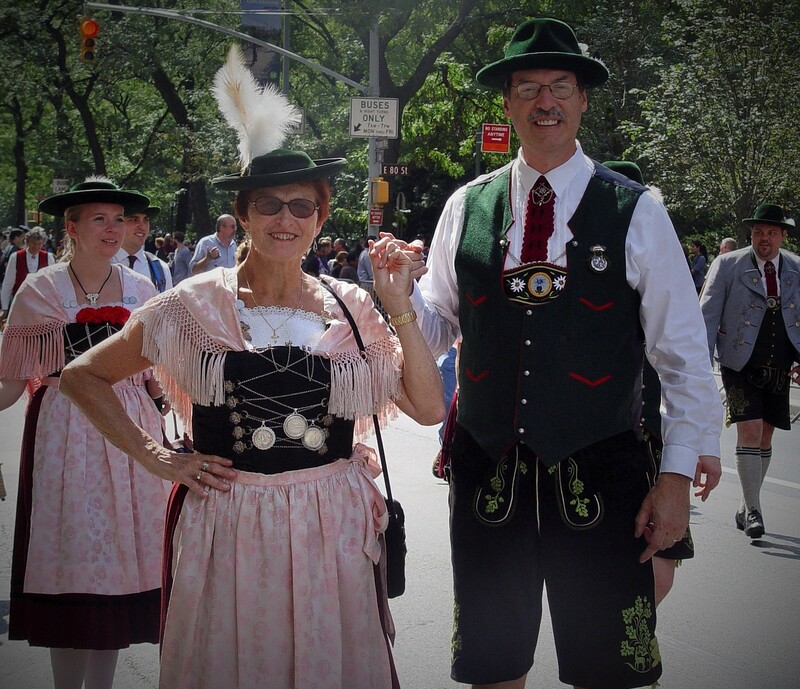 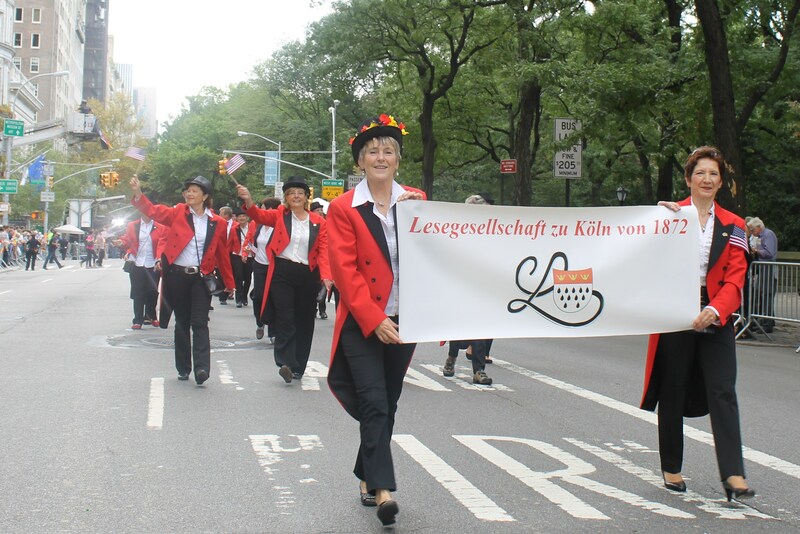 German Americans from the tri state area came out in droves to cheer on their compatriots visiting from all parts of Germany for a grand celebration of German culture and contribution to the fabric of NYC. 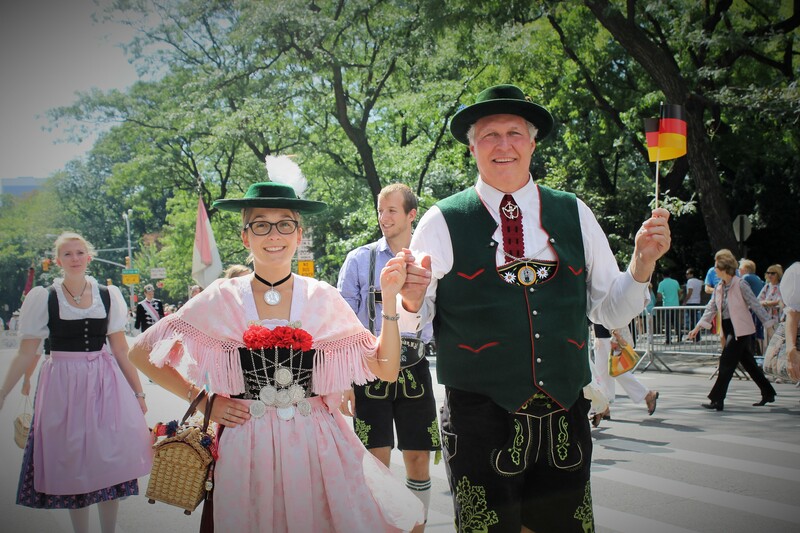 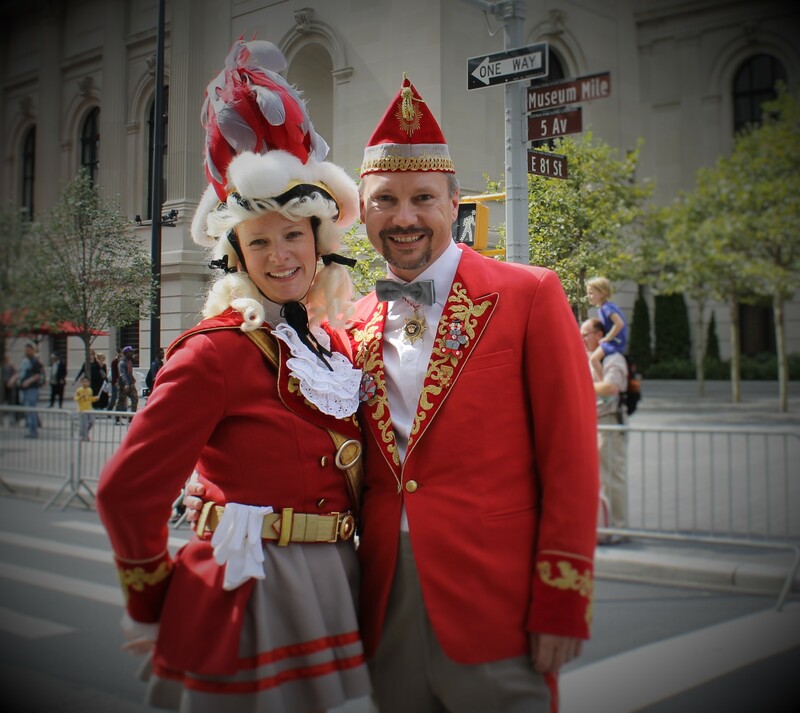 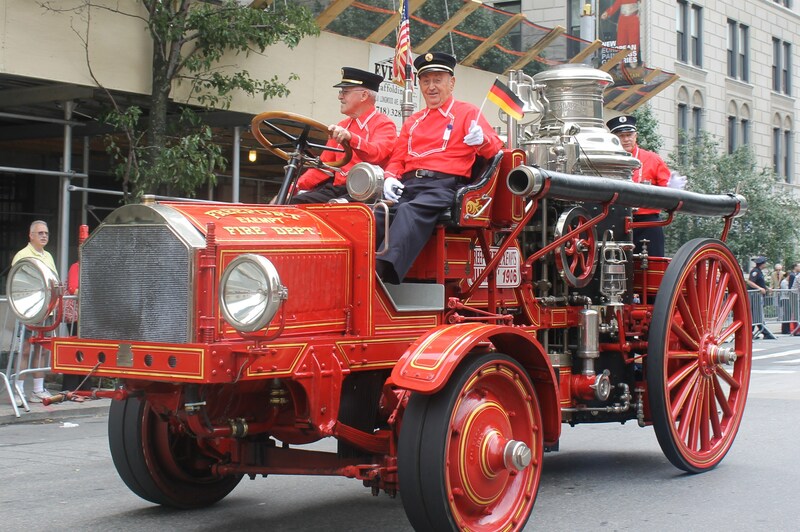 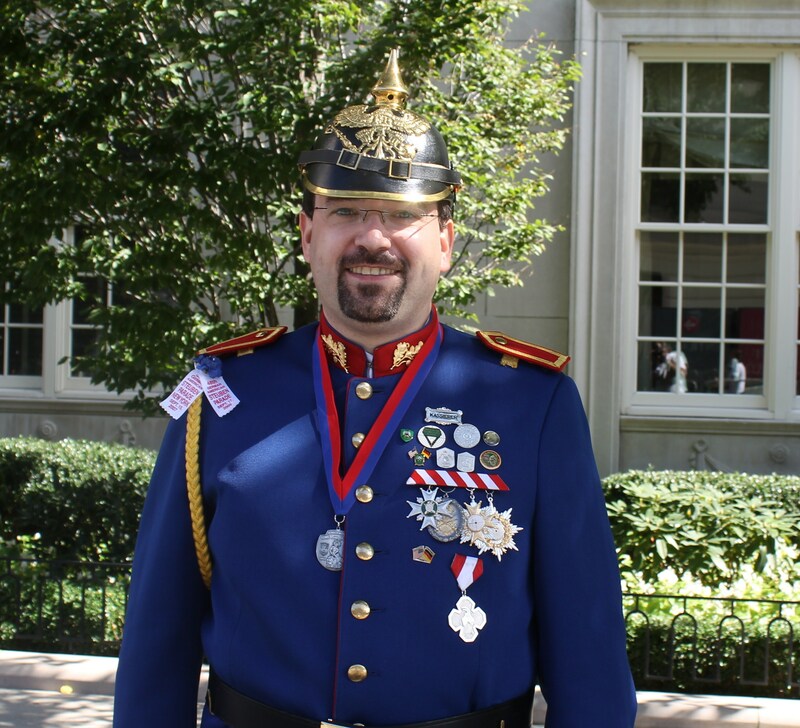 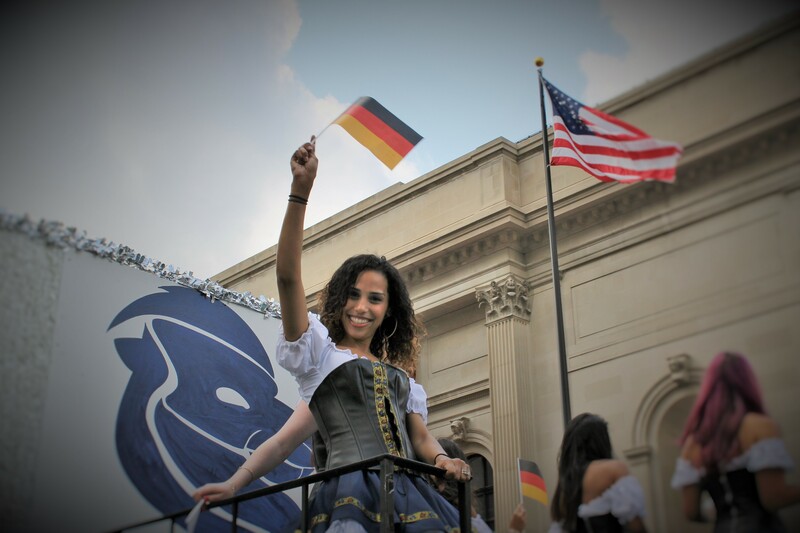 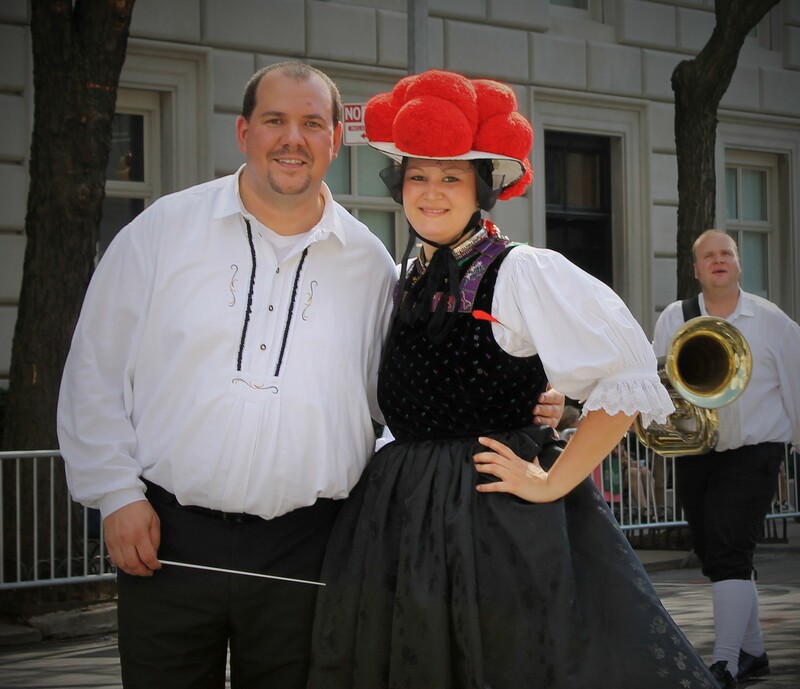 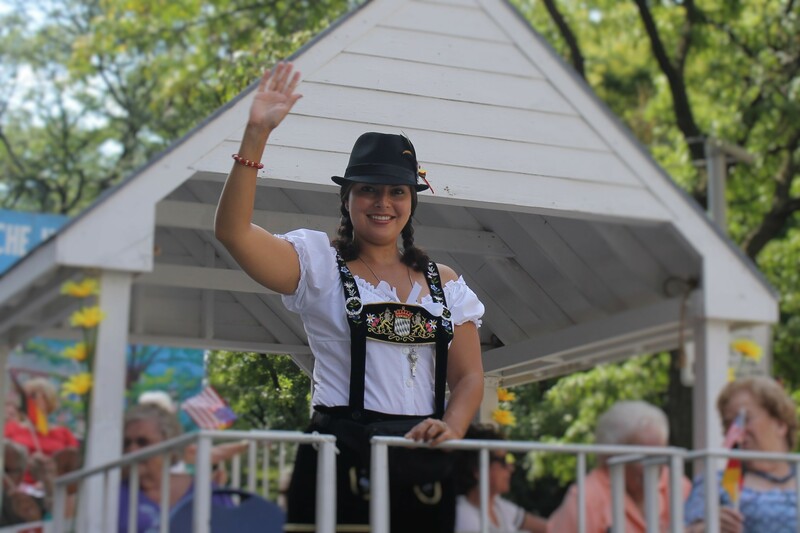 The 61st annual Steuben parade honors the Revolutionary War General Baron von Steuben but it has transformed into a show of unity of German Americans and folks from the Motherland. 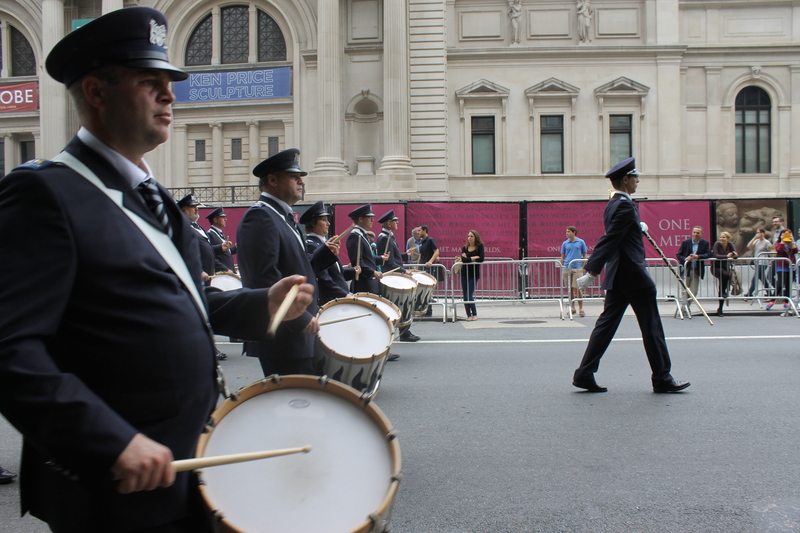 The large crowd along the 5th Ave. parade route was getting anxious to see the lead marching band perform. 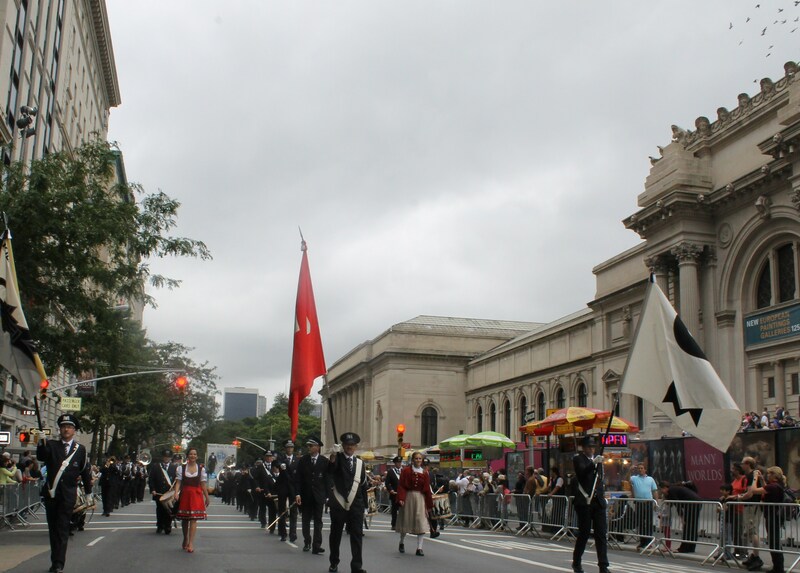 This parade rolls out the red carpet literally at the reviewing stand by 78th St. where parade dignitaries and VIPs take in some of the many talented marchers and bands. 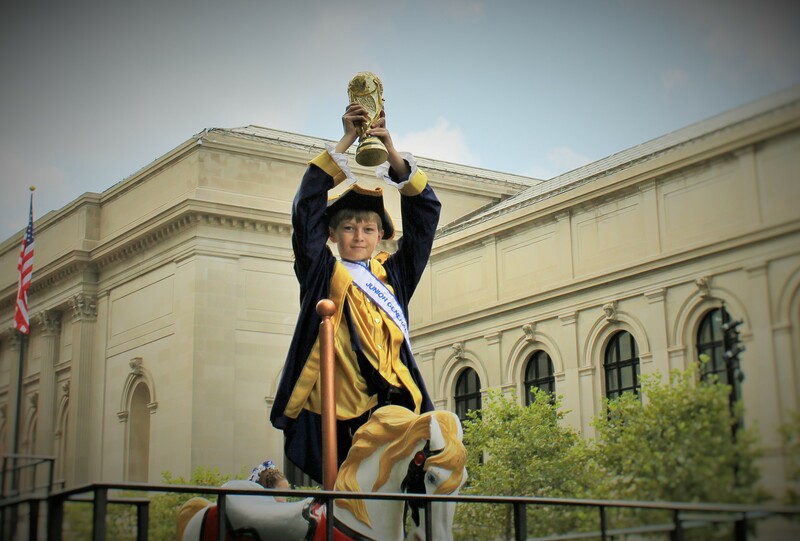 As usual, the mounted police signal the start of the parade with the lead band stopping by the reviewing stand to play both countries national anthems. 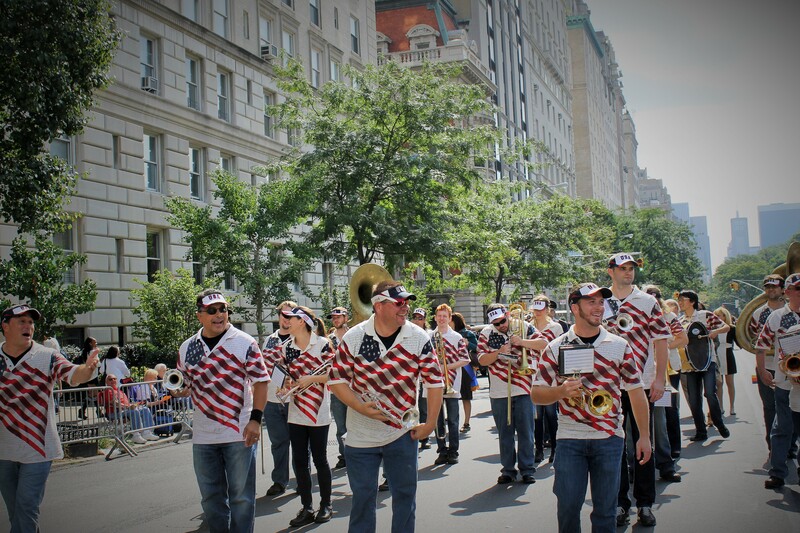 Then the fun begins with the lead band playing a popular marching band tune. 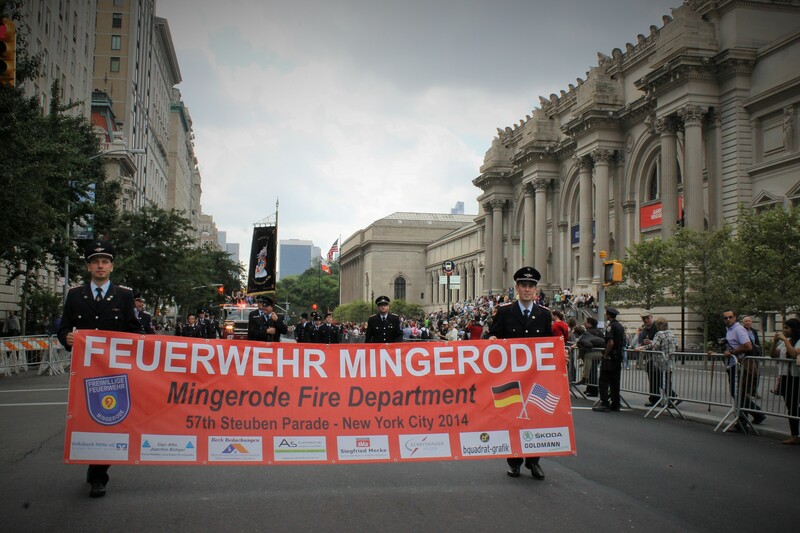 As a show of unity, both German and NY firefighters get together for a march. 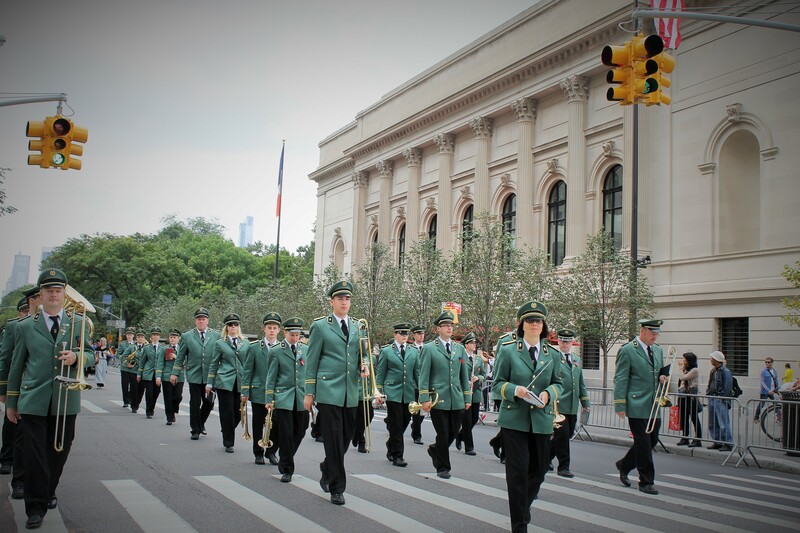 One of the best things about the Steuben are marching bands come in from Germany and play some fine marching tunes. 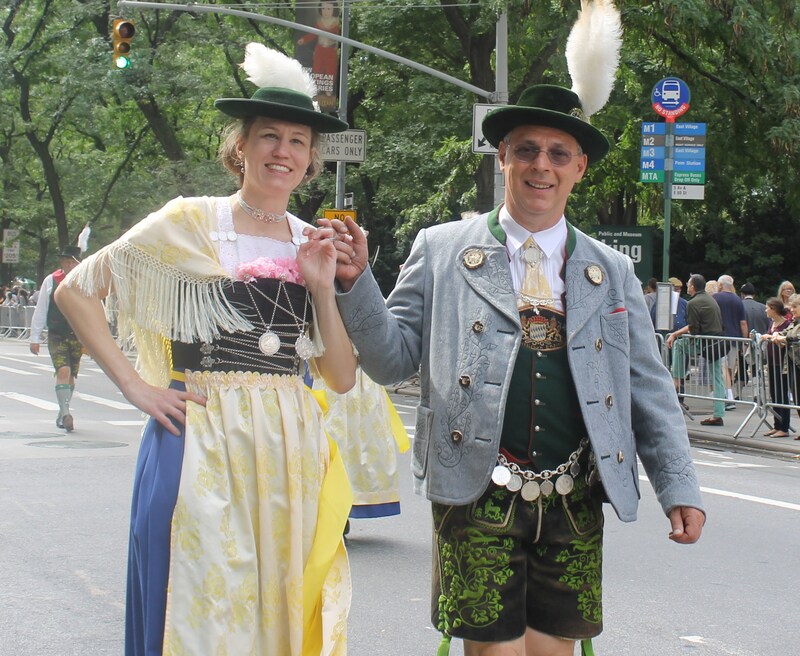 One of the better ones with great costumes from another era was the group from Dinkelsbuhl. 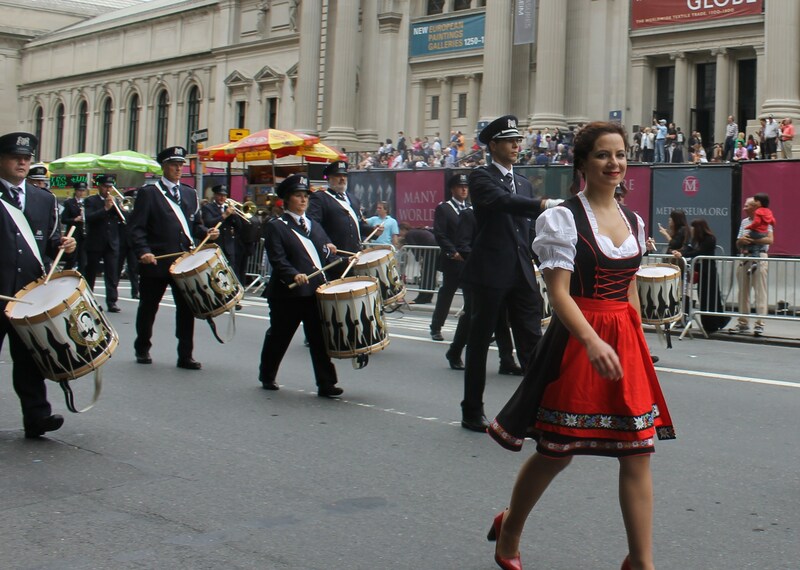 They were soon followed by a really fun band called Musikverein Schienen. 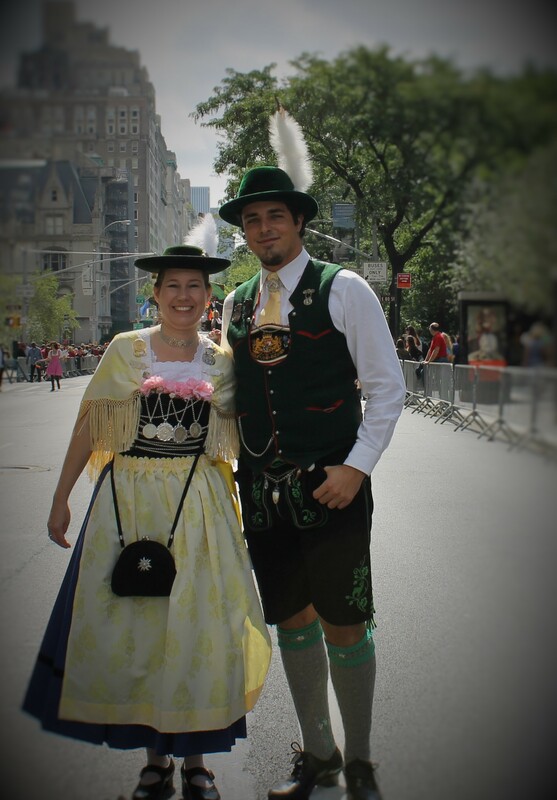 There were some great costumes celebrating the German version of Karneval. 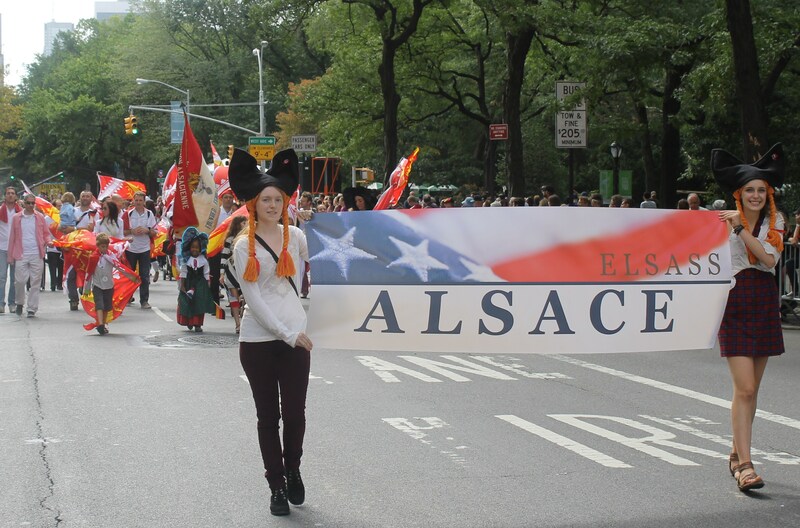 Various regions near Germany come out in celebration as well. 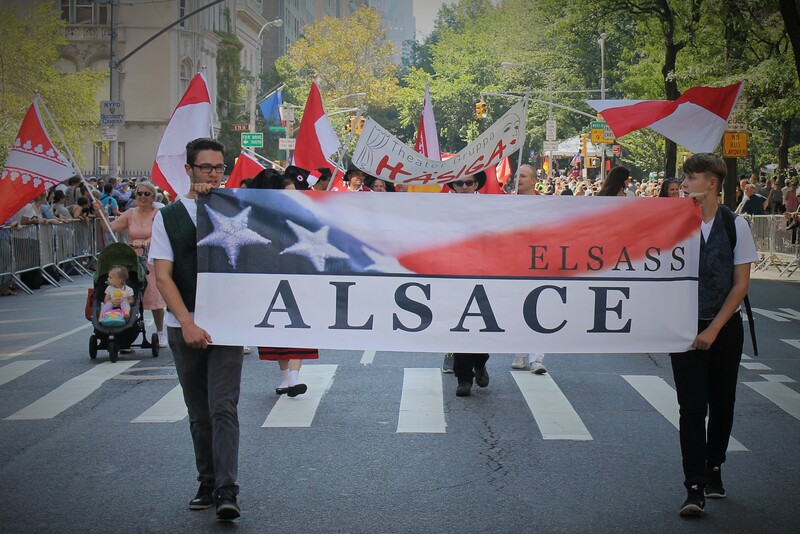 Austrians, Bavarians and even a really cool Swiss Band rocked out. 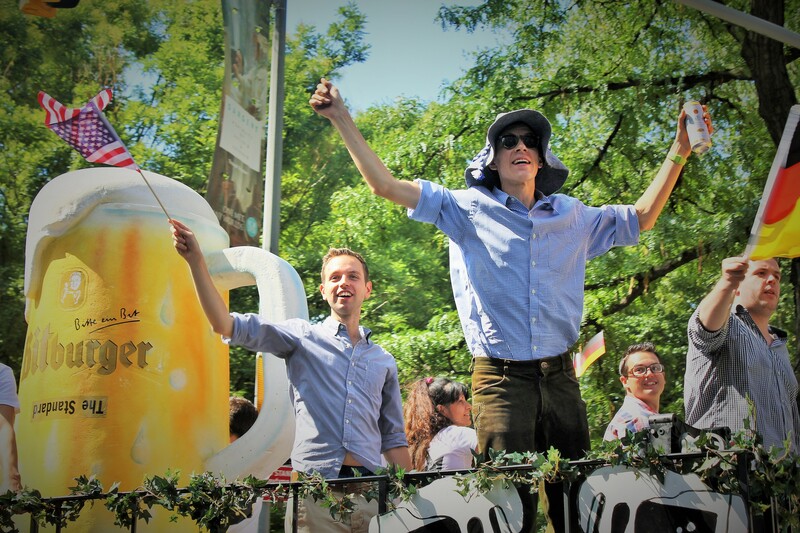 They were fun. 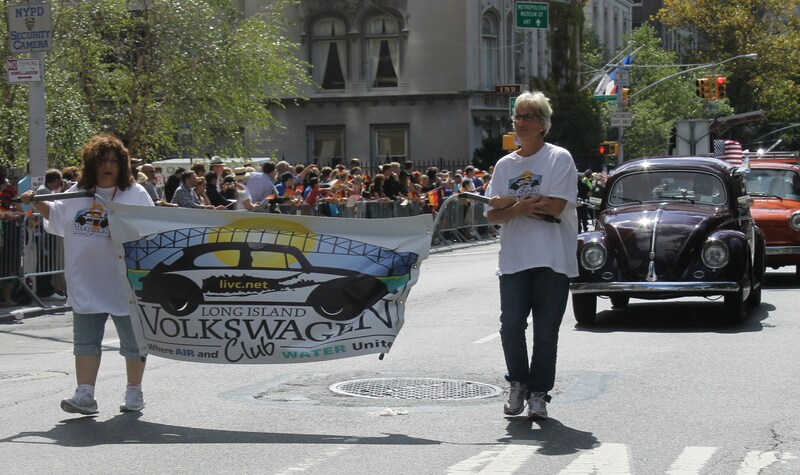 Perennial favorites Long Island Volkswagon Club drove their Beetles up the parade route. 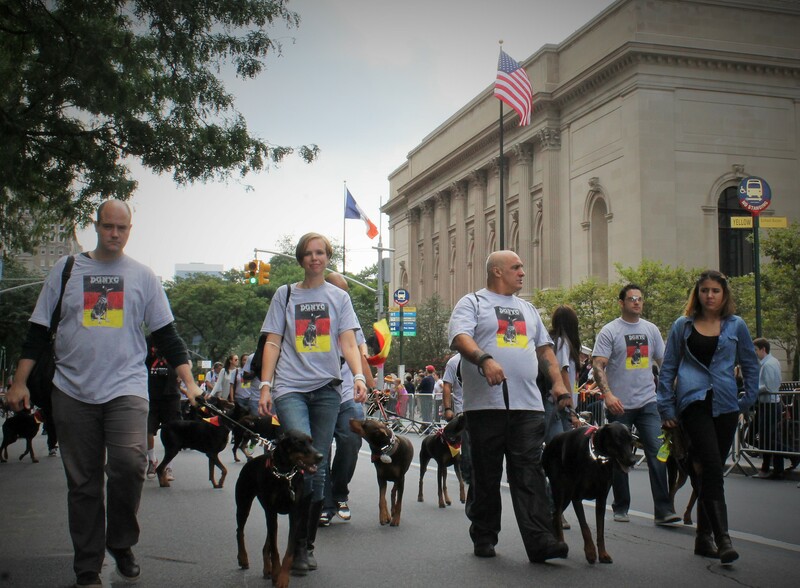 The doberman dogs brought their owners with them so they can show off their attitude. 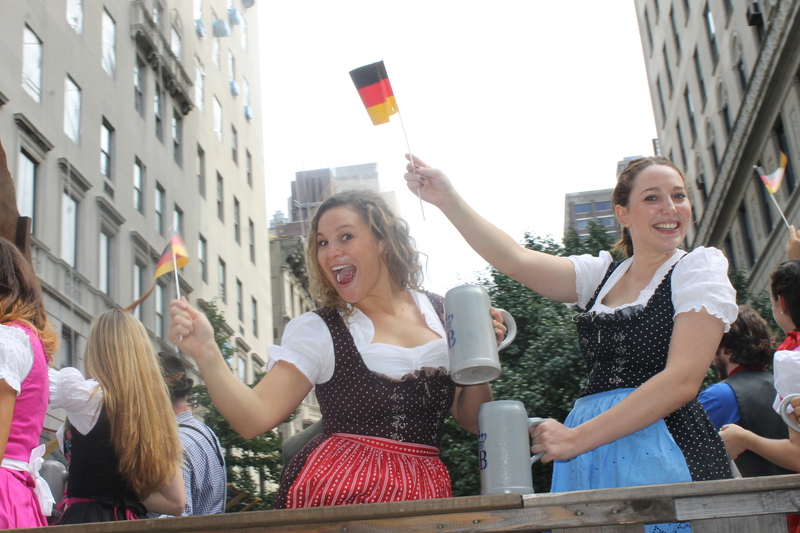 Beer floats always make the most noise and their patrons can’t wait to get to the Oktoberfest celebration in Central Park after the parade. 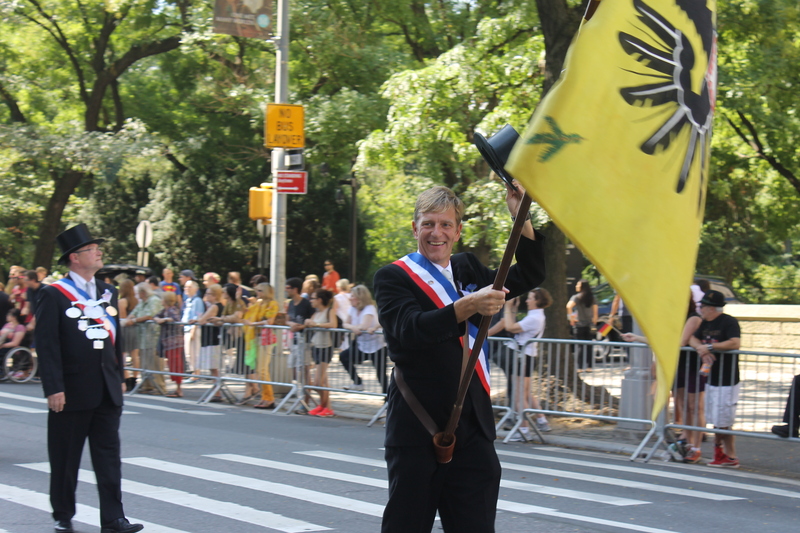 It really is a fun parade, polite, but lots of fun. 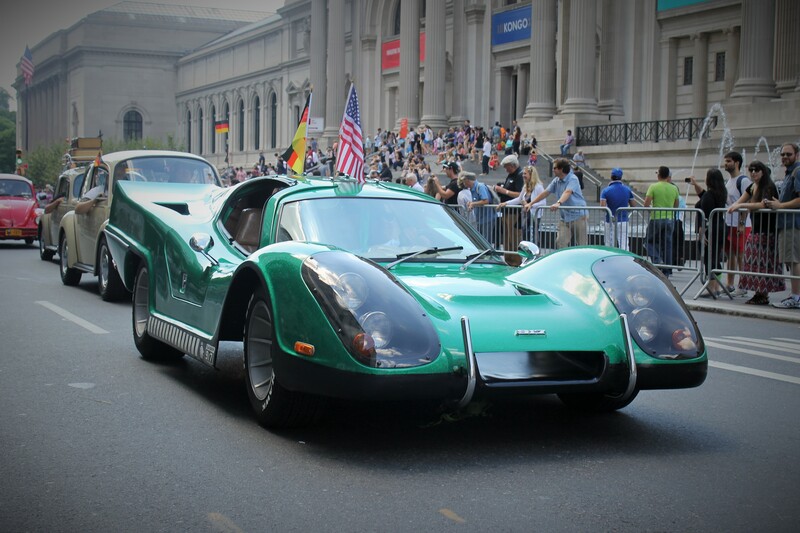 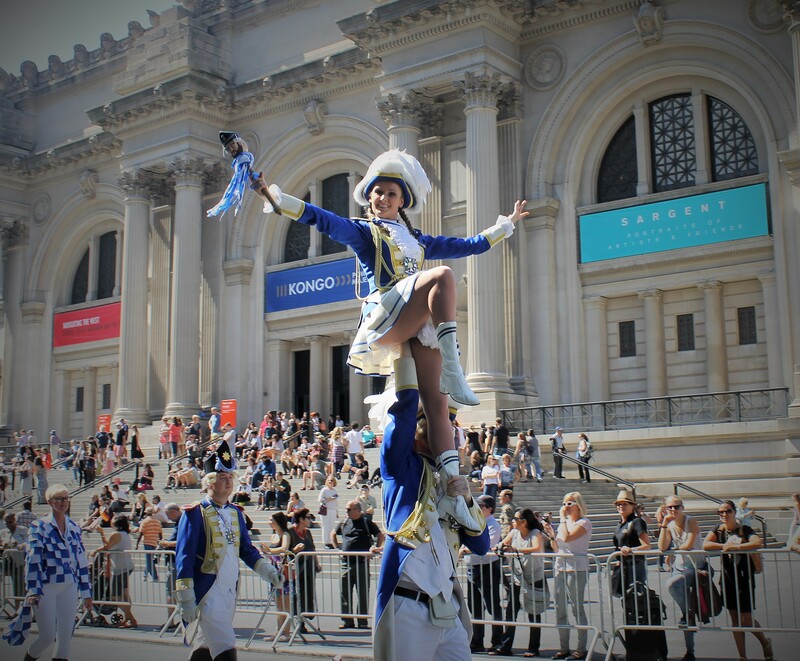 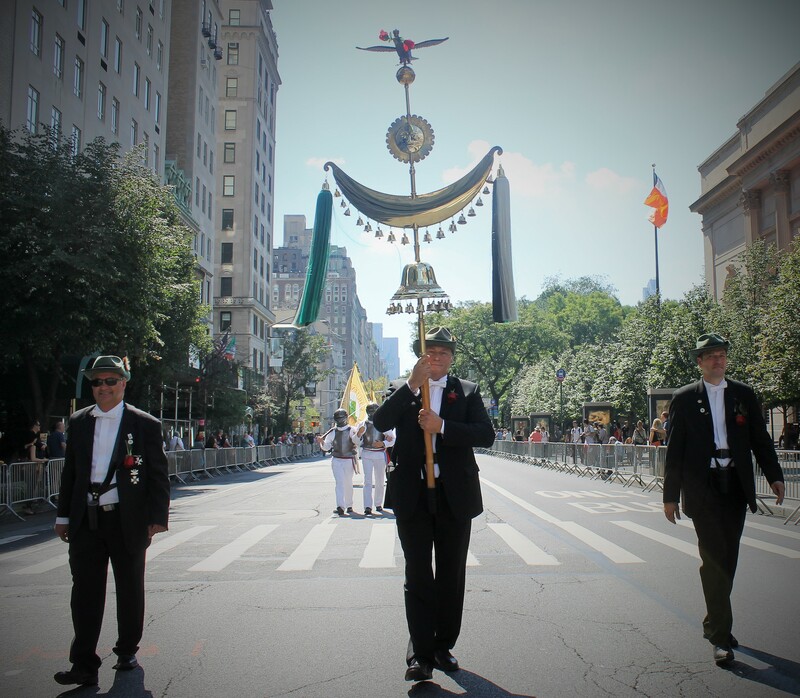 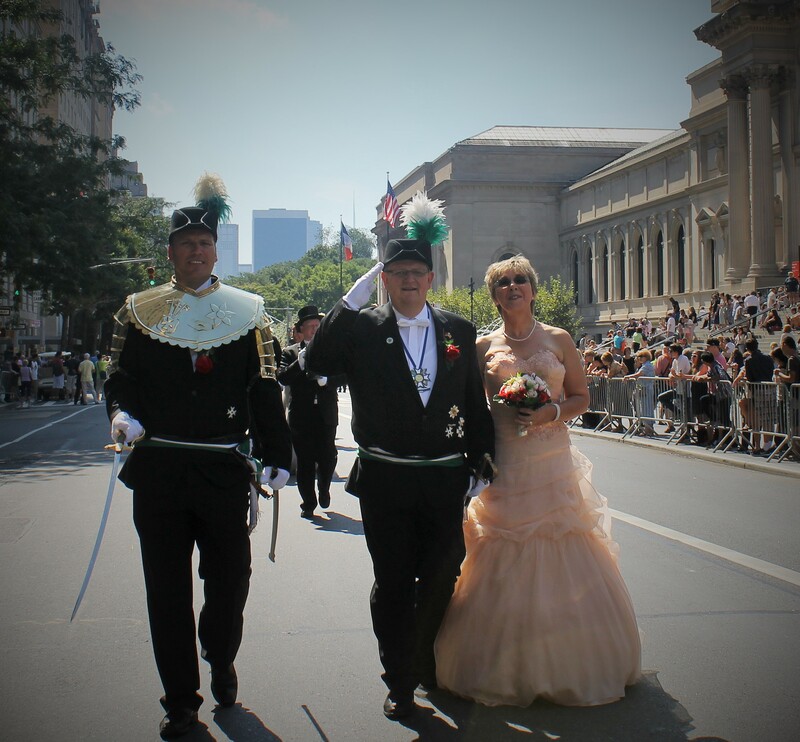 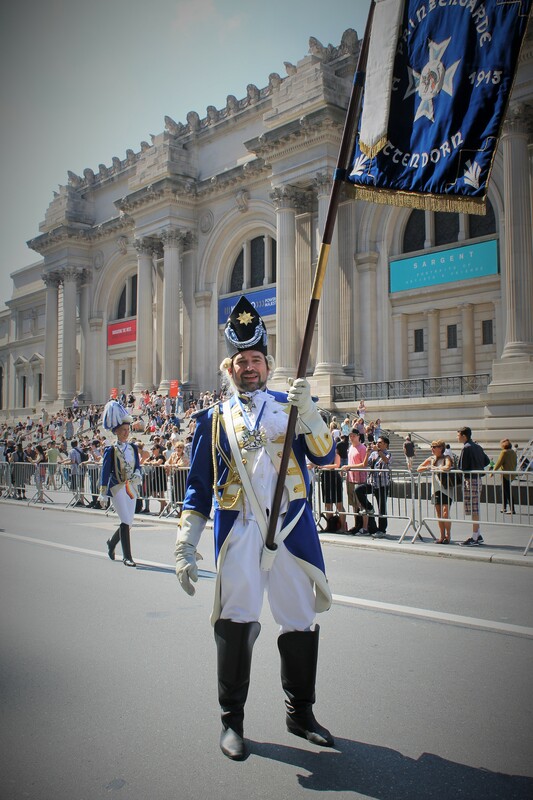 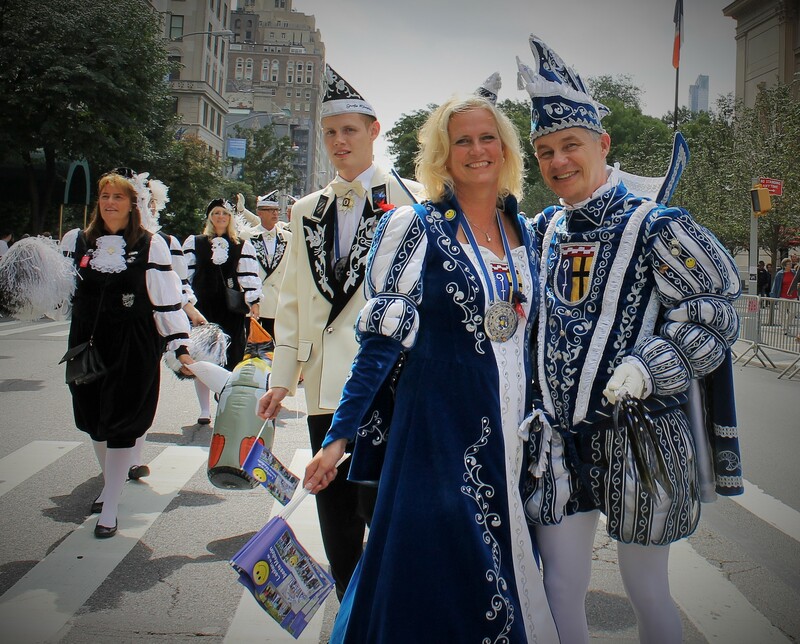 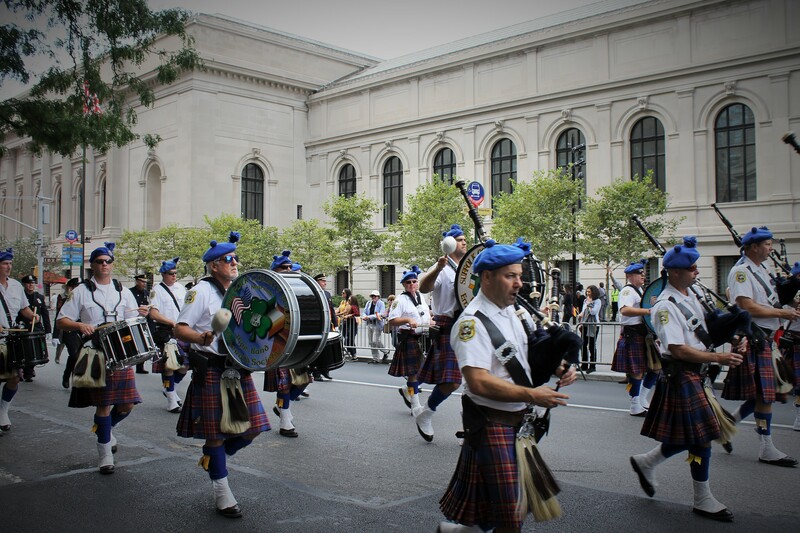 The unusually hot end of summer weather brought out a big crowd for the 60th annual Steuben parade on 5th Ave by the landmark Met Museum. 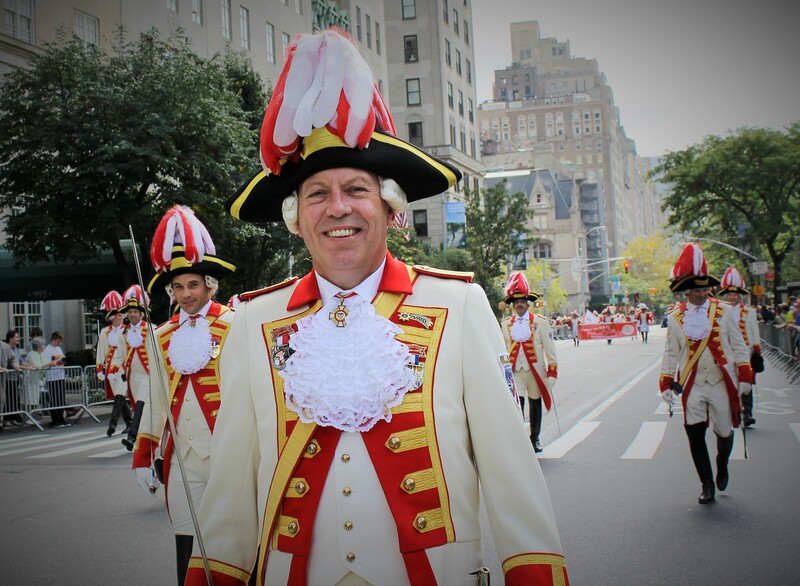 The parade is in honor of Gen Von Steuben, who helped Gen. Washington win the Revolutionary War. 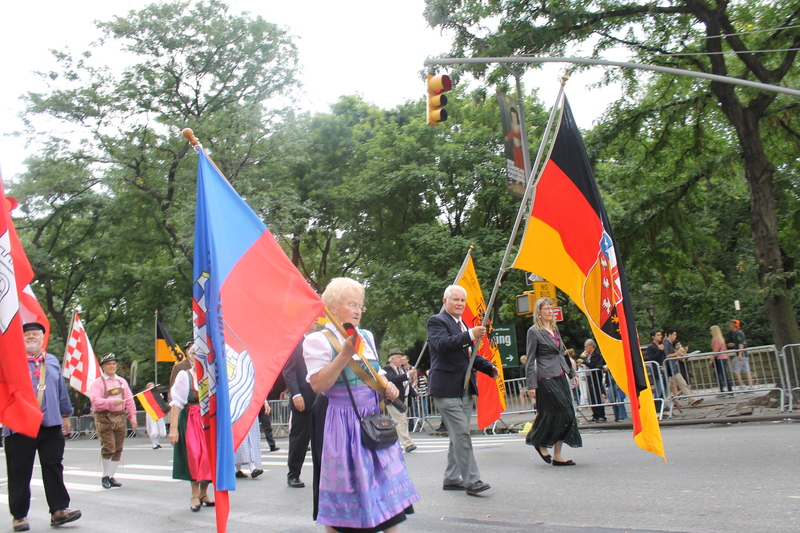 It also unites Germans from abroad with those of German decent in the New York area. 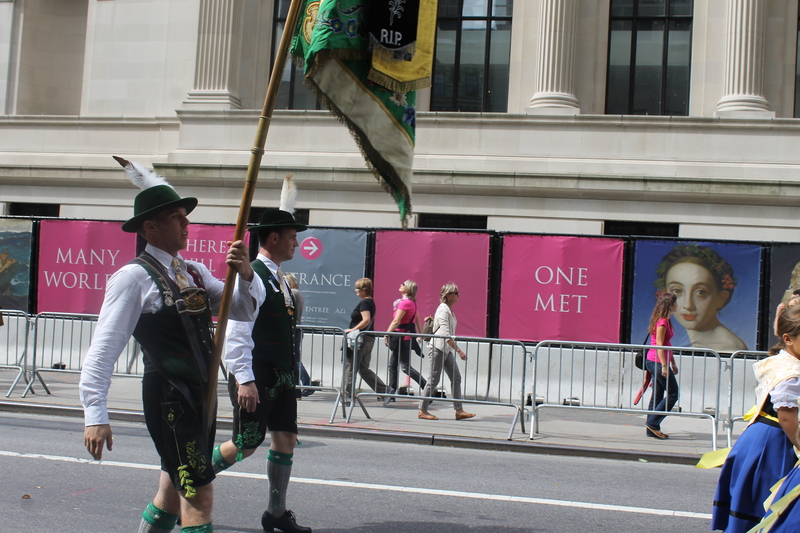 If you know anything about Germans, they are punctual and as usual, the parade kicked off at 12 noon sharp. 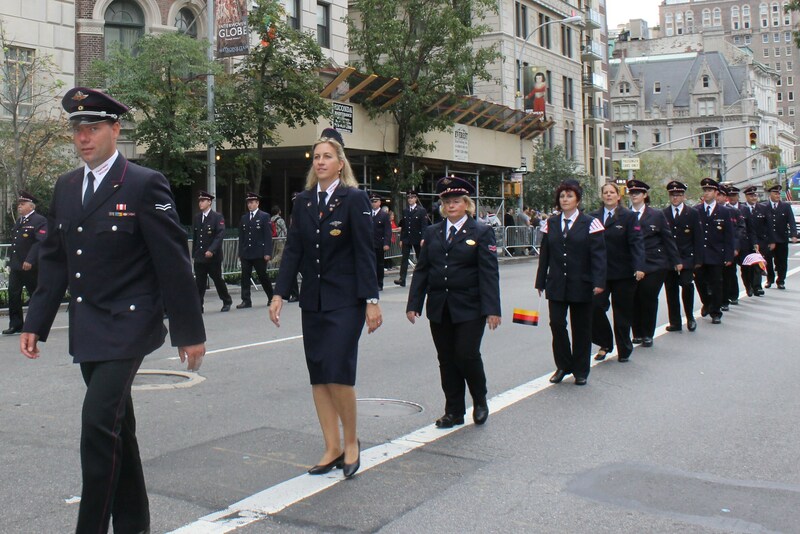 The mounted police signaled the start of the parade with the lead German band and the West Point Military band each playing their respective national anthems before the reviewing stand on 78th St. and 5th Ave. As another show of unity the NYFD and their German counterparts marched up the parade route. 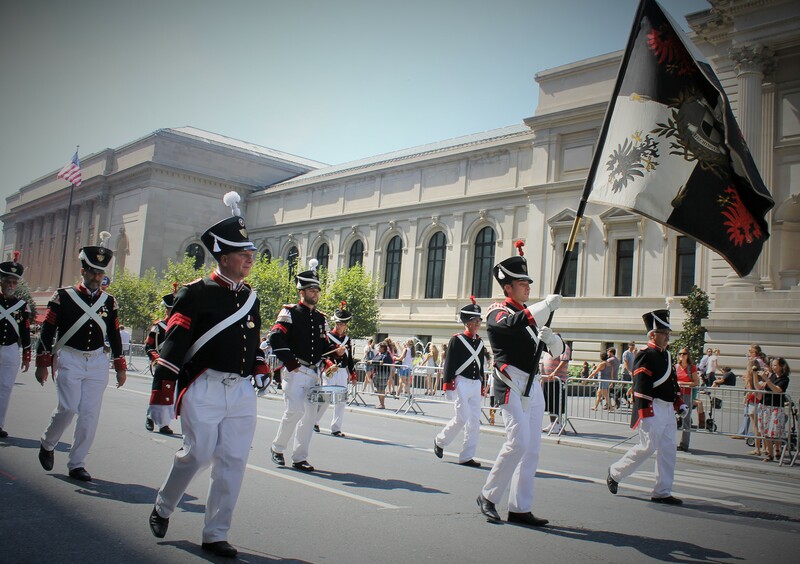 Aside from the traditional costumes displayed by the hundreds of marchers, one of the best things about this parade is the number of bands brought in from small towns in Germany and surrounding areas to show off their style of marching bands. 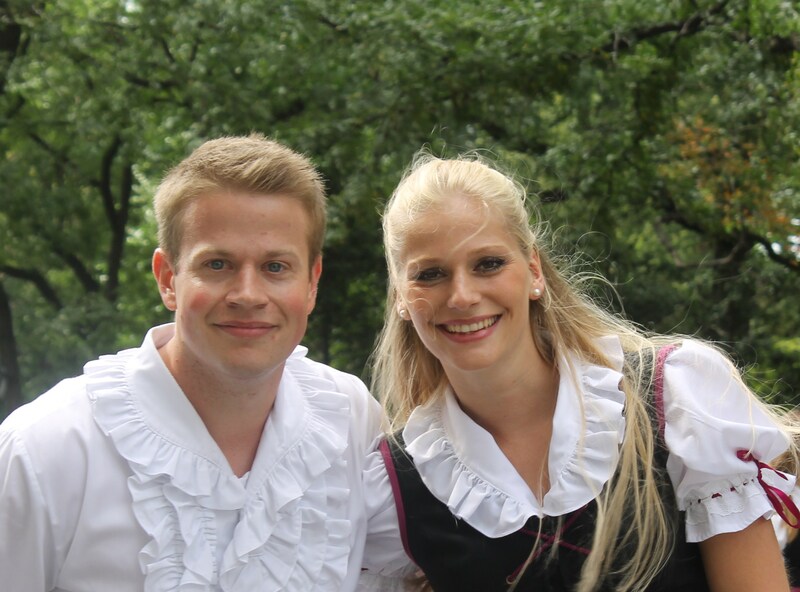 The first of the region came from the Black Forest in the Musikvecein Unterjettingen group. 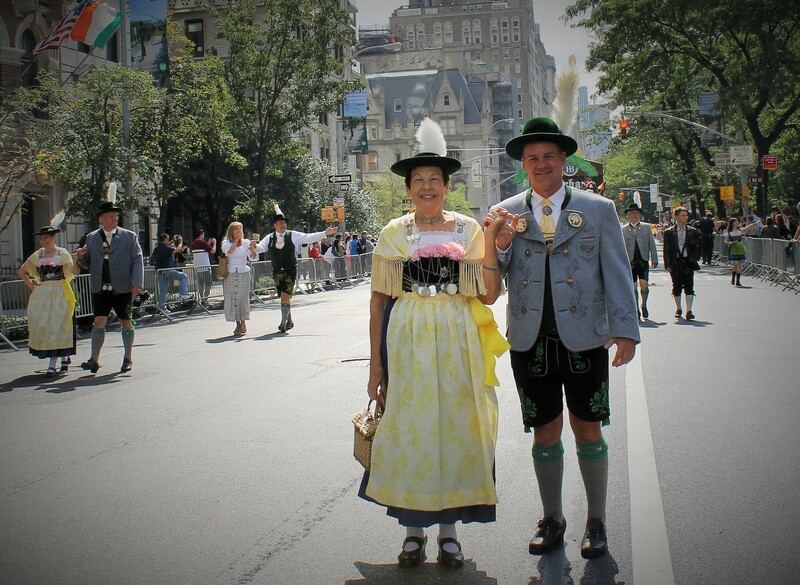 They set the tone for what would be a fine display of German culture. 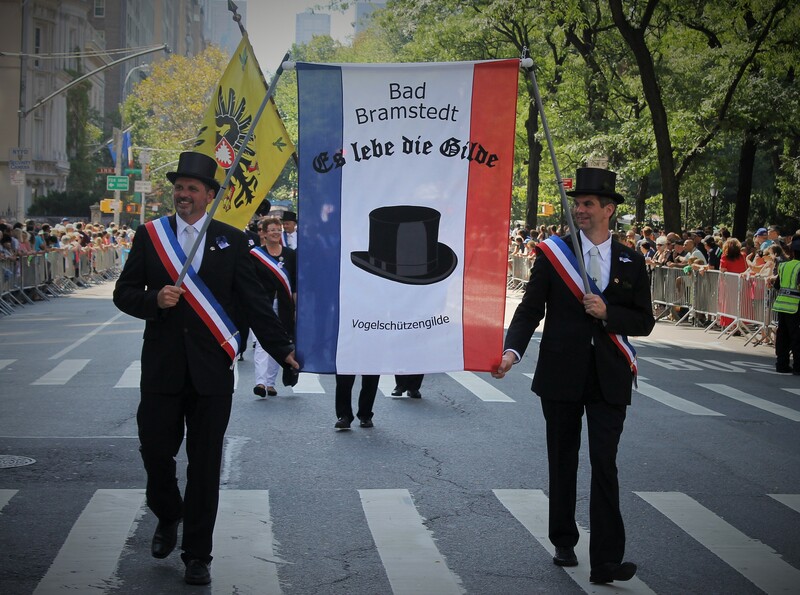 I have to admit, of all the parades I cover, this is the most polite parade so far. 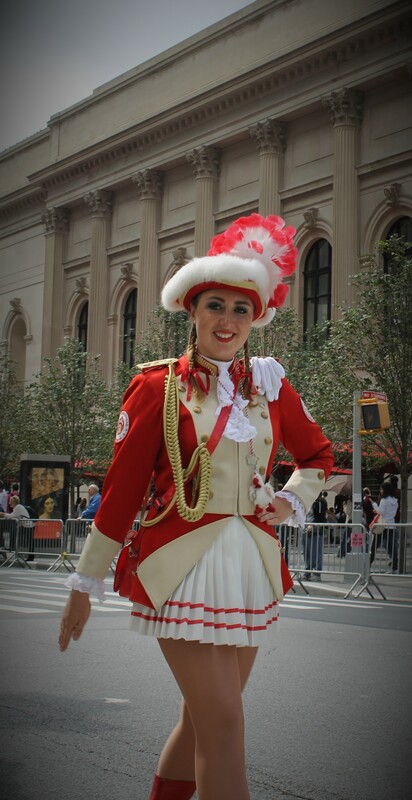 All the marching bands had their own style and flair to it. 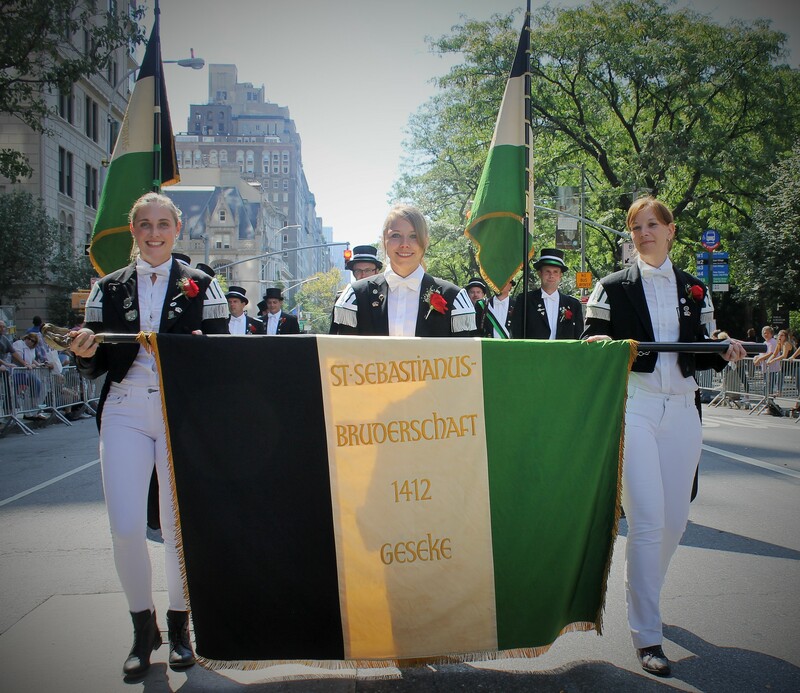 The bands from Dresden and Murnau had a steady upbeat tone while Verband der Siebenburger Sachsen was a bit on the slow side. 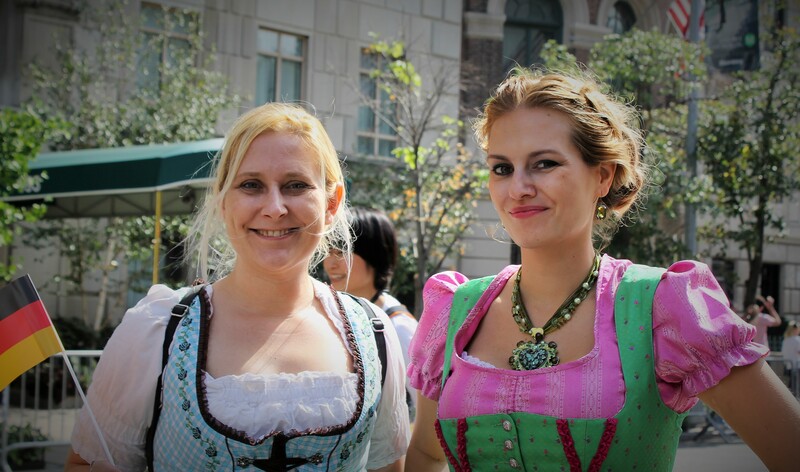 The Wolfenweiler Schallstadt was a group of Germans that settled in the Transylvania region of Europe. 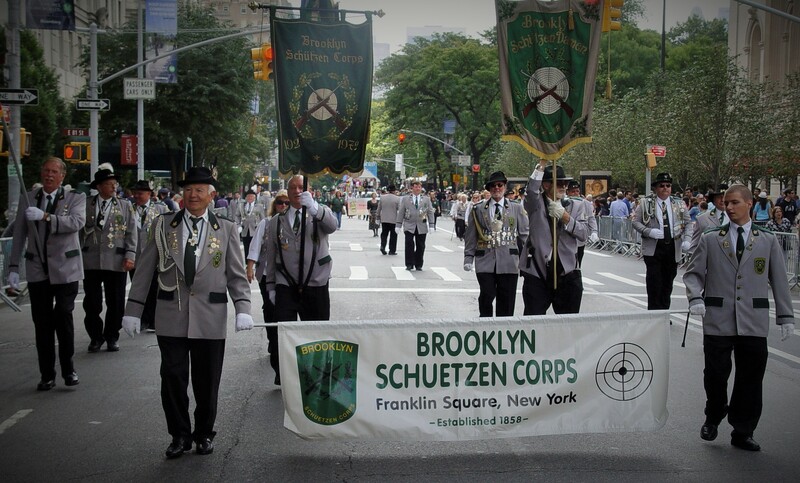 Two bands that were pretty good were the SZ Hollenstedt and SZ Bernburg with their airy float and bell sounds. 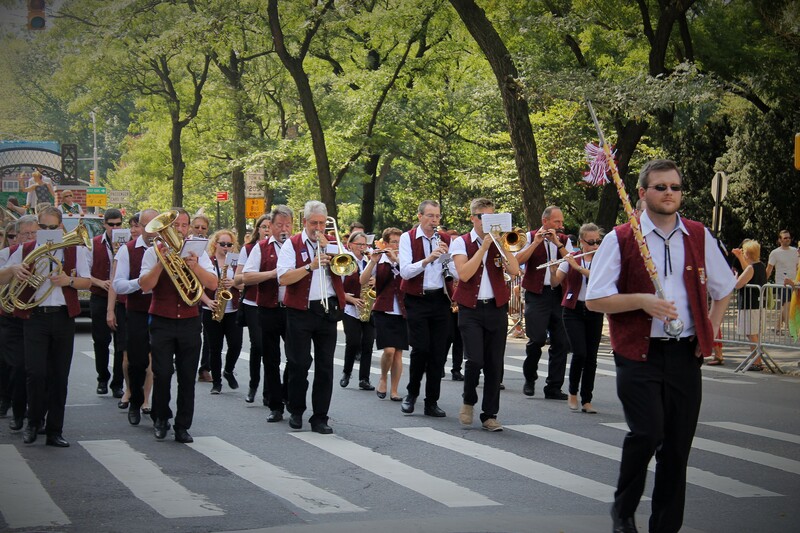 But hands down the band to steal the show was the band from Endingen with their flute, drum and blaring horn section really put on a nice show for the crowd. 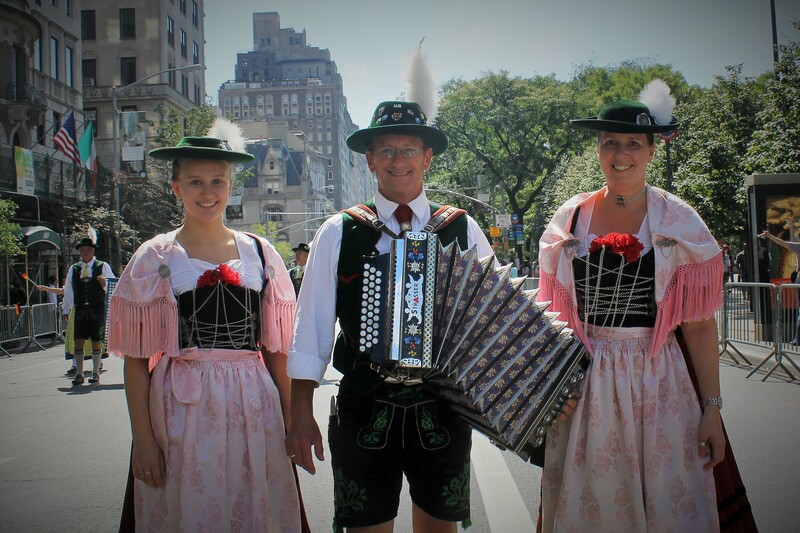 The Austrian band followed but not in the same league. 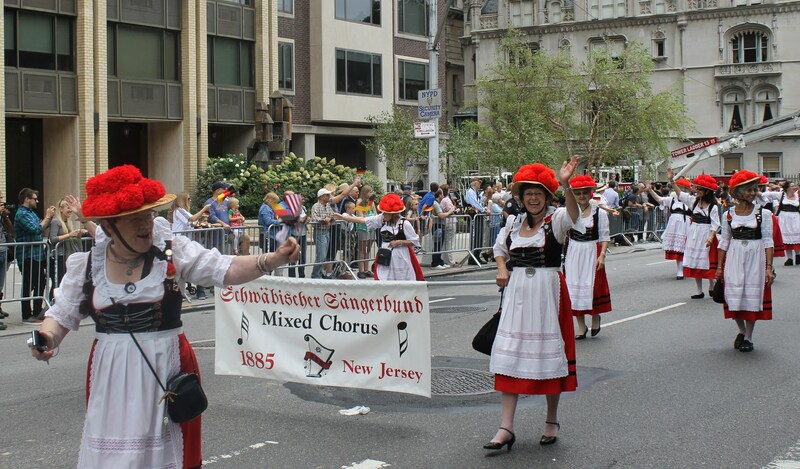 Mixed in with these marvelous German bands were German beer floats and groups representing all parts of the area, from NY, NJ and Connecticut. 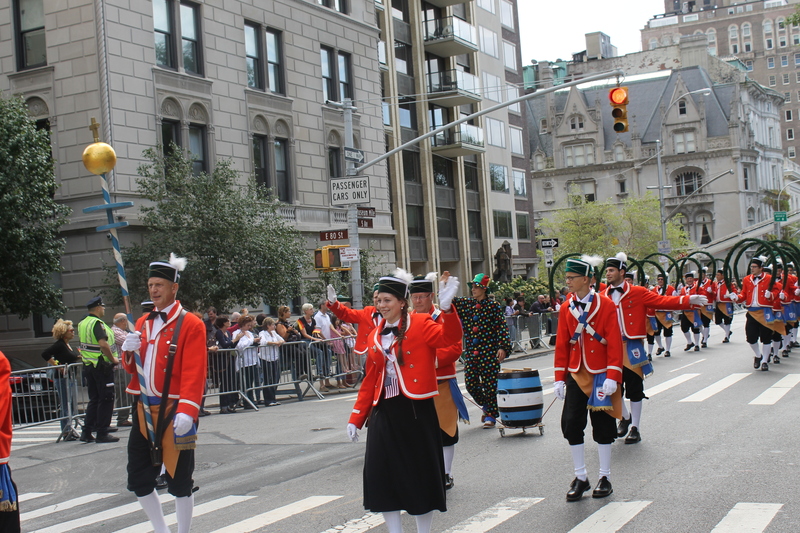 A welcome return was the Aqua String Band from Philadelphia, PA. Their Karneval costumes really got the crowd excited. 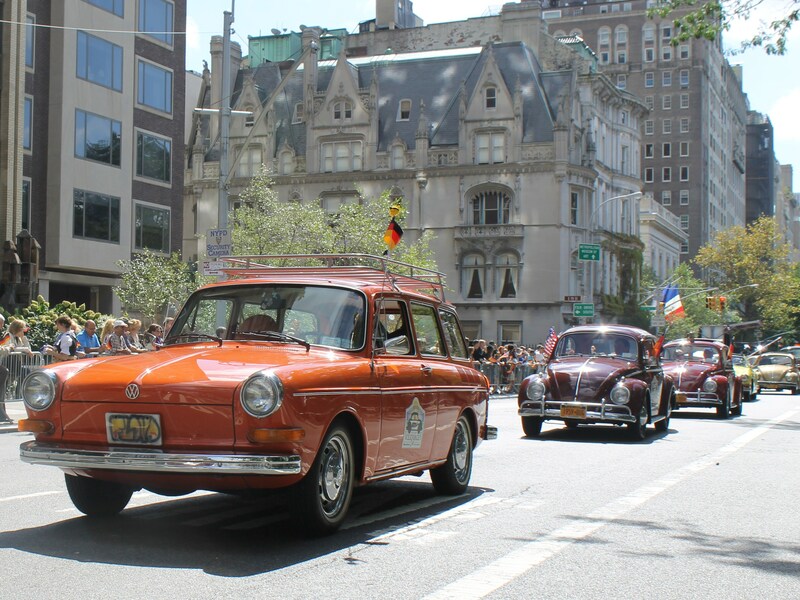 The crowd favorites made their annual appearance starting with the Doberman dog group, the gymnastic group of the American Turners and of course the Long Island Volkswagon Club. 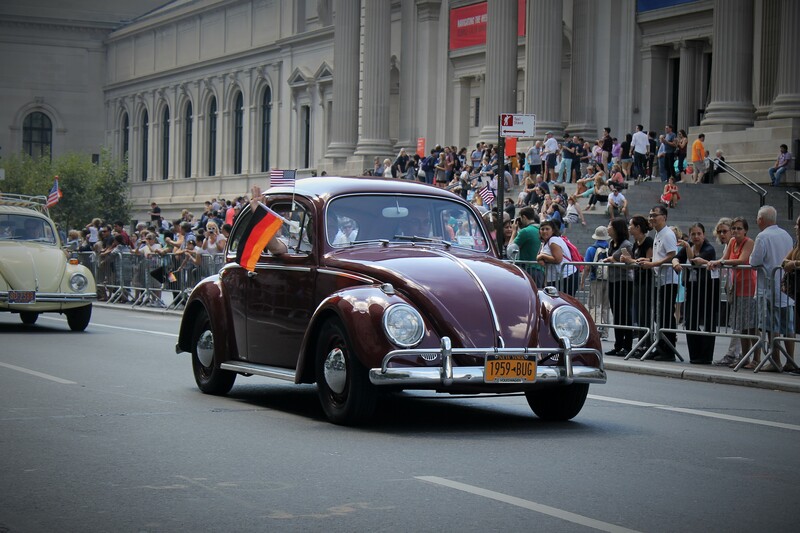 They always get a great welcome from the crowd. 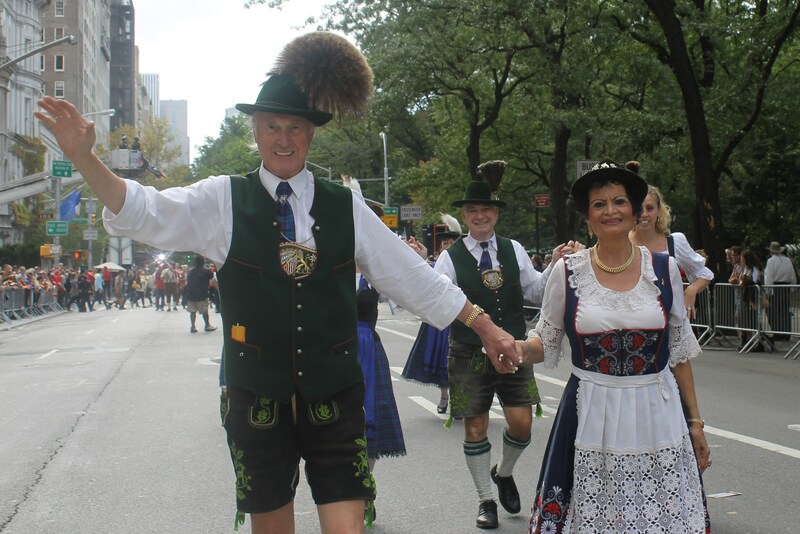 After the parade is when the party begins with festivities all throughout the city but the major one is right in Central Park with the Oktoberfest where there’s plenty of great beer on tap. 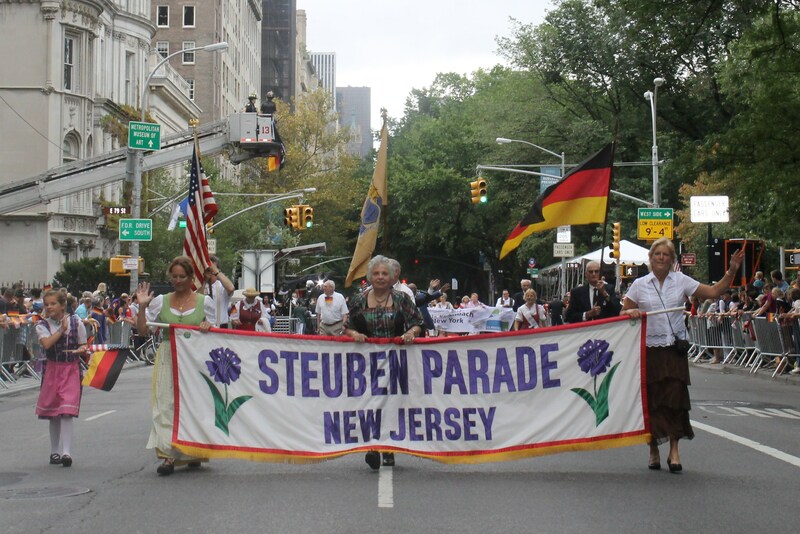 You know it’s the end of summer when the Steuben Parade heads up 5th Ave. in honor of the contributions of many German Americans going all the way back to our nation’s founding when Baron Von Steuben helped win the Revolutionary War. 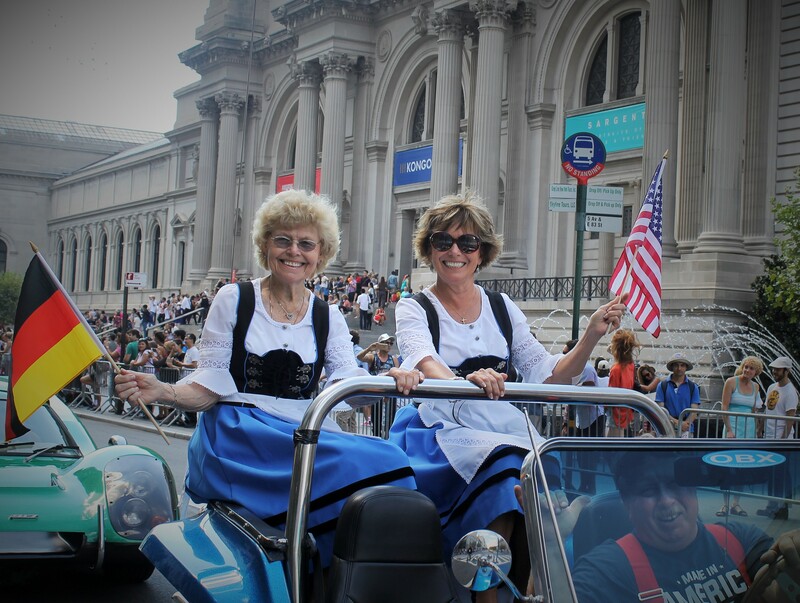 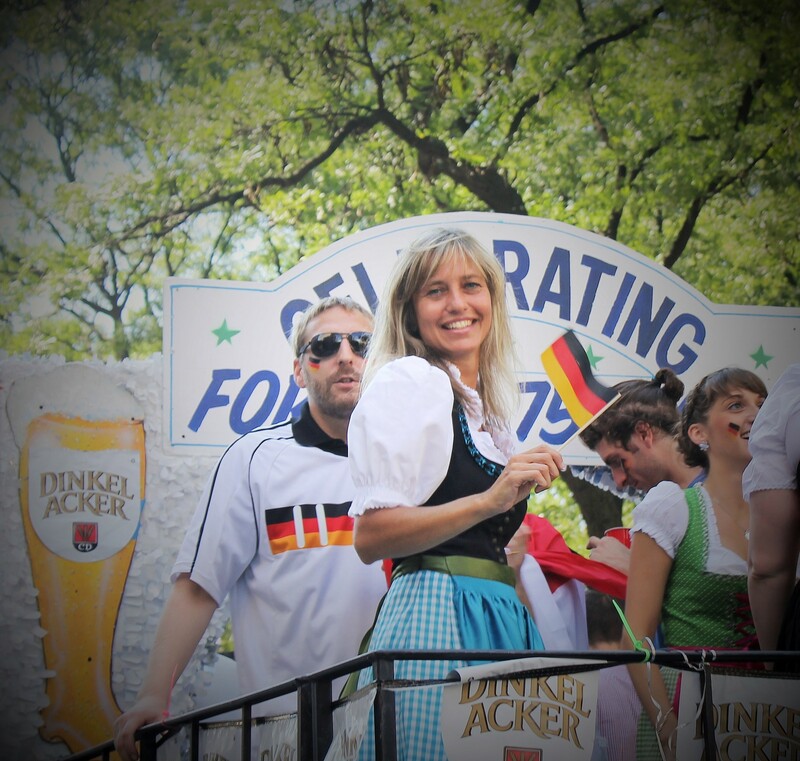 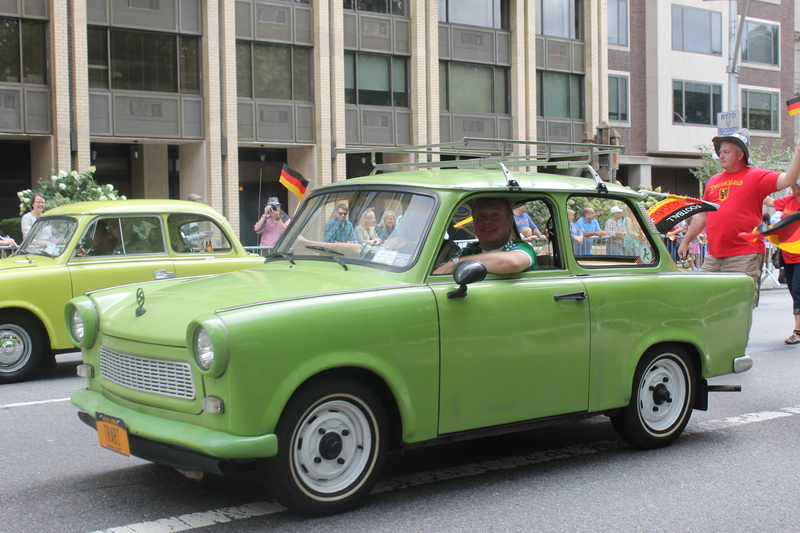 This tradition, now in its 58th year, brings unity with Germans from the homeland and German Americans from the US in celebration of culture, music, costume, dance, nice cars and lots of beer floats. 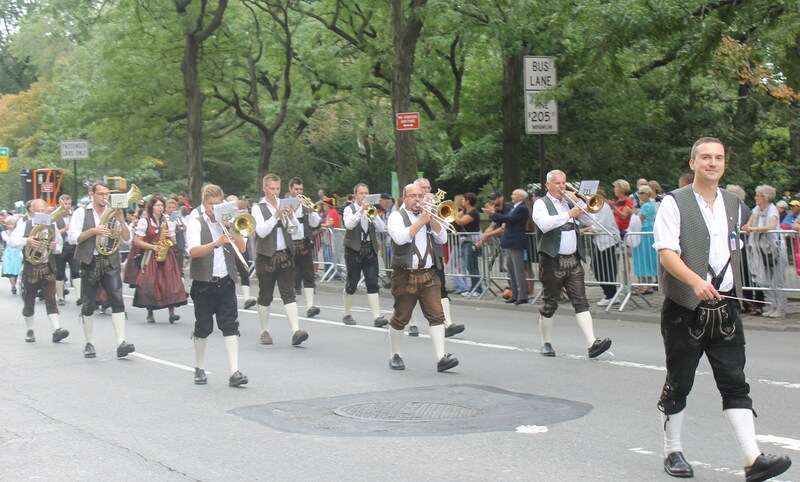 One of the best parts of this parade is when the German marching bands play some tunes for the devoted fans on the parade route from 68th to 86th. 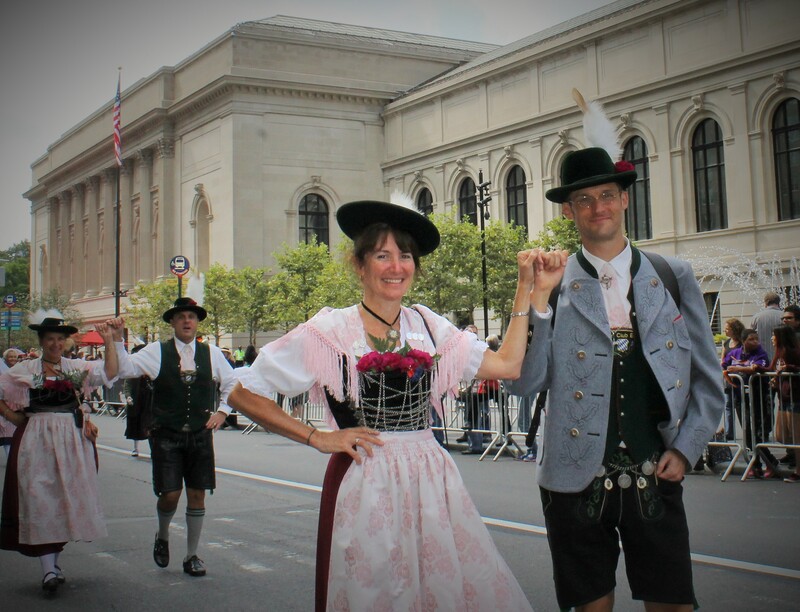 It’s great to see and hear the contrasting styles of German and American bands. 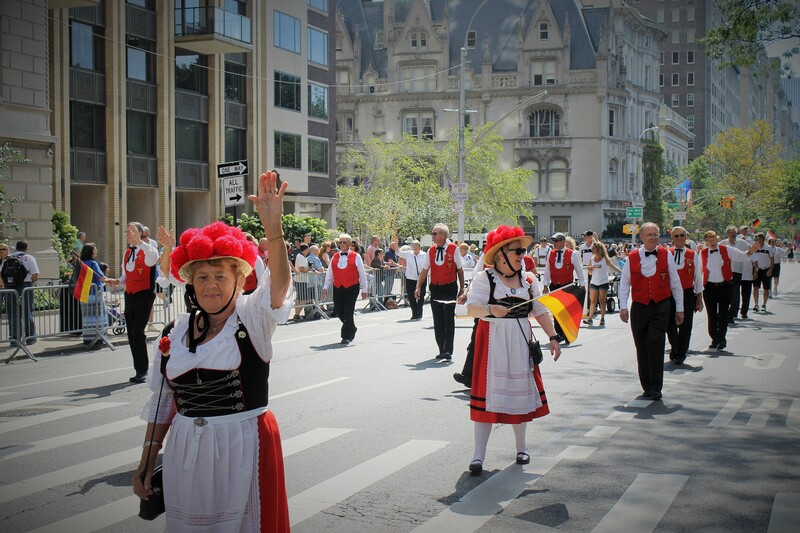 The crowd really got into it especially when the band from Stuttgart played. 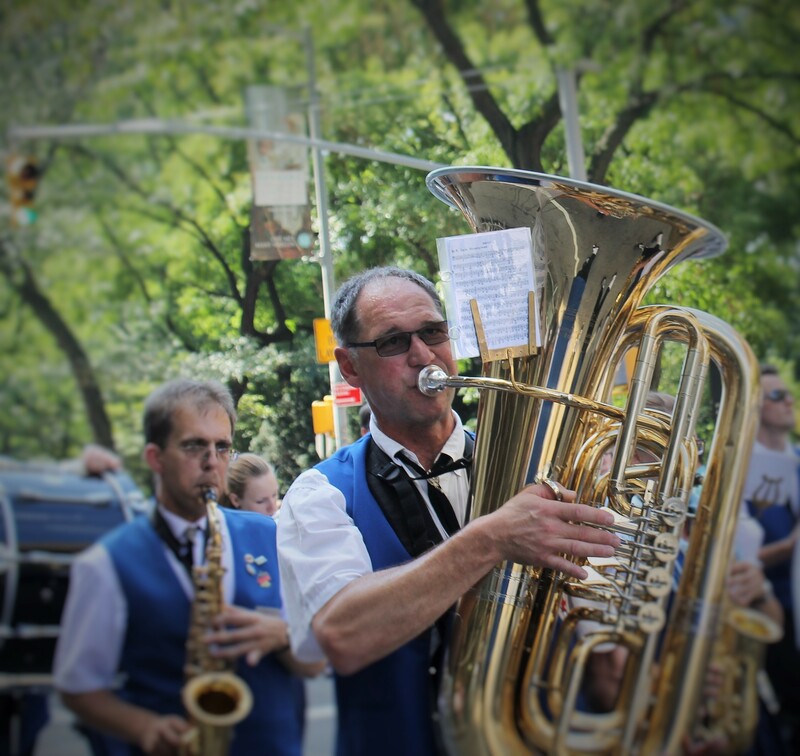 The Musikverein Mohringen band were just warming things up for some of the larger bands soon to follow. 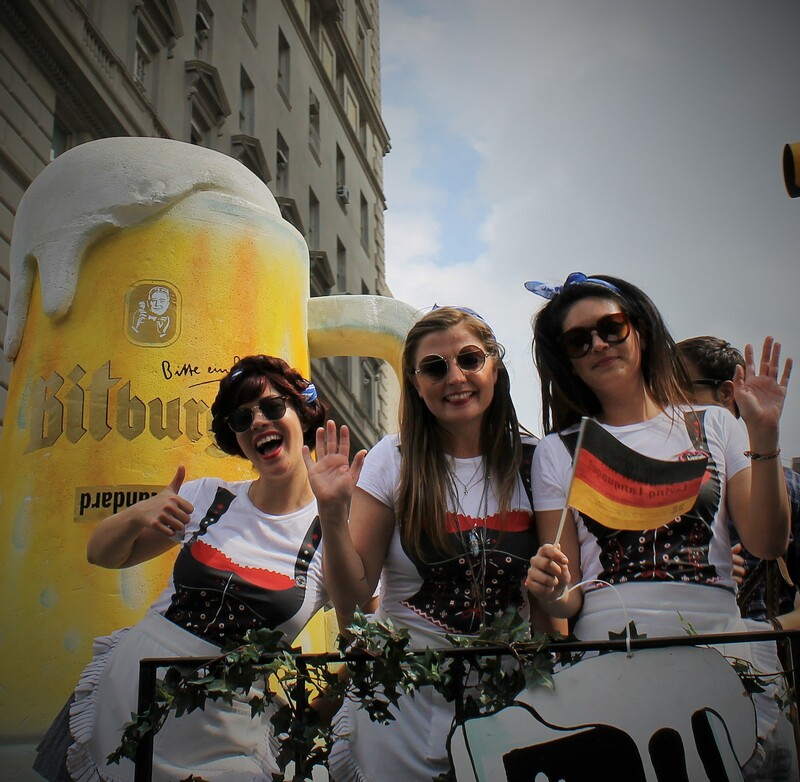 There were many language groups and community groups representing German culture… and did I mention lots of beer floats. 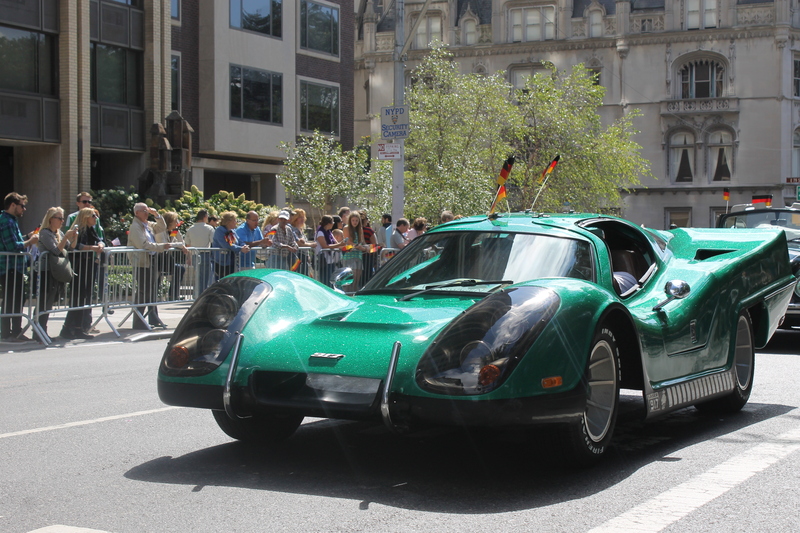 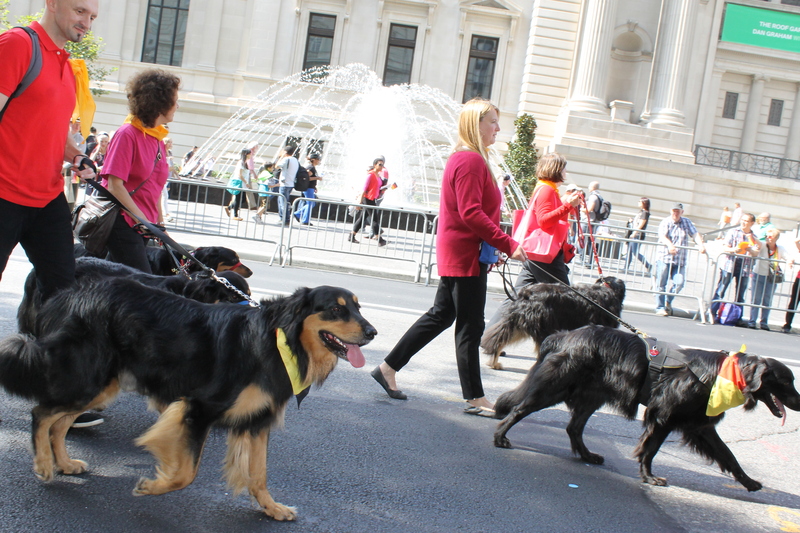 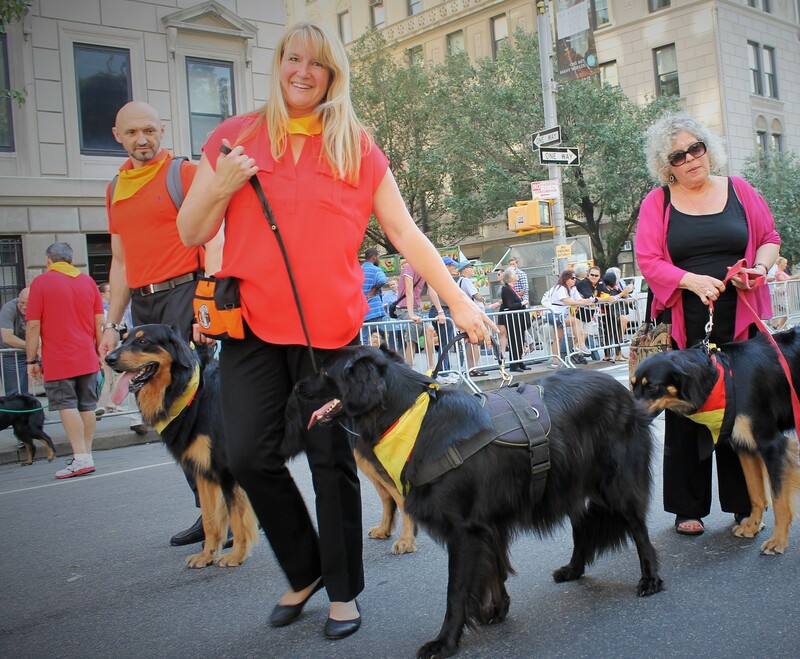 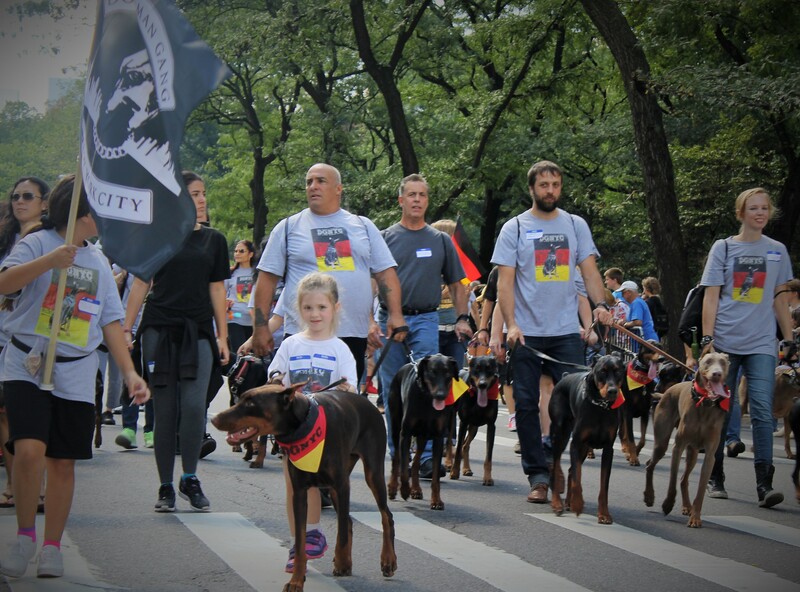 Perennial parade favorites are the Long Island Volkswagon club and the Doberman Pinscher dog club and they did not disappoint. 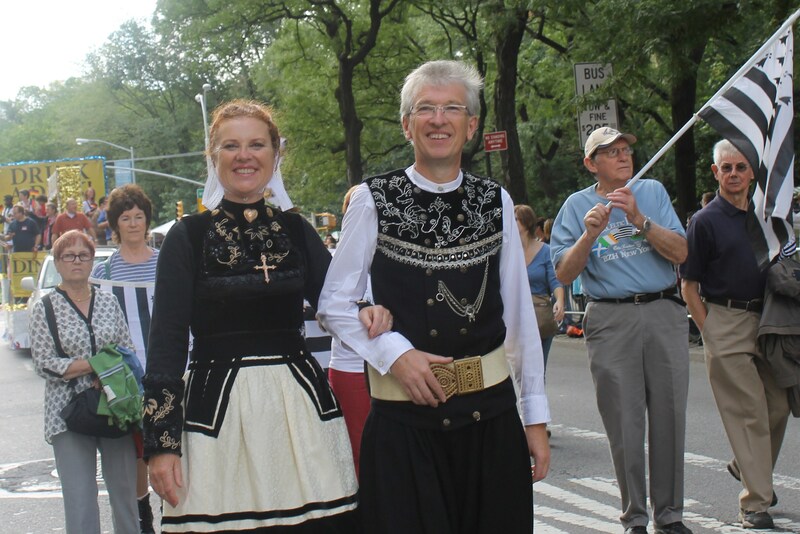 The traditional costumes were simply amazing this year. 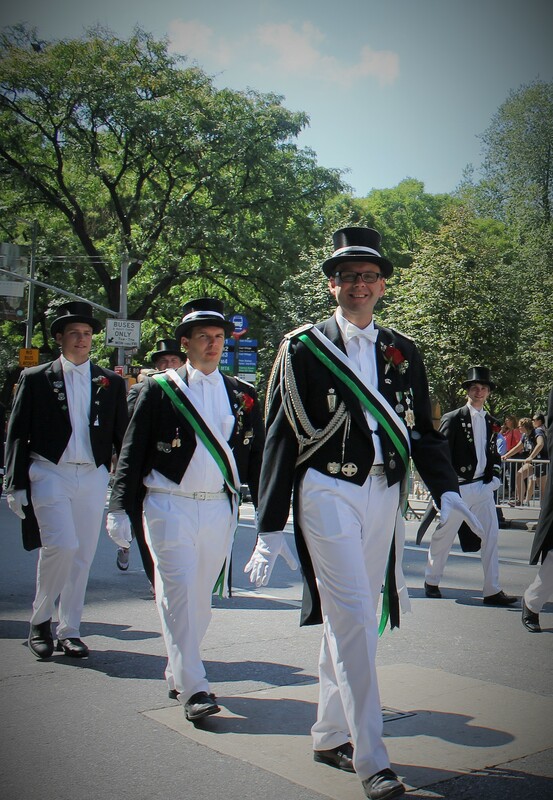 There was an elegant appeal to some of he costumes as men were in top hats and tuxedos. 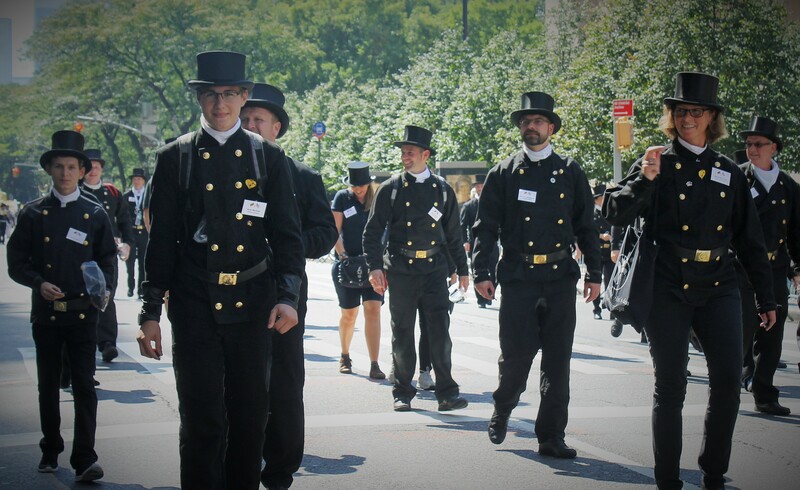 For a second thought they were on the way to a wedding at the Boat House in Central Park. 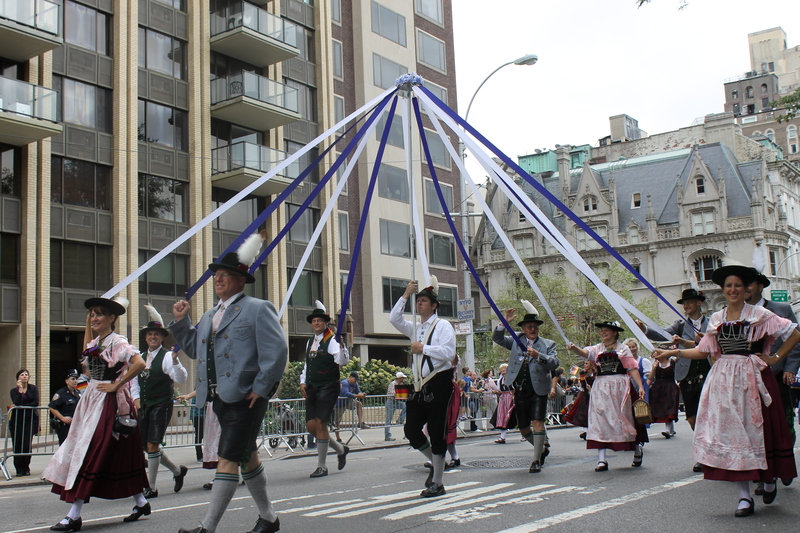 There was another group dressed in colonial times attire that displayed some acrobatic flair. 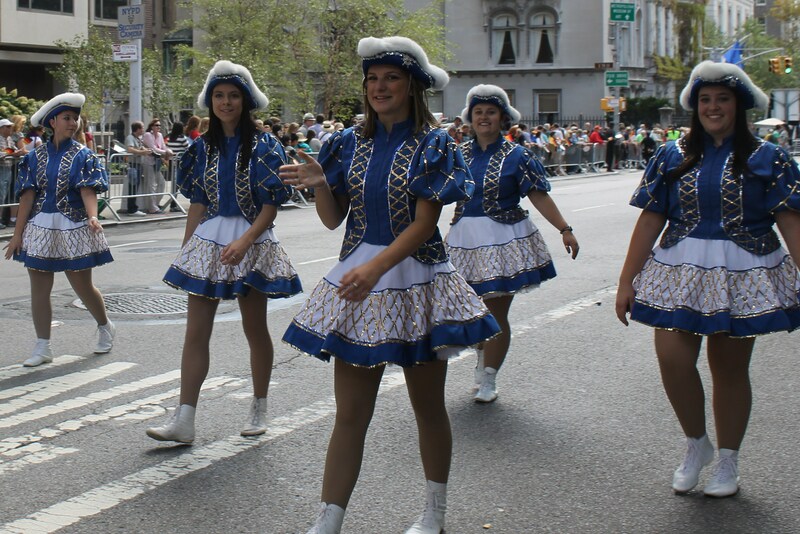 They were fun. 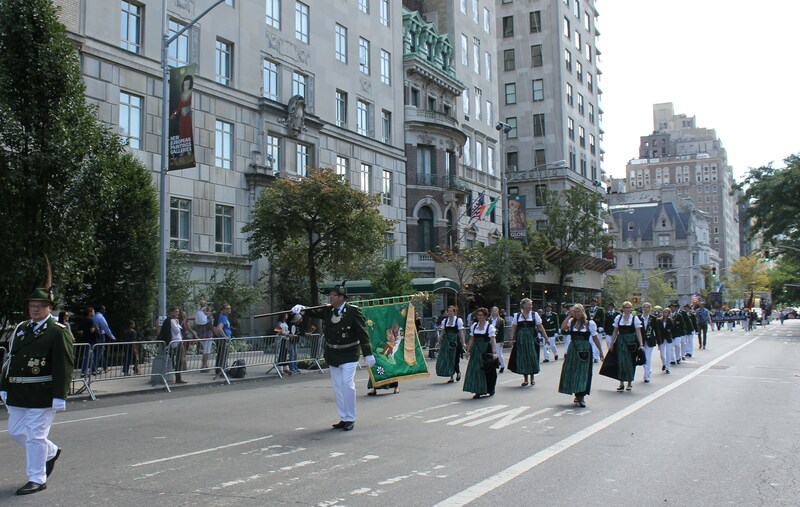 In their first year at the parade was a loud band with a chorus from Hopfingen. 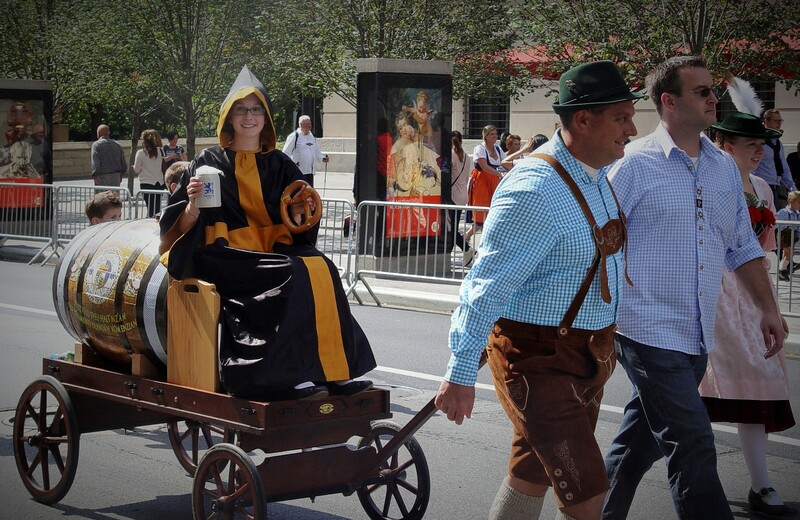 A newer darker group were the chimney sweepers but their gloominess was quickly chased by what else …another beer float. 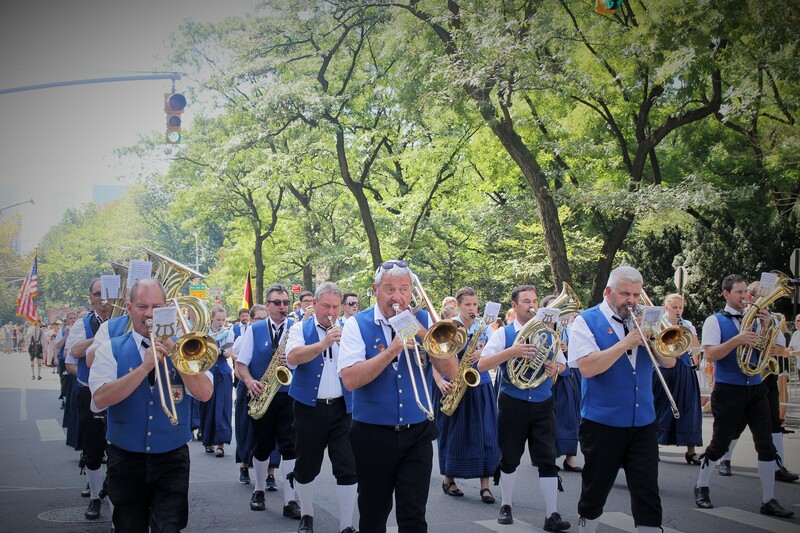 By far the best band to play were actually two bands from Shutzen and Musikzug Sudsauerland. 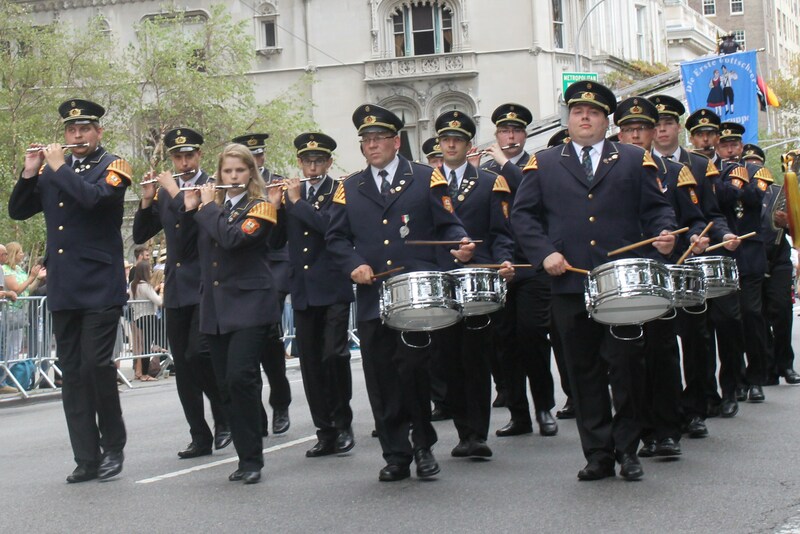 When the first band finished playing their tune, the second band followed right in step. 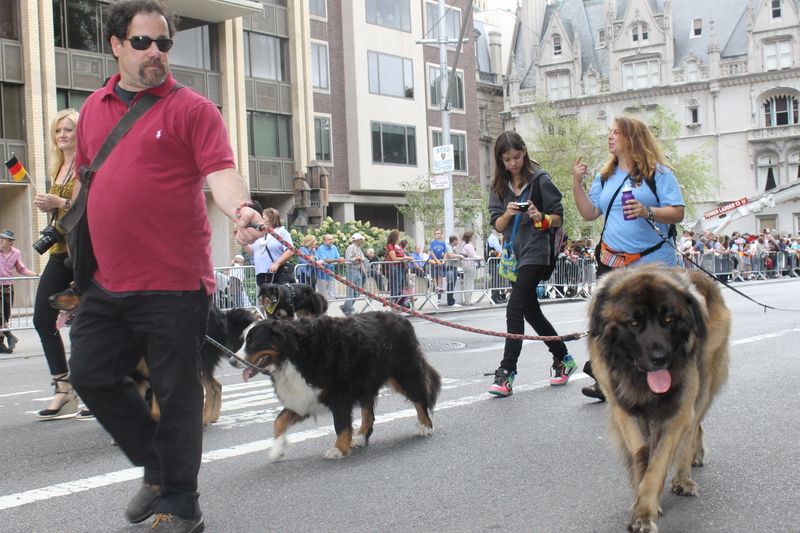 They were a special treat for all the parade revelers. 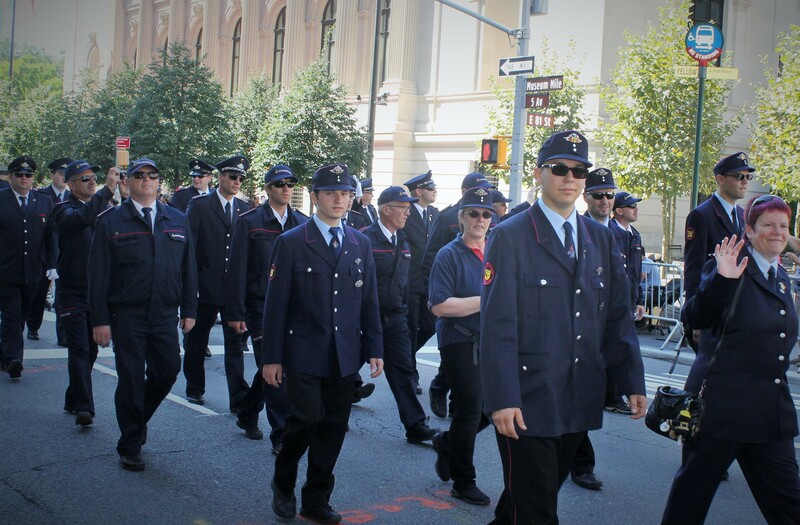 It was great to see a kindred spirit between German police and firefighters shared with NY’s Finest and Bravest. 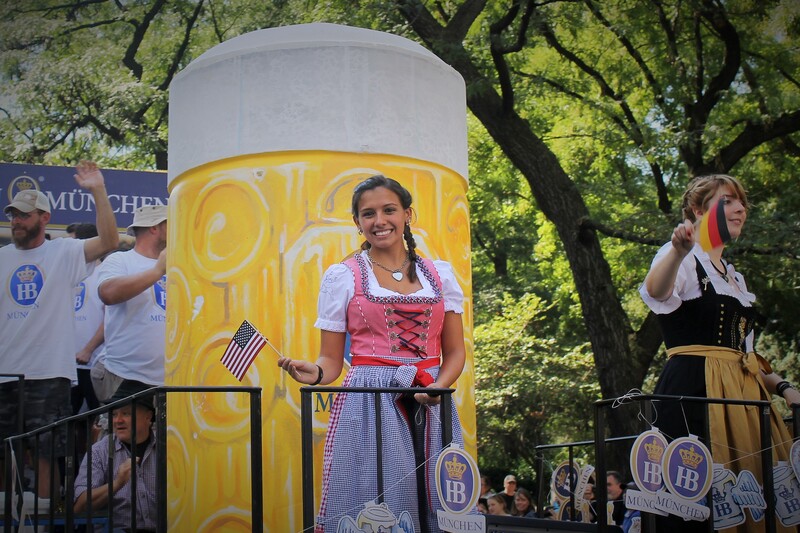 All in all it was a fun parade to attend and the marchers made their way into Central Park for Oktoberfest where there were more live bands, lots of dancing and what else….more beer. 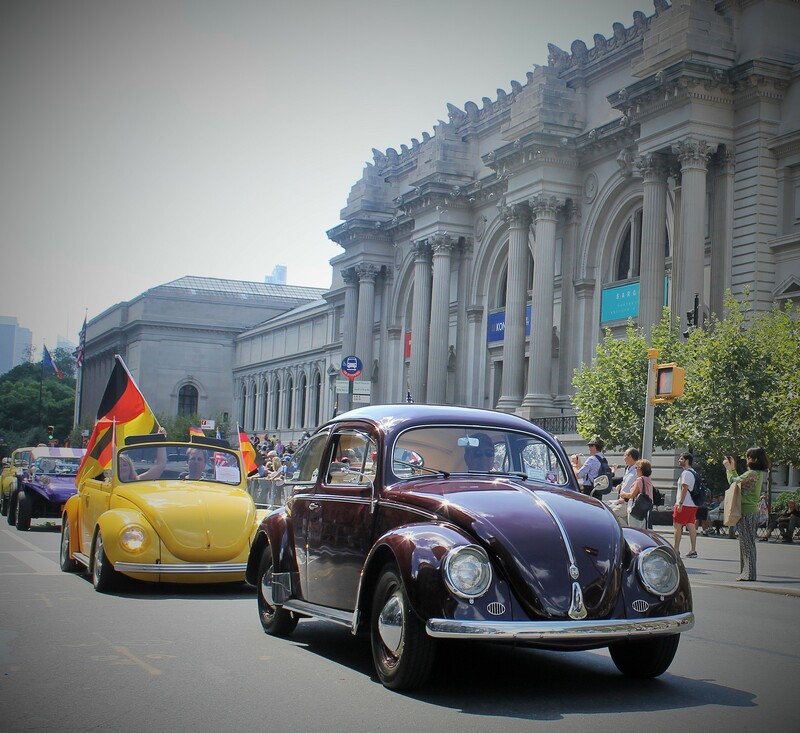 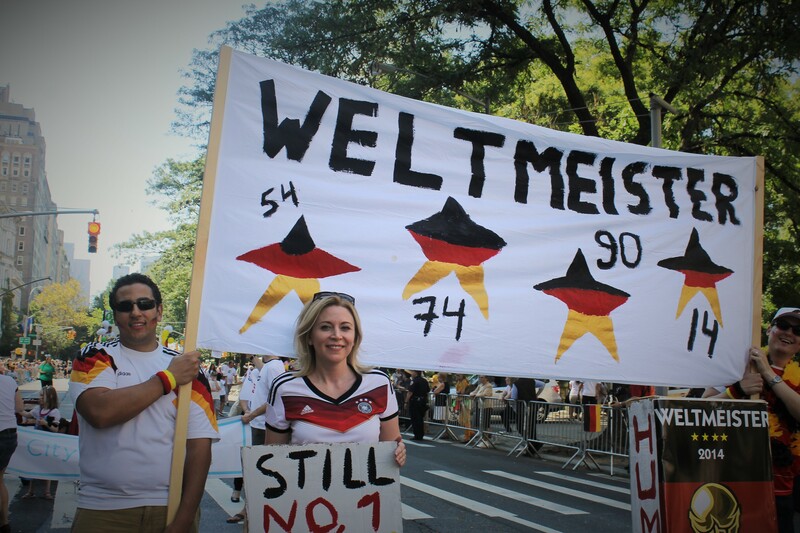 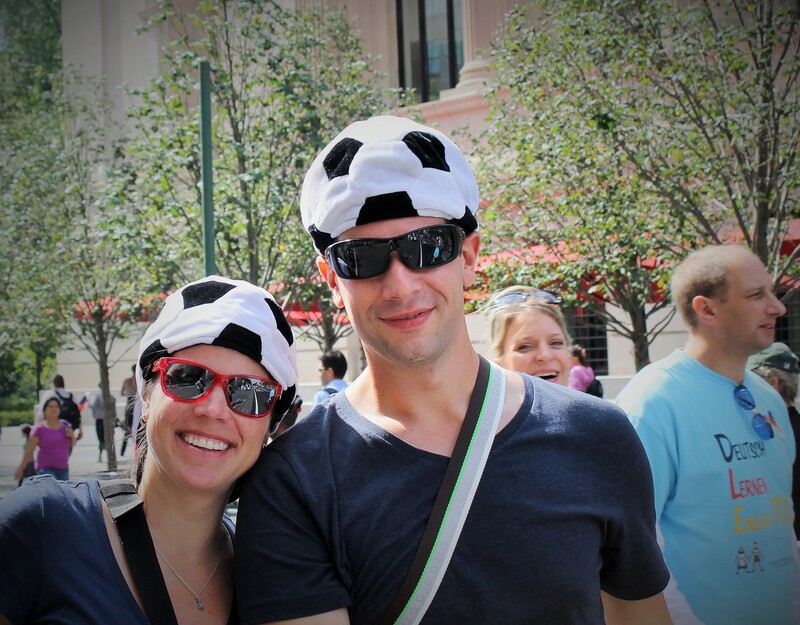 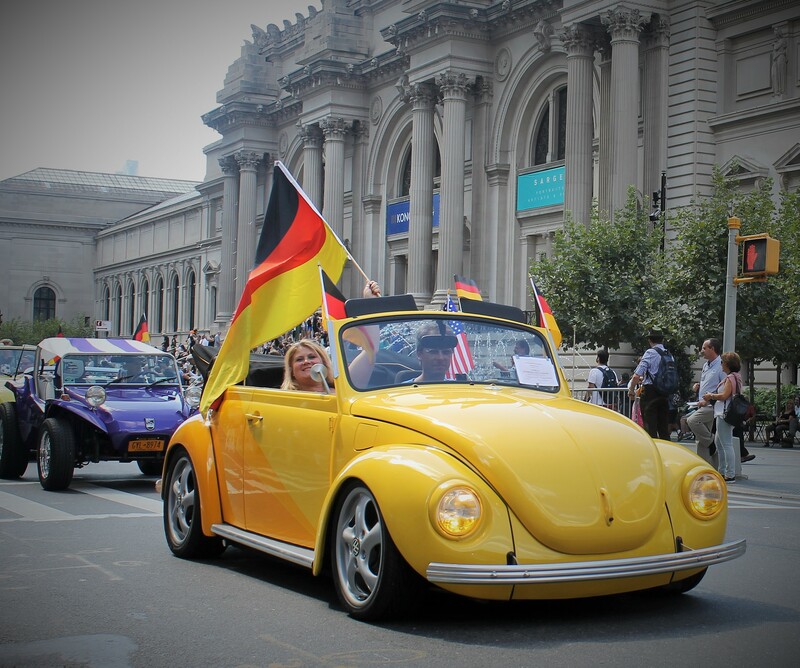 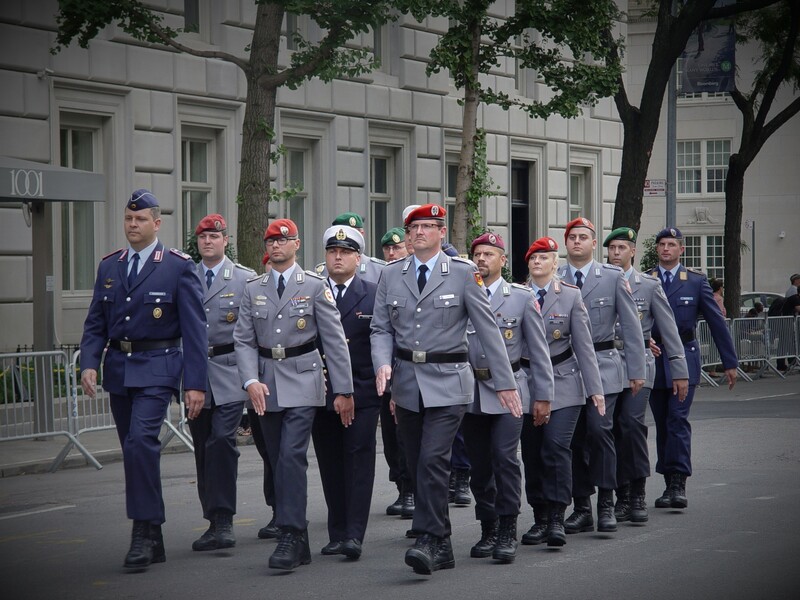 Fresh off their dramatic World Cup victory, the Germans that came to NYC to participate in the 57th annual Steuben parade on 5th Ave. were still riding high with the fever of a big win. 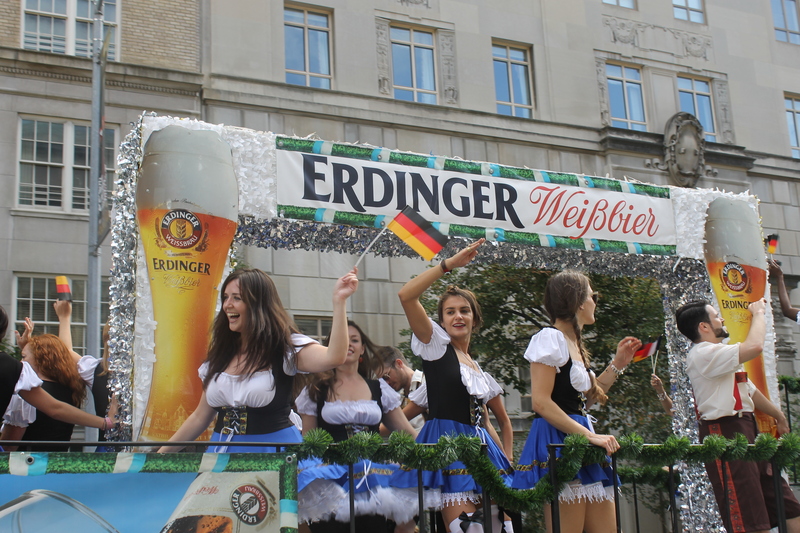 The parade typically kicks off the fall season with a display of traditional dress (and beer), some well seasoned German marching bands (and beer), and revelers dressed in the German Karneval costumes (and did I mention beer). 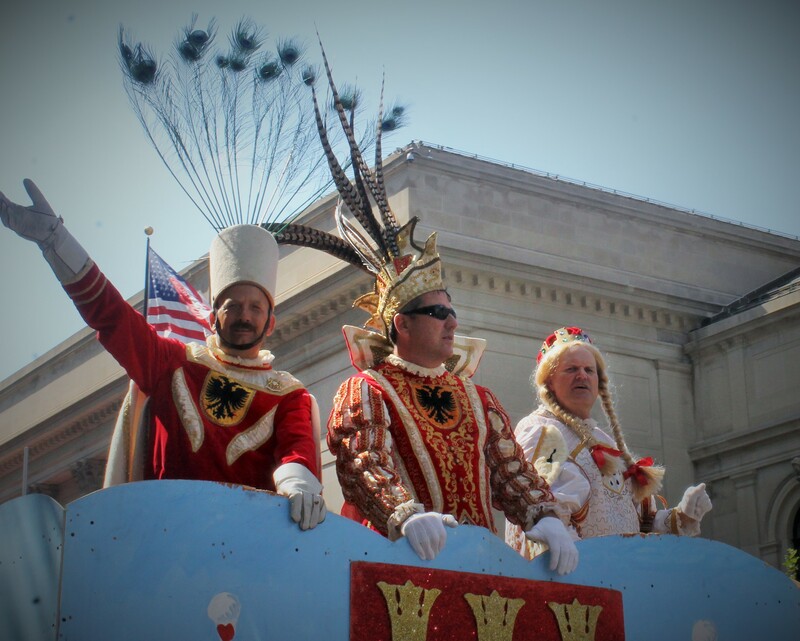 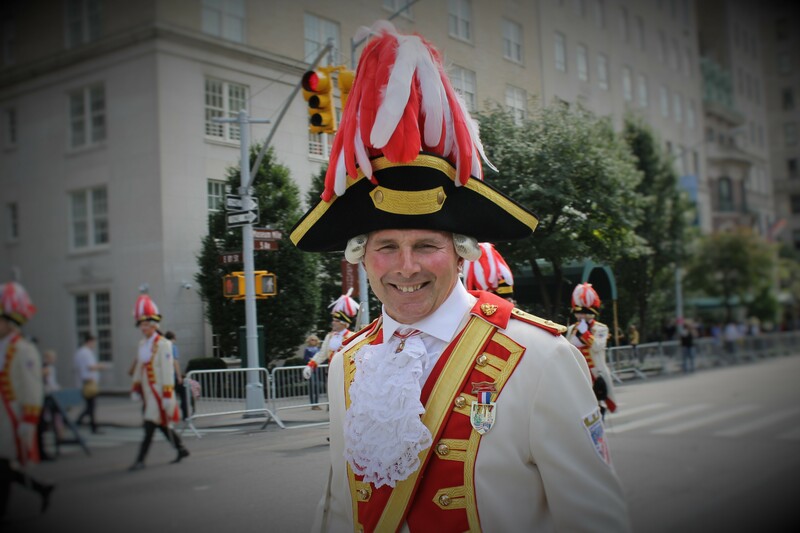 The parade traditionally is a tribute to Baron von Steuben, the Prussian General responsible for training the first Army during the Revolutionary War. 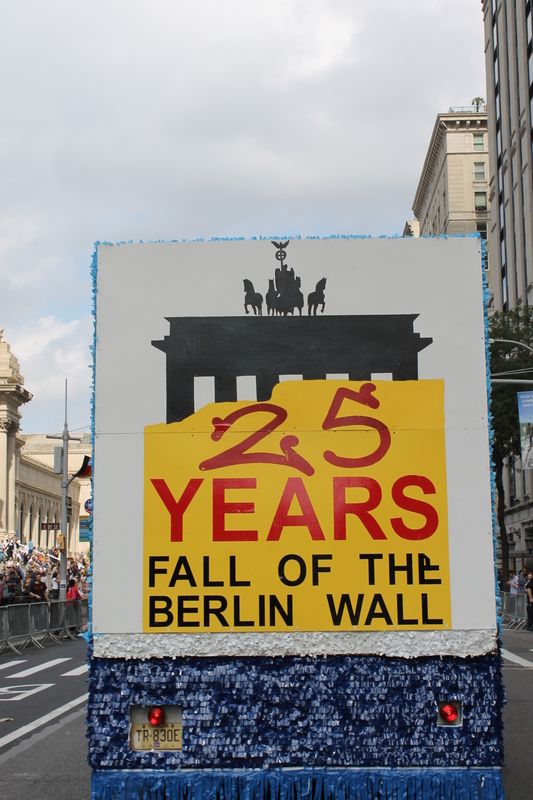 But it has morphed into a display of fine German culture and tradition including many youth celebrating the 25th anniversary of the fall of the Berlin Wall. 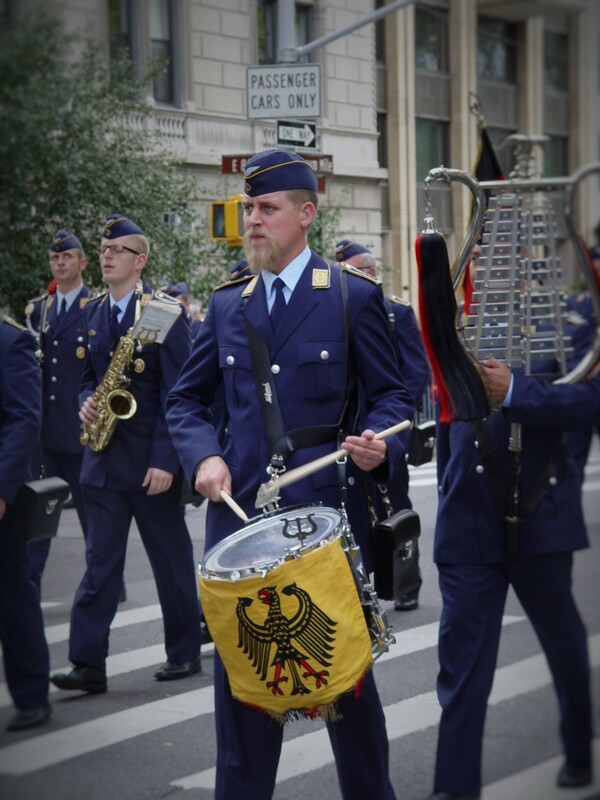 With over 20 marching bands shipped in from Germany to march in the parade, the crowd was sure to be treated to some good marching tunes. 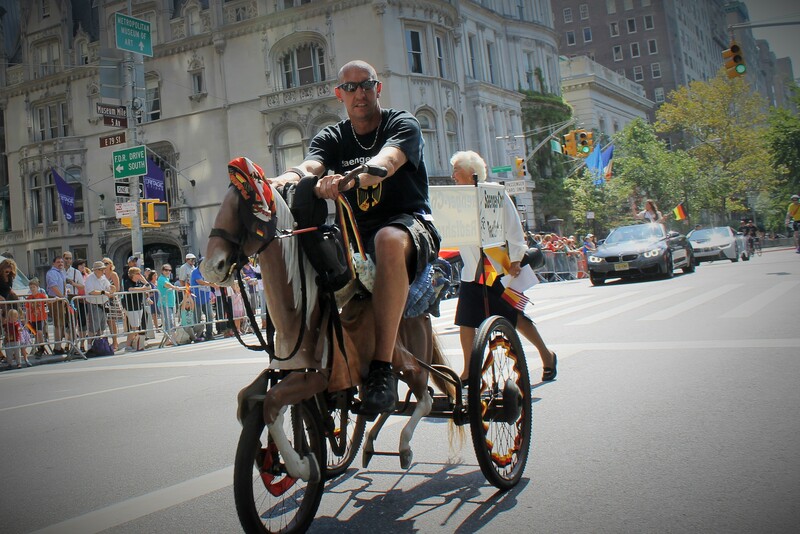 As usual the mounted police signaled the start of the parade followed by one of the marching bands. 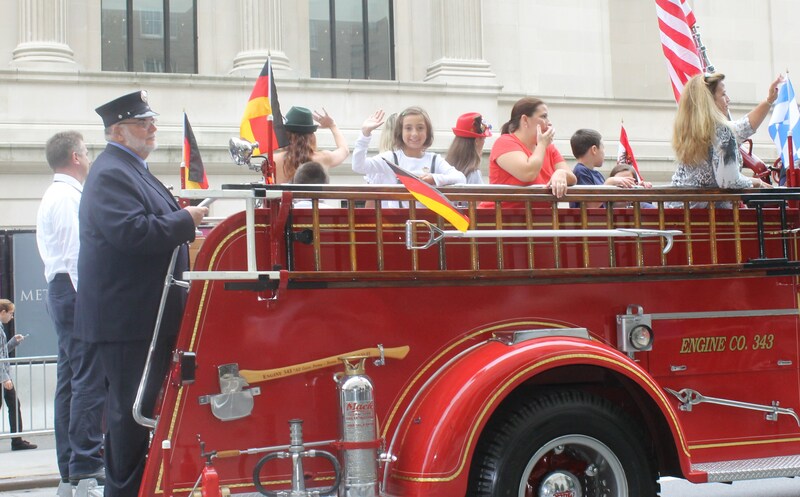 It was great to see representatives from both the German police and fire departments sharing some special moments with their NYC counterparts. 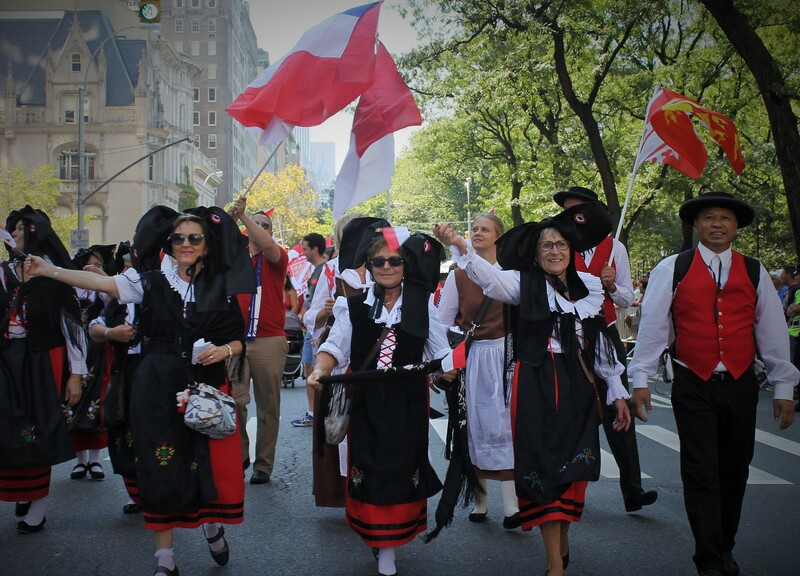 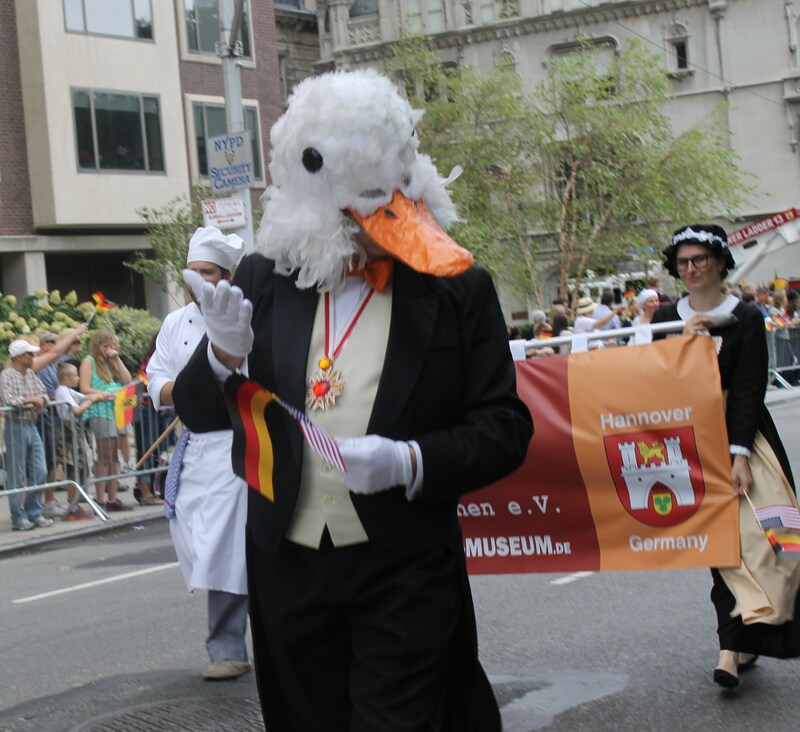 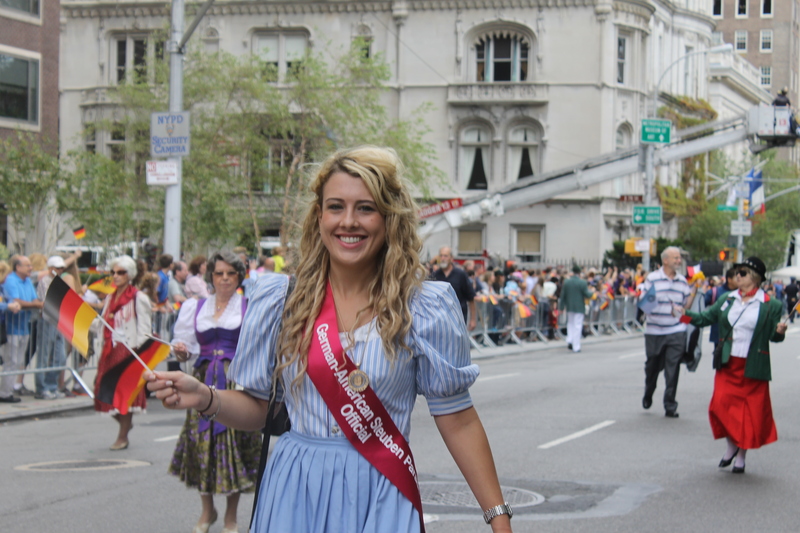 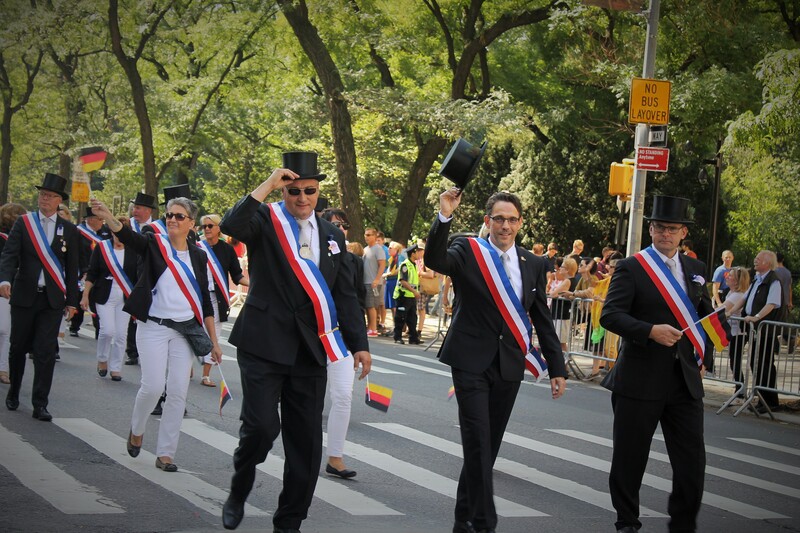 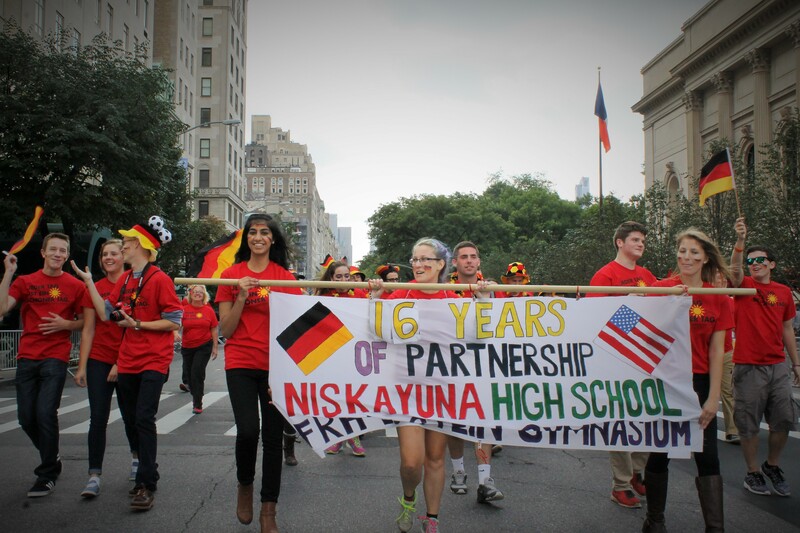 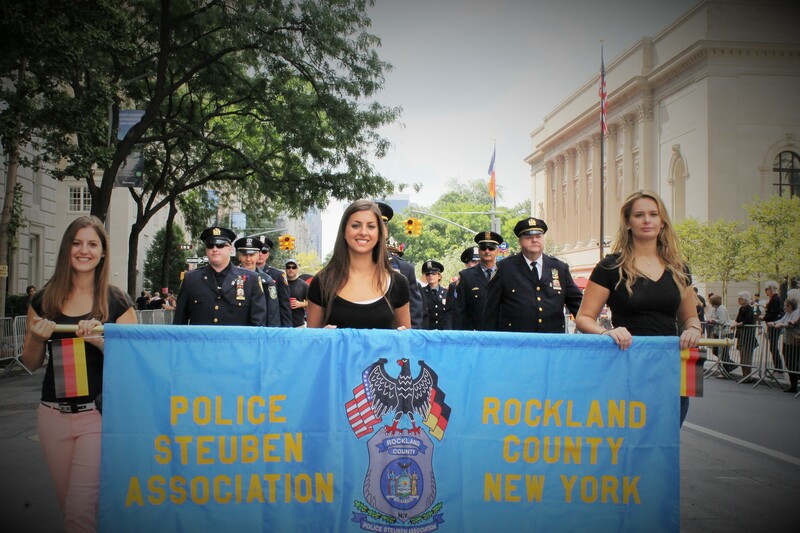 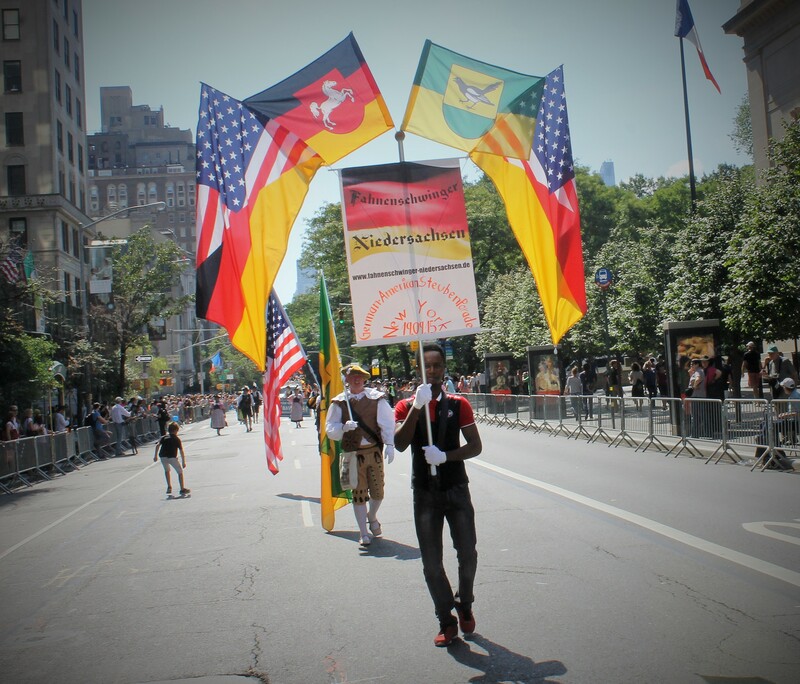 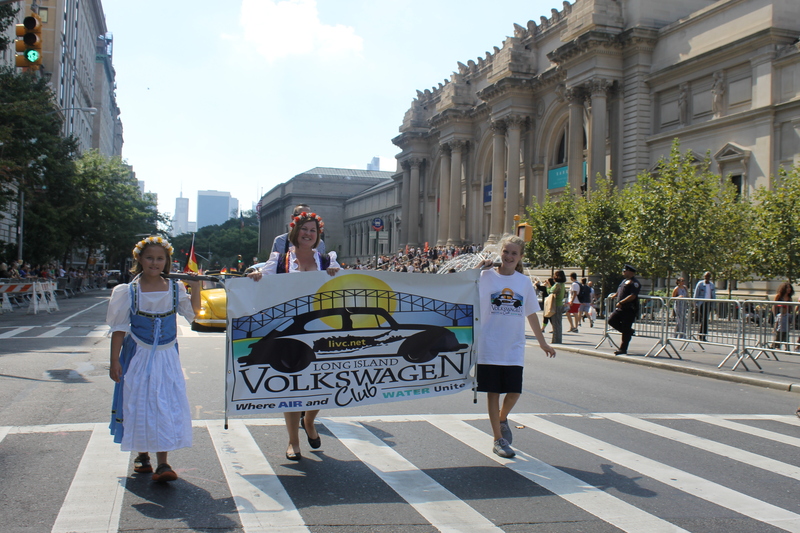 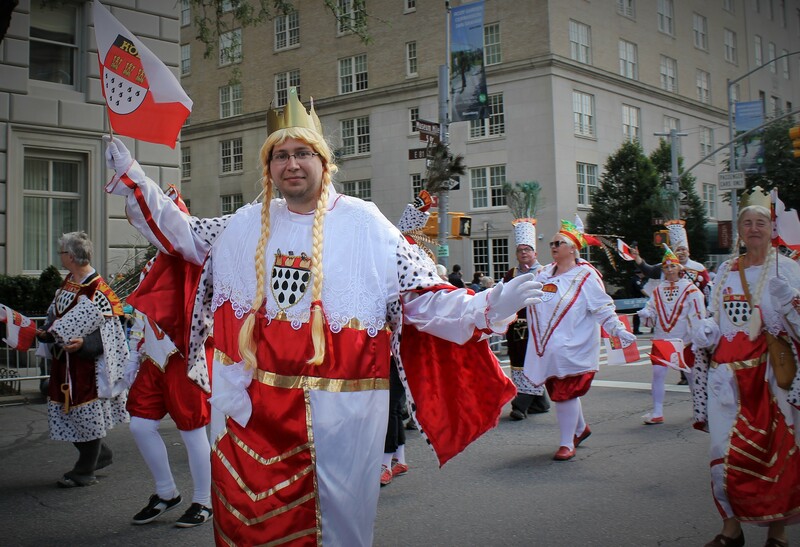 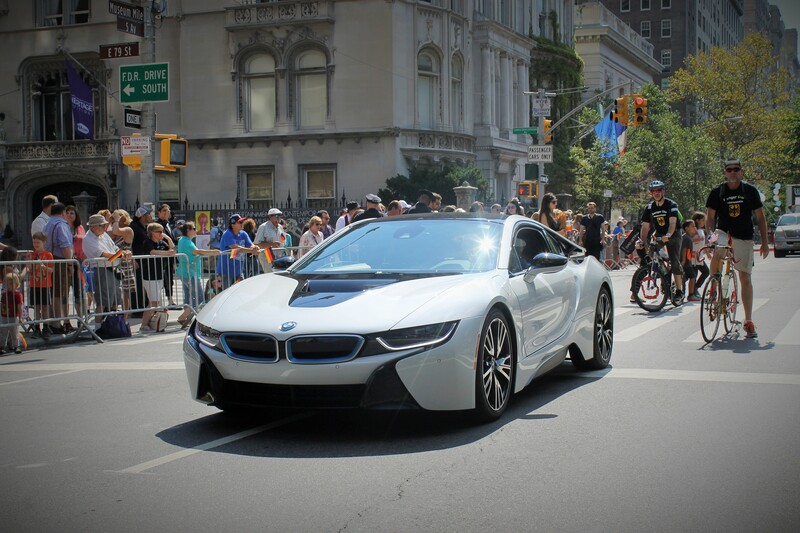 Many local German affiliated clubs and organizations marched their way up the parade route from 63rd to 86th Sts. 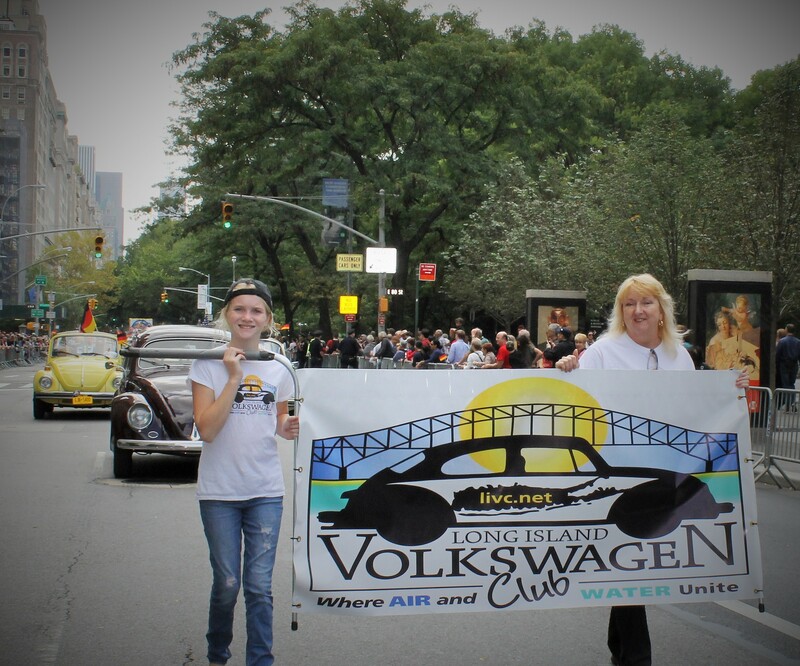 including a crowd favorite, the Long Island Volkswagon Club. 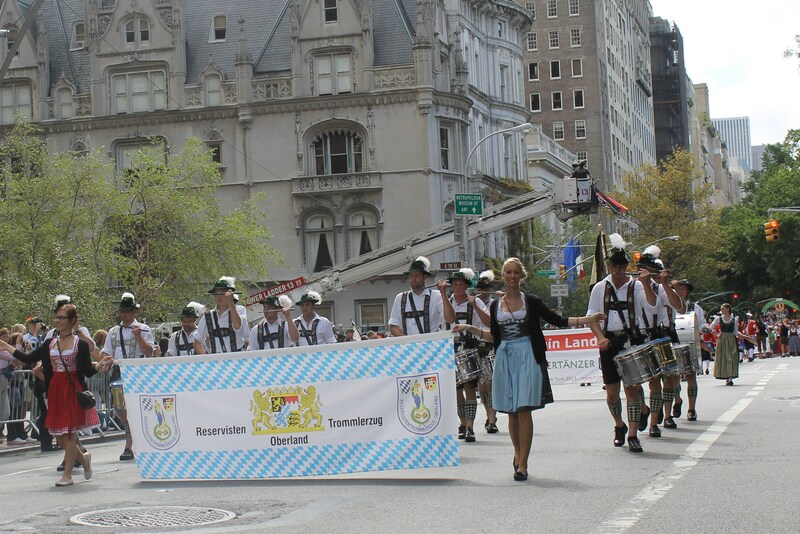 It’s always great to see the German marching bands and compare them to some US High School marching bands. 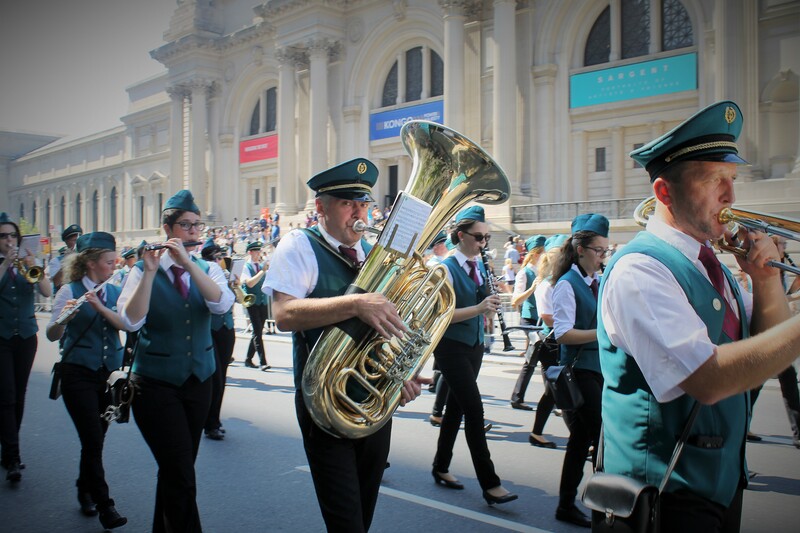 One of the more notable bands came from Nienborg and played a loud brass filled tune while the marching band from Ebersberg was more airy with flutes and chimes. 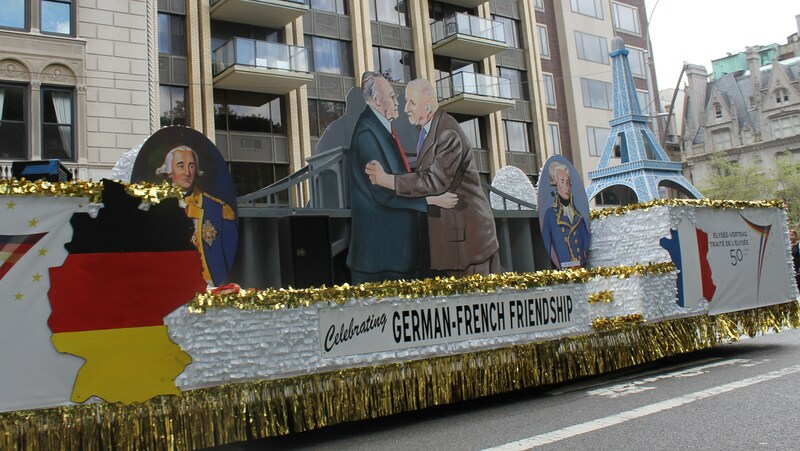 Both were a treat to see and hear. 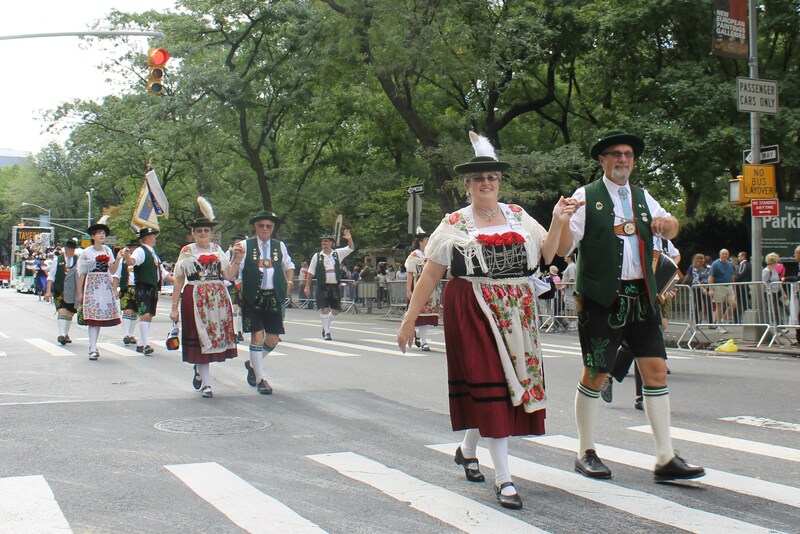 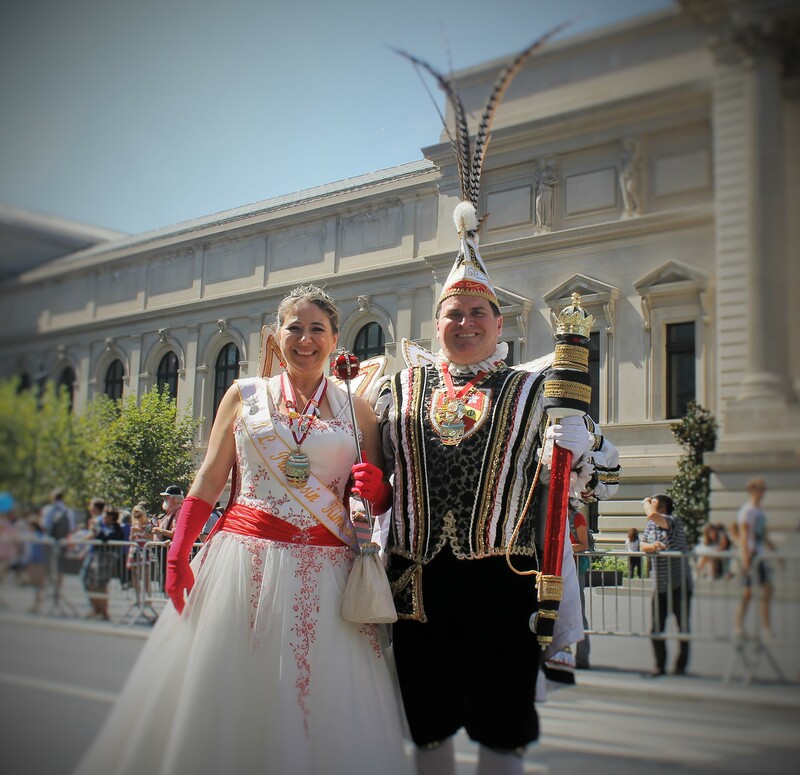 A perennial crowd favorite are the karveval groups dressed in their funny costumes while some viewers enjoy the more traditional “Tracht” attire. 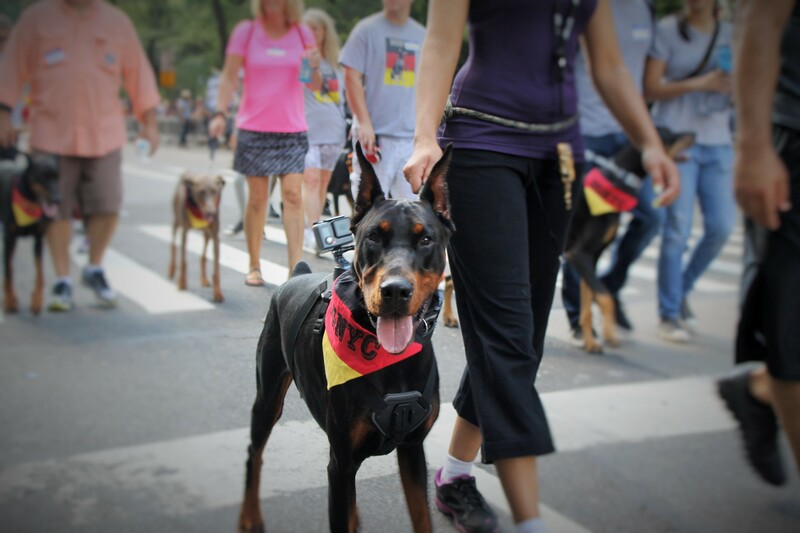 Even some dog owners got in on the parade showing off their Dobermans and Hovaworts. 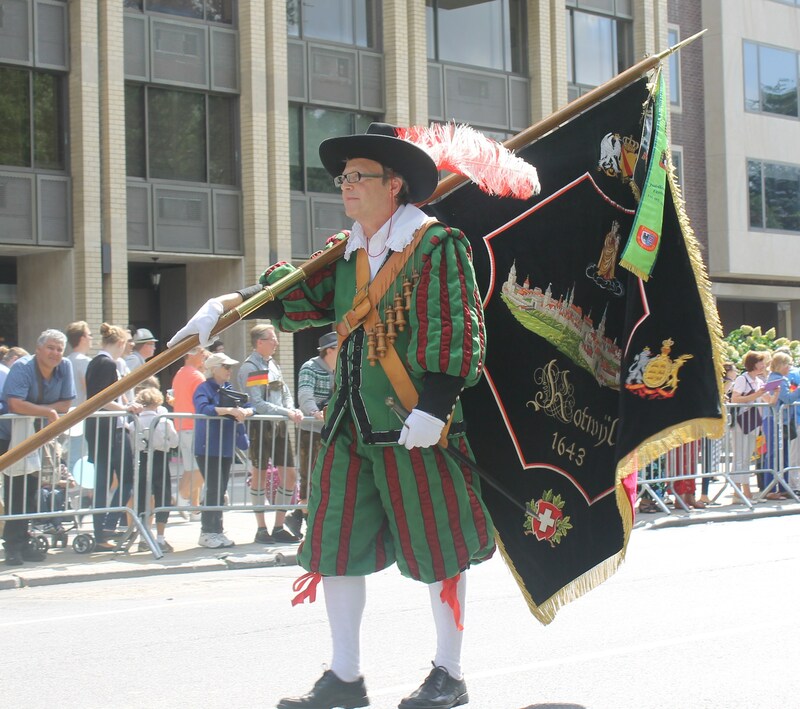 All the build up was for one of the best marching bands the city has seen this year as the Schutzenkapelle Holzheim marching band made their way up he parade route. 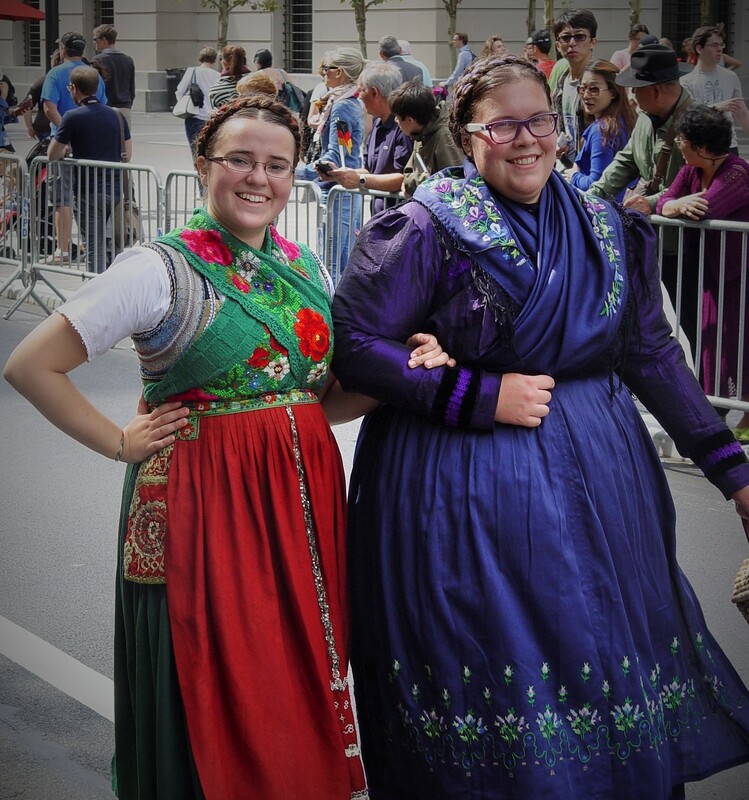 It’s always great to see the tradition passed on from one generation to another and to see the youth embrace traditions passed on from the Motherland. 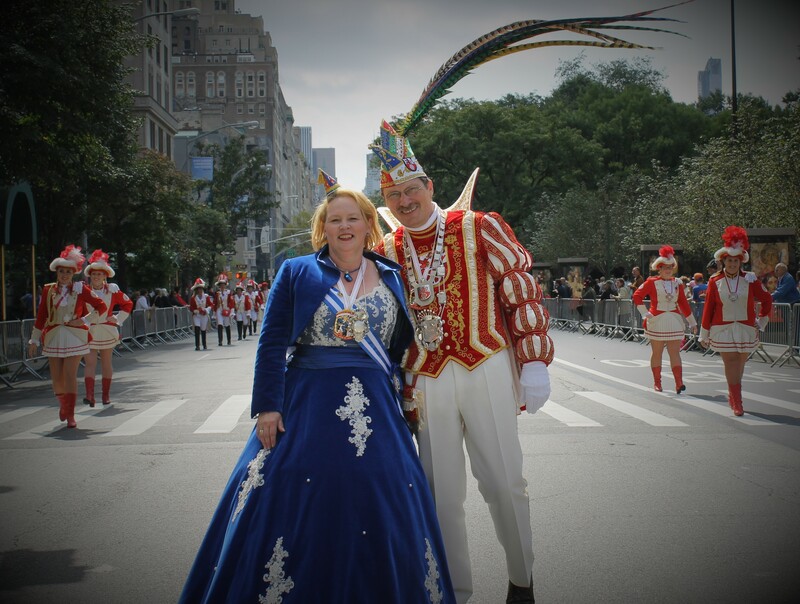 Although the parade was shorter than previous years and missing a crowd favorite, the maypole, it was still a fun parade to be part of. 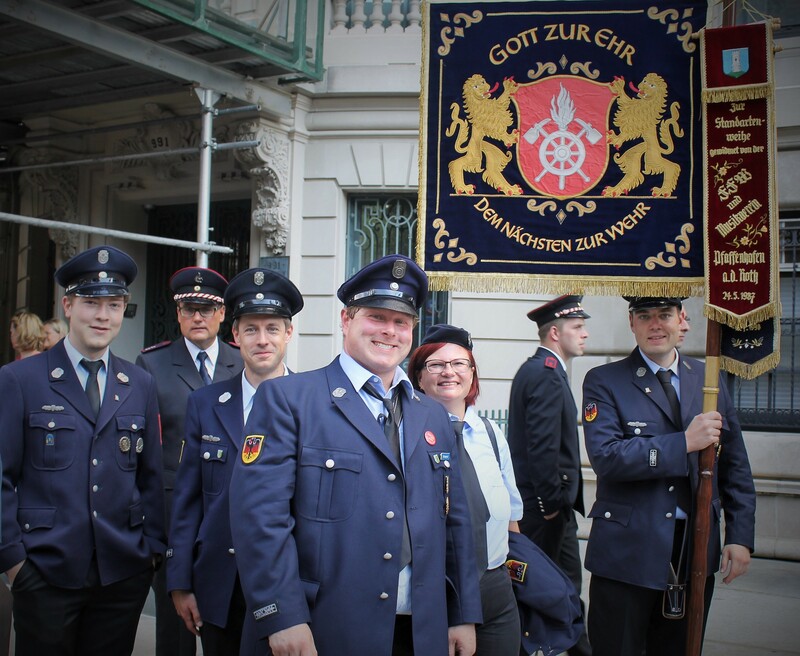 Sehen Sie im nachsten jahr. 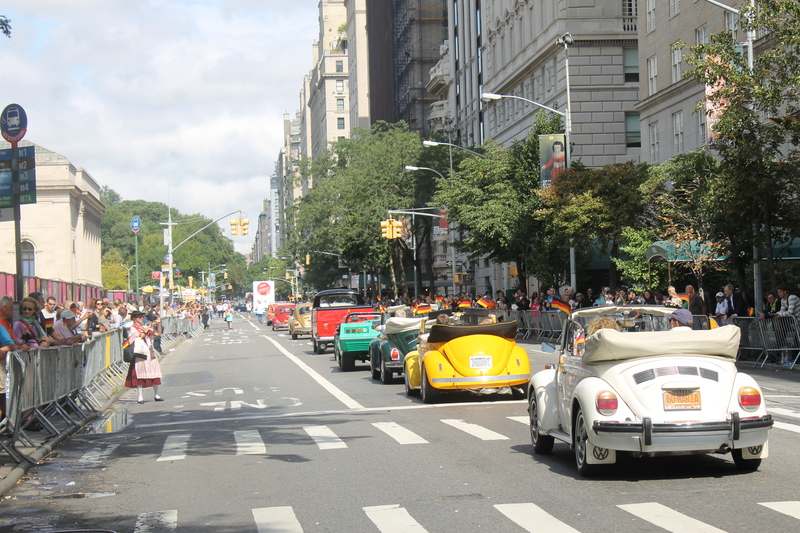 The end of summer in the city usually means an end to a busy season and ushering in the start of the fall months. 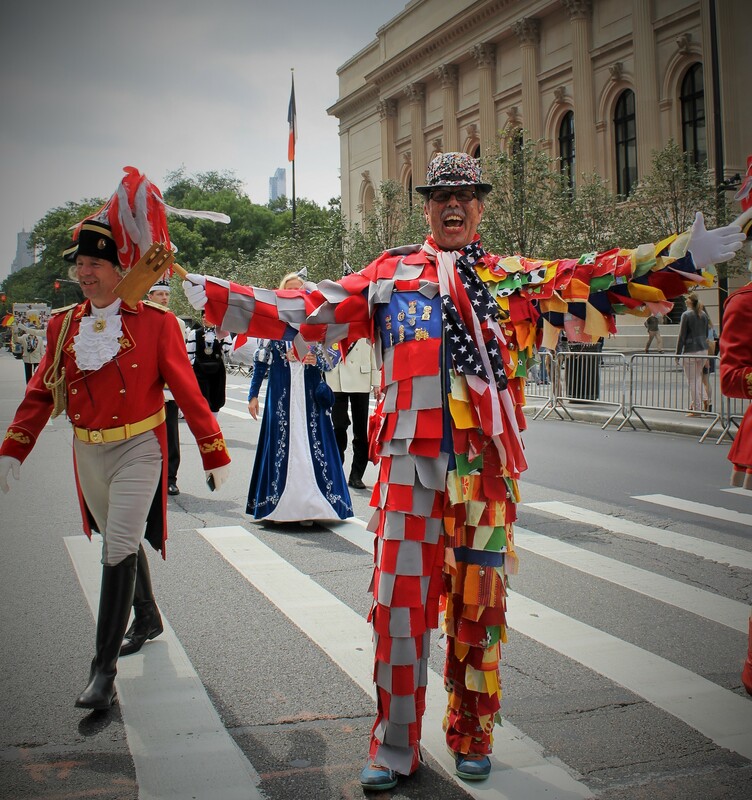 A chill in the air and brisk wind certainly made the day feel as it was mid October and it may have added to the excitement building up on 5th Ave. and 49th St. where the 55th annual Steuben Parade was getting ready to kick off. 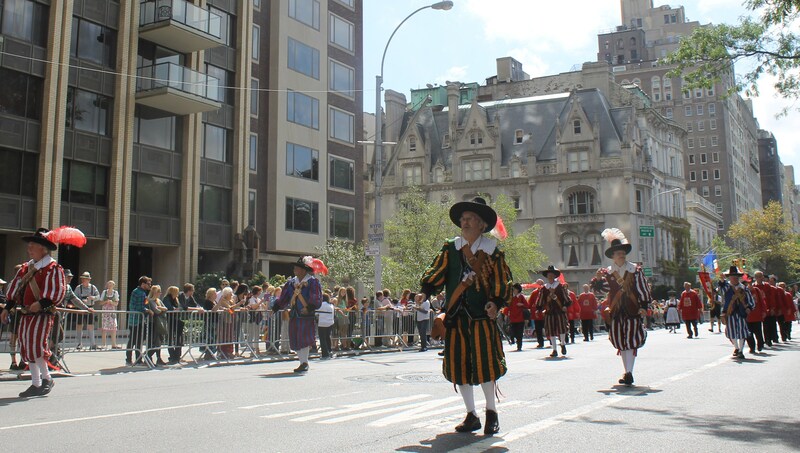 The parade culminates a week-long of festivities all throughout the city. 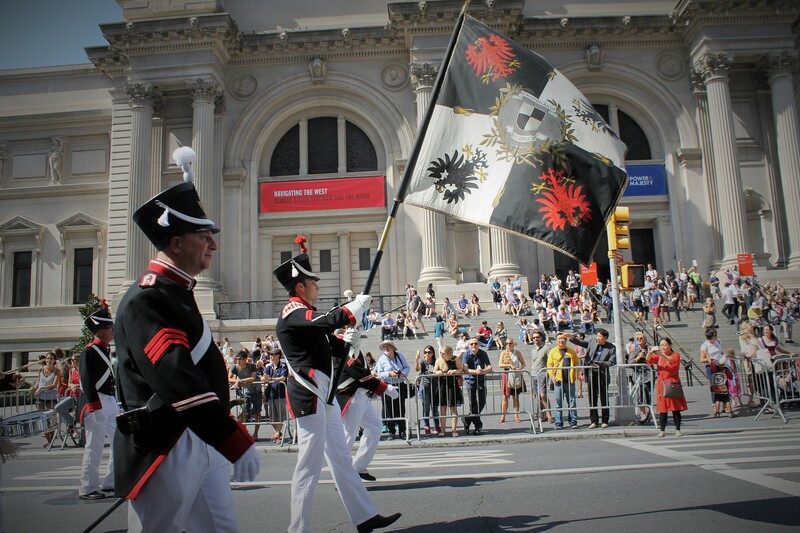 As I was waiting for the parade to make its way up to 79th St. by the reviewing stand, a bystander asked why it was the German Parade and not the Italian or Irish Parade..ugghhh…newbie… so I had to explain the parade is to honor German culture but more importantly to remember the contributions of General Friedrich Wilhelm von Steuben to the young nation of America. 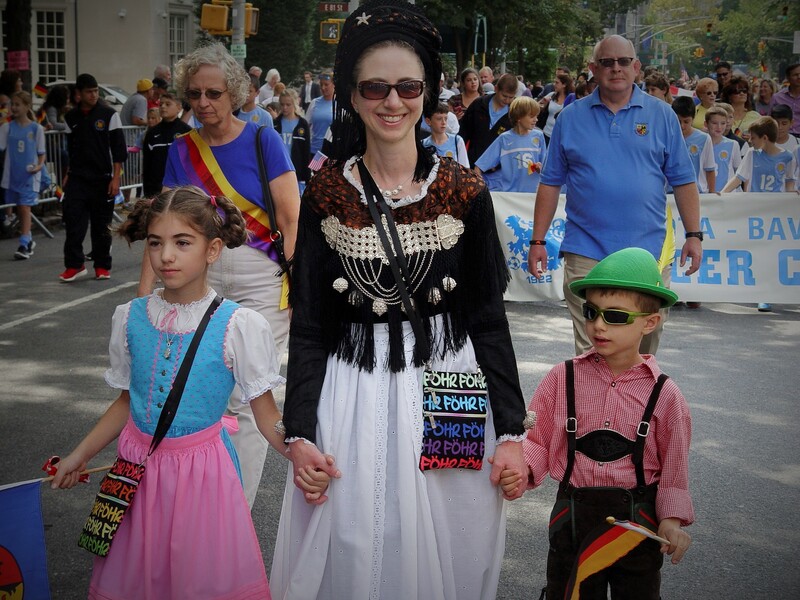 What surprised me even more was the young that asked was of German heritage and didn’t know about Steuben. 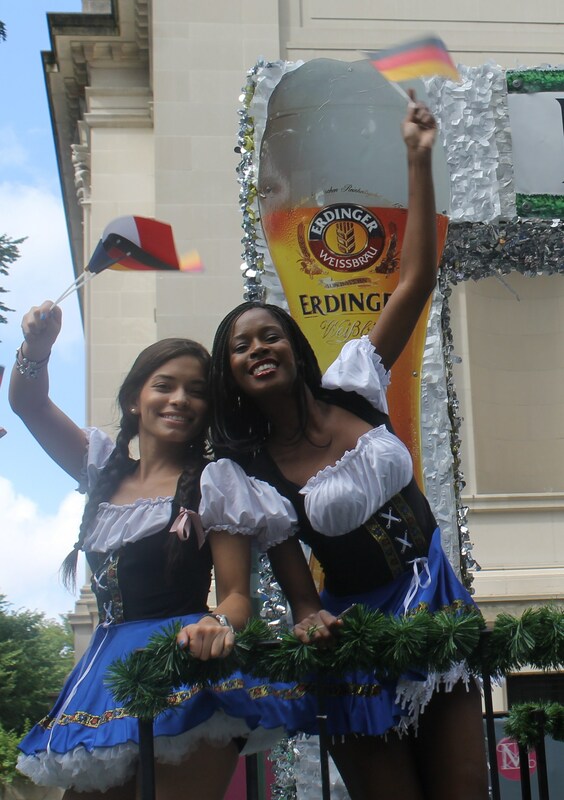 I told her to stick around because the German bands that come in to perform are really good and might remind her of the Motherland. 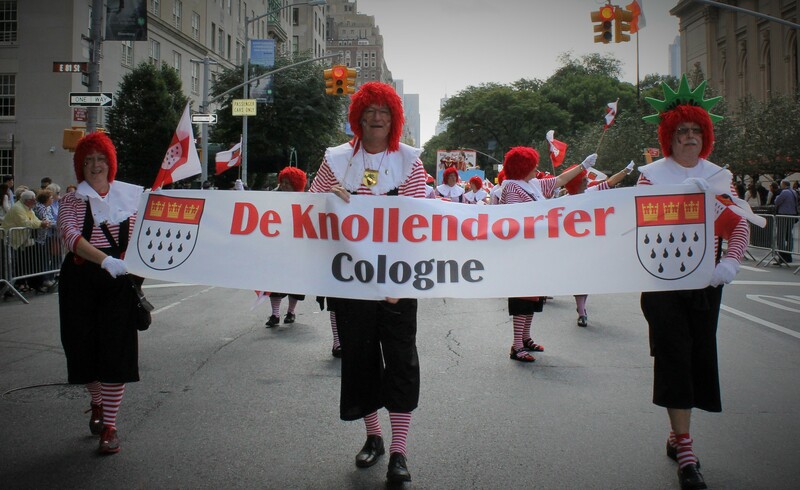 After the honorable Mayor Bloomberg marched on by with parade organizers and dignitaries, the first of the German bands appeared in Fueuerwerkapelle Vorden. 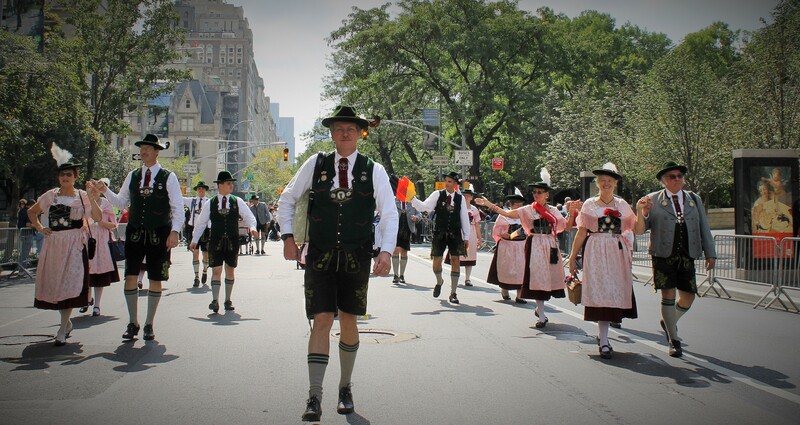 They were very good but not to be outdone by the band from Wurrtemberg. 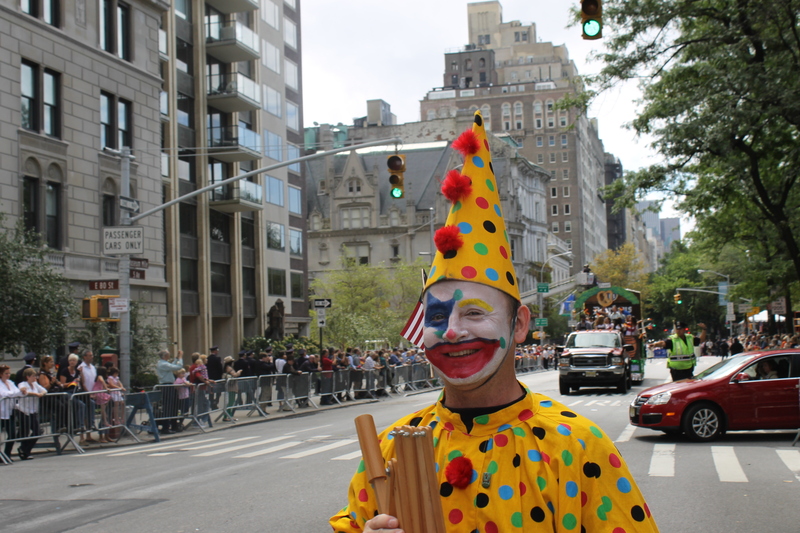 Every parade has a life of its own and some are more subdued than others. 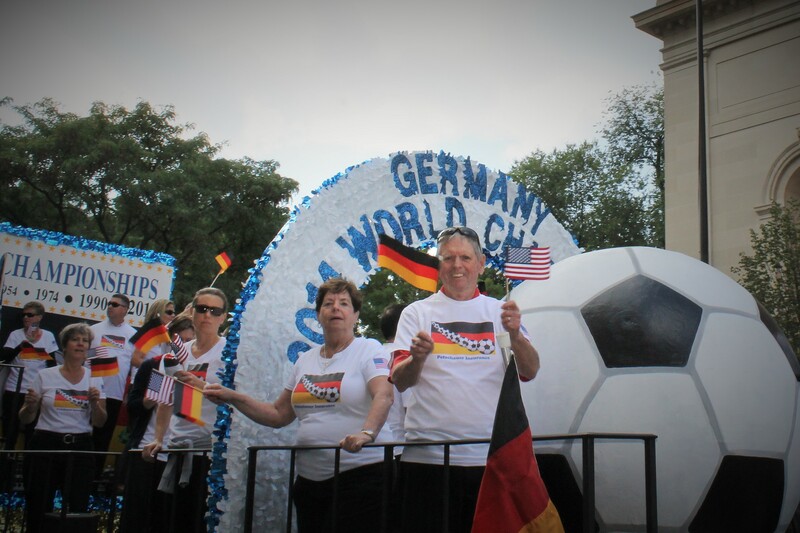 The Germans tend to politely applaud the marching bands and costumed marchers. 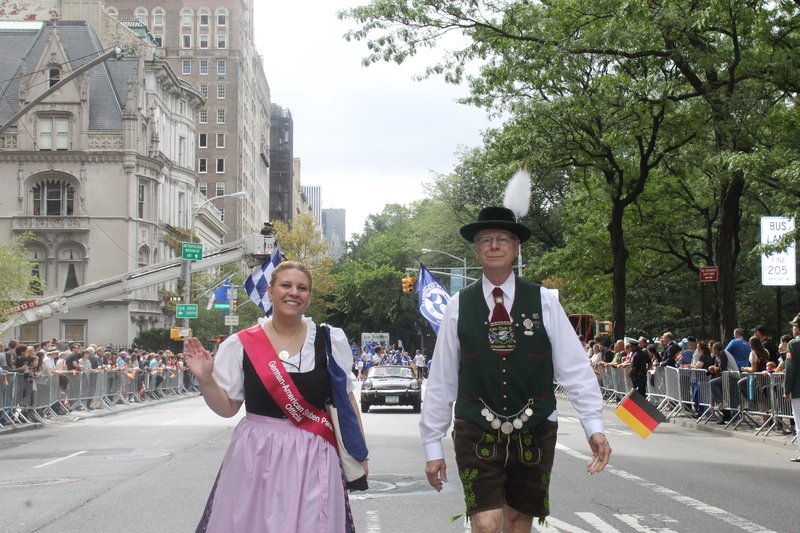 Once in a while someone will yodel and get a nice response from the crowd. 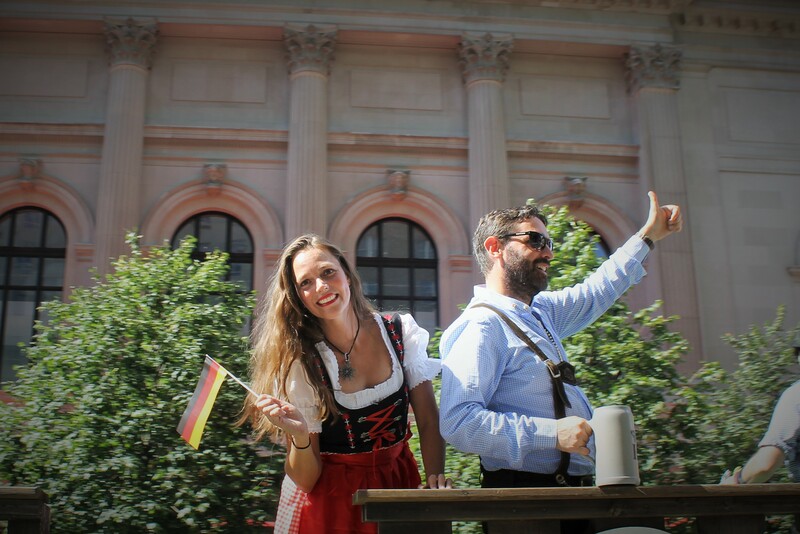 One of the more lively floats was from Zum Stammtisch with a fun song for folks to clap their hands to and get pumped up. 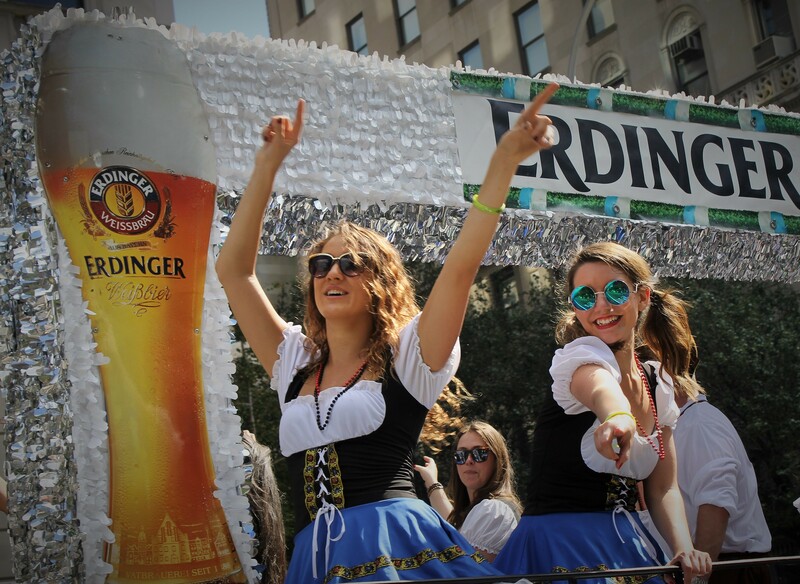 The timing could not have been any better because they were followed by a float of lovely ladies and beer…nice combination. 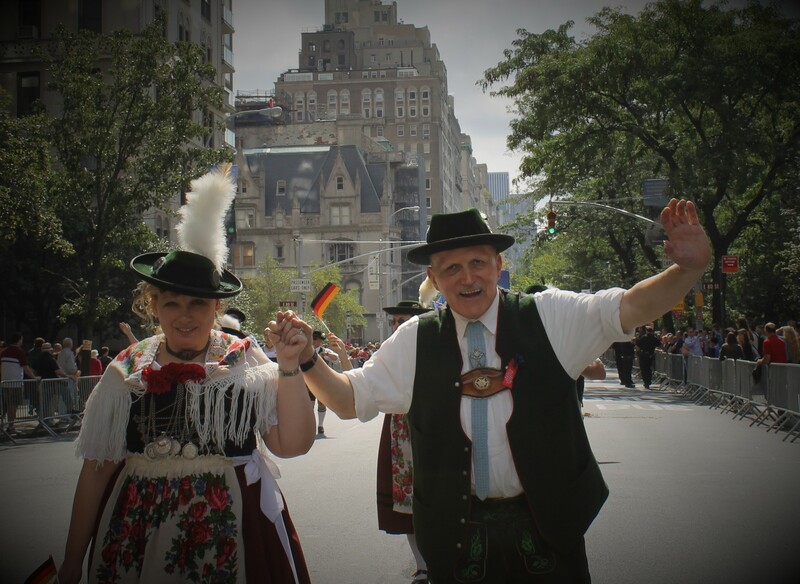 Speaking of combinations, the crowd was treated to a German band from Melle and a visiting band from Missouri called New Melle. 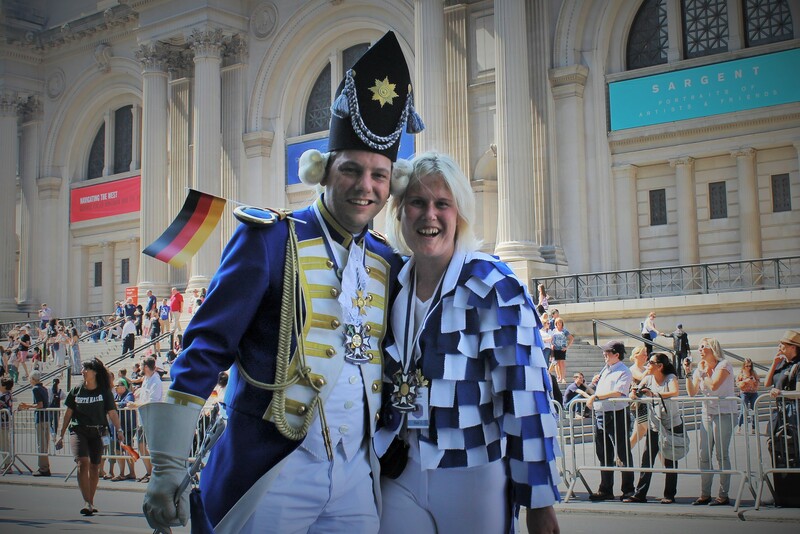 One of the best costumed marchers from the Revolutionary Era were the Ehrengarde Marching band soon followed by another German band from Bakum. 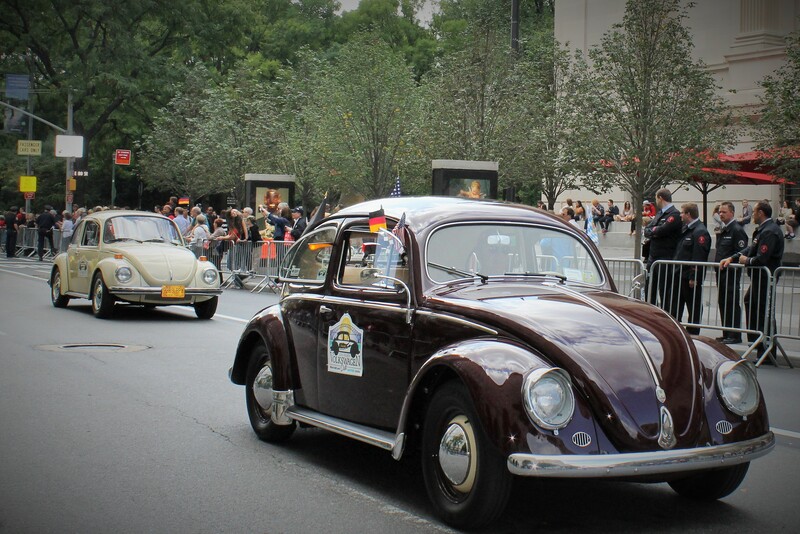 A crowd favorite is the Volkswagon Club from Long Island with their classic Beetle. 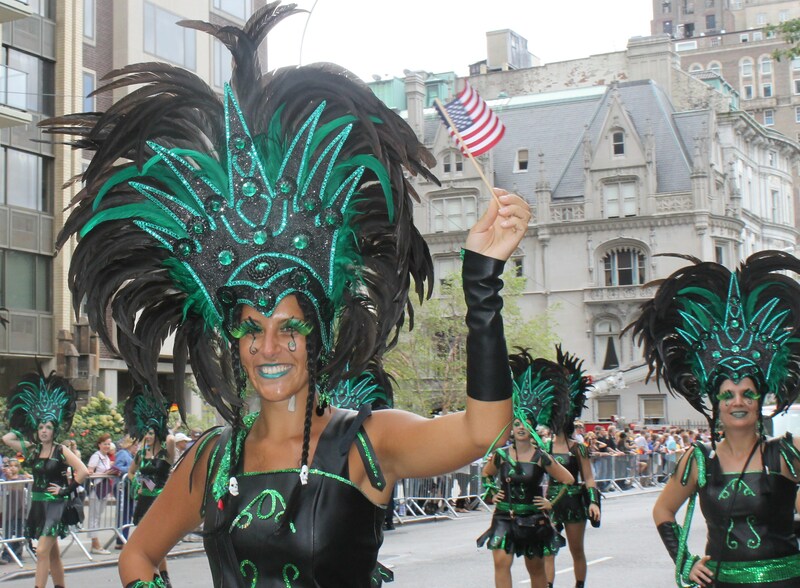 A new participant to the parade was the Aqua Marching band from Philadelphia with their crazy costumes and happy songs that got the crowd worked up. 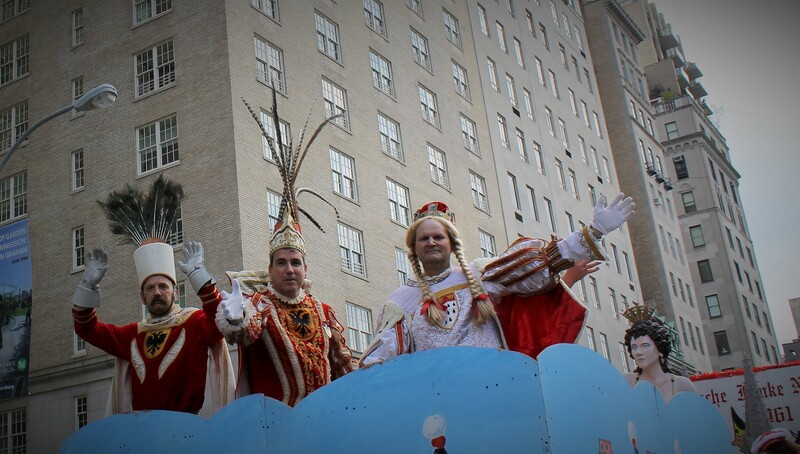 Hope they return next year as they were a special treat. 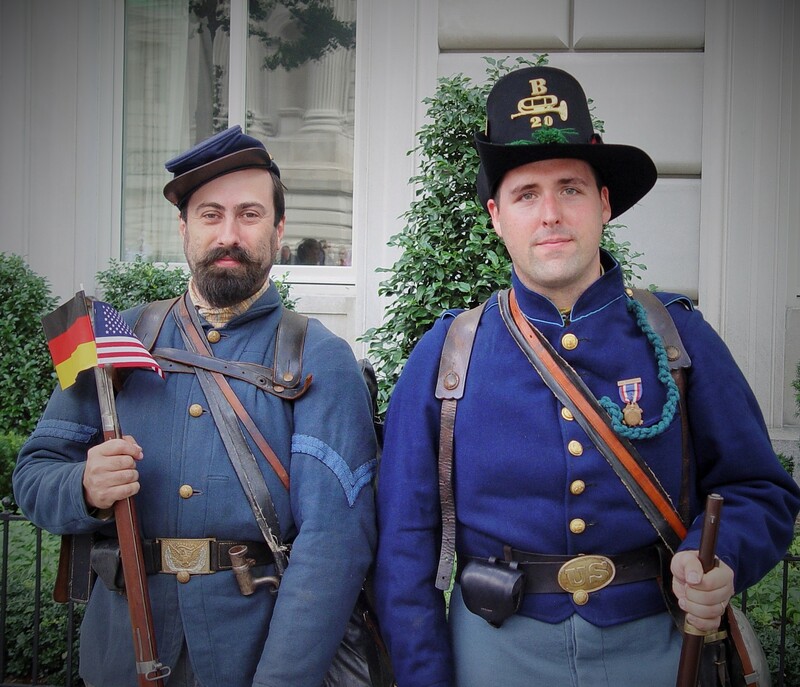 A group that makes heads turn all the time are the winners of the longest beards and mustaches. 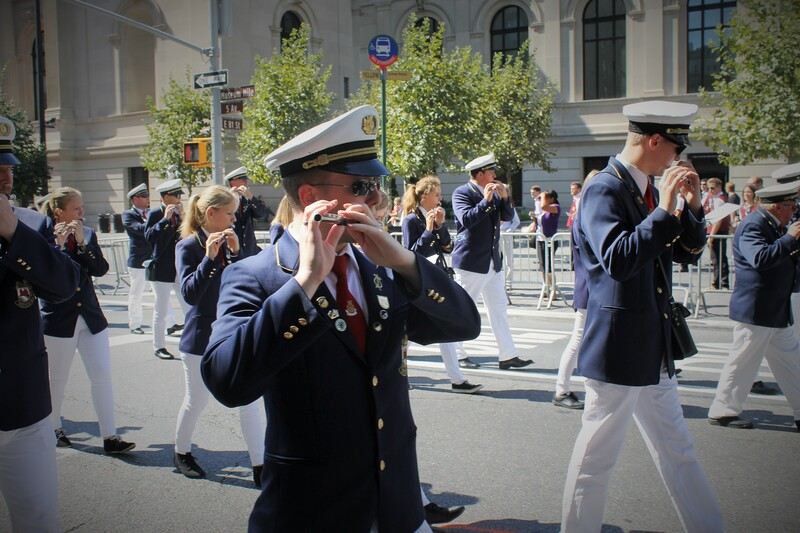 Saving the best band for last were the band from Florsheim. 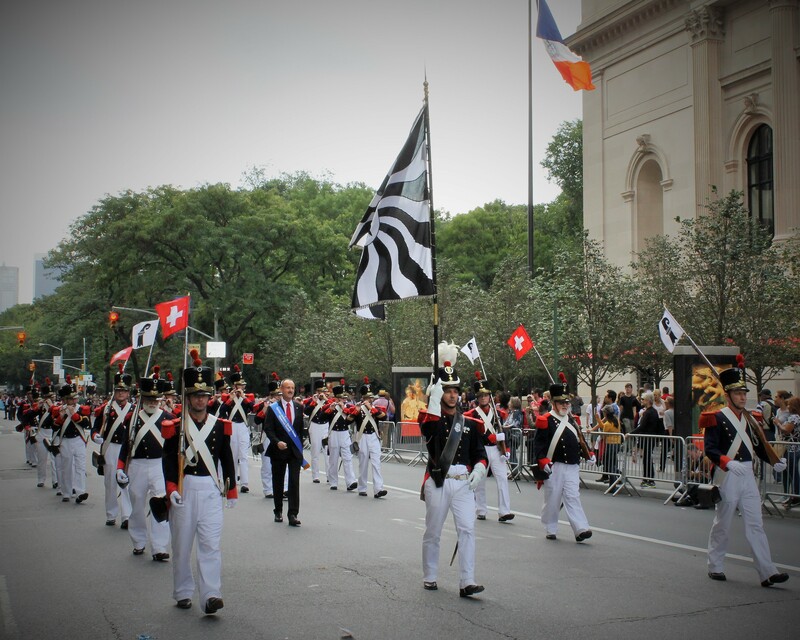 They were the creme de la creme and showed everyone why they were the best band at the parade. 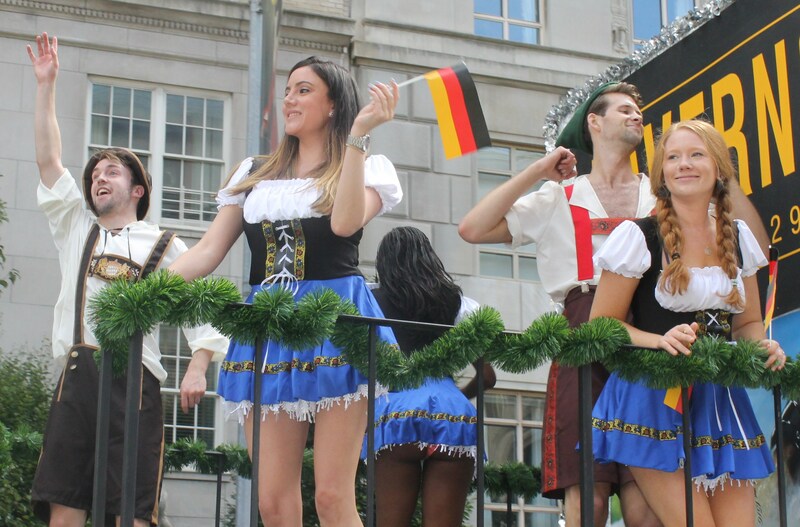 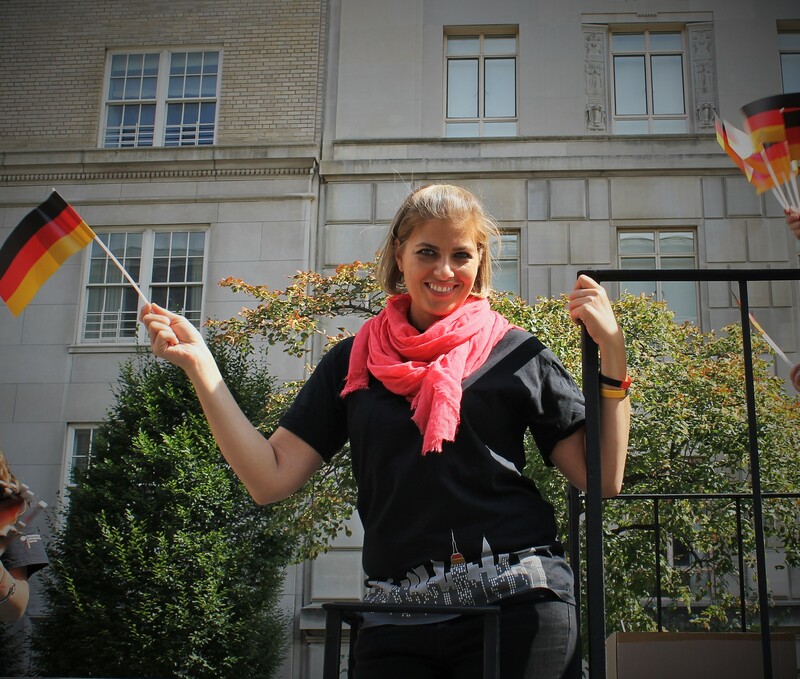 All in all it was a fun parade with a fine display of German culture, music and costume. 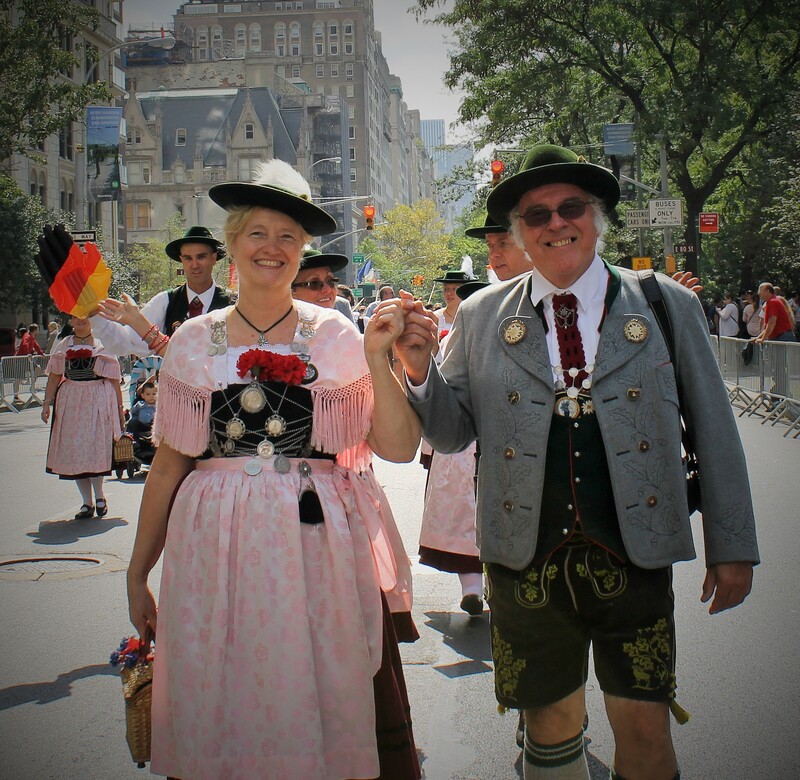 Most of the crowd gathered in Central Park for the annual Oktoberfest and drink lots of beer and eat and dance their tails off for some fun times.